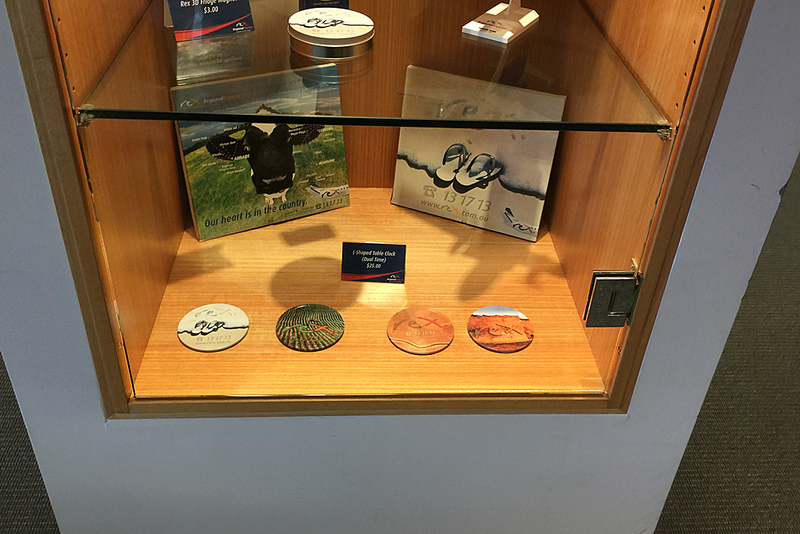 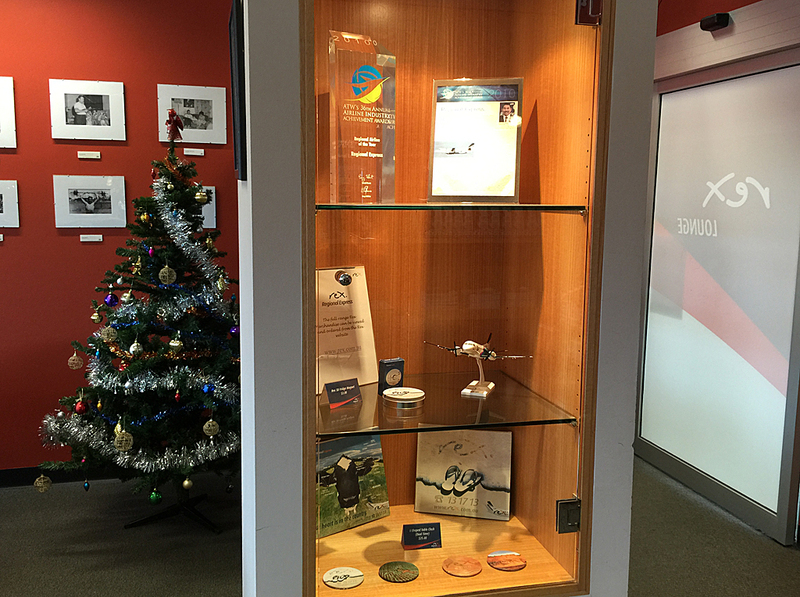 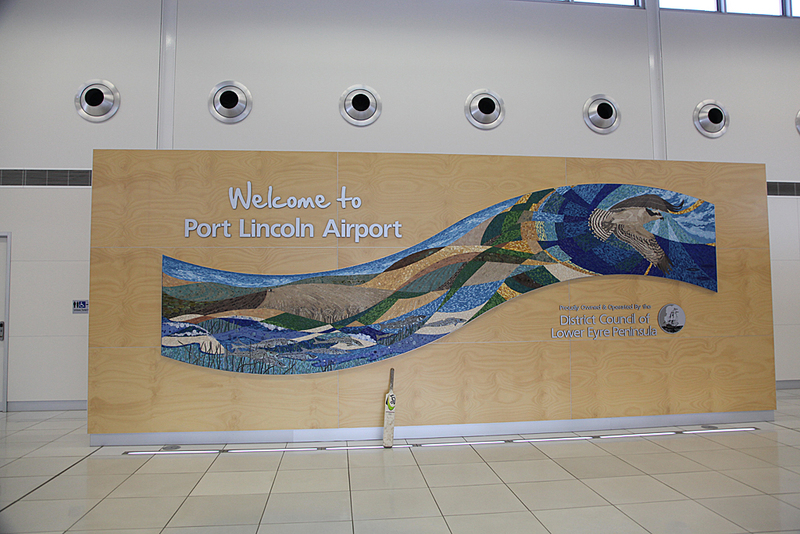 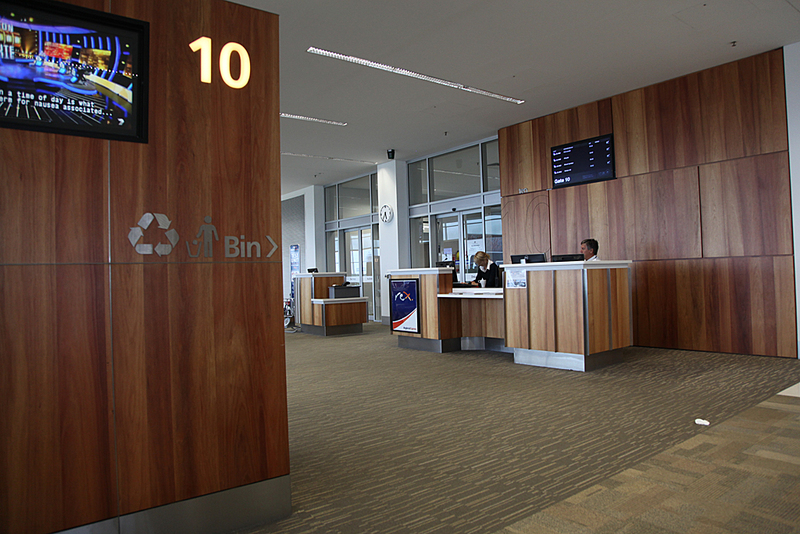 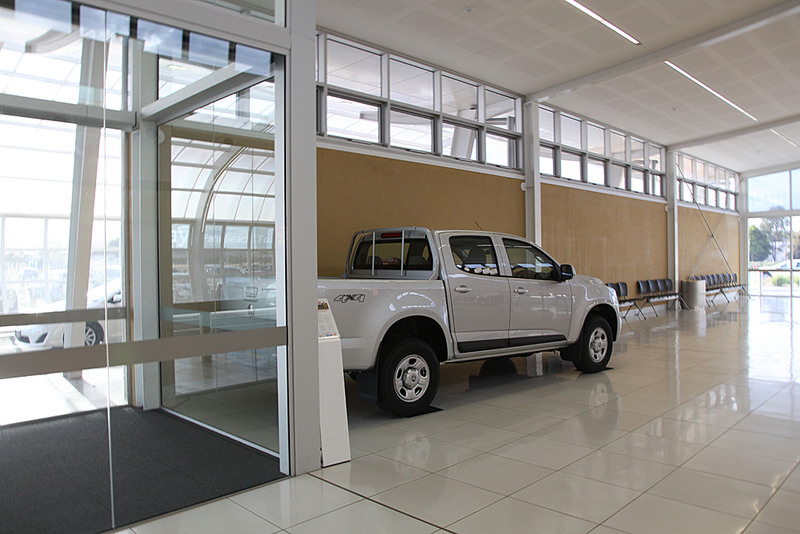 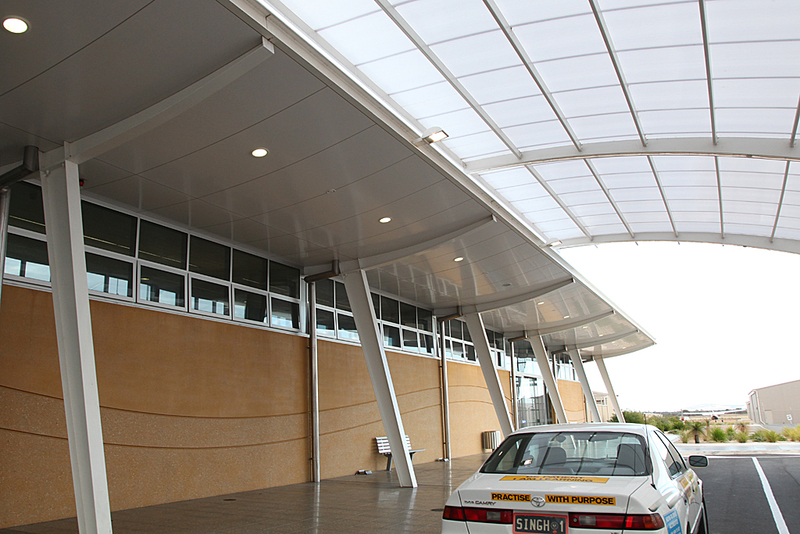 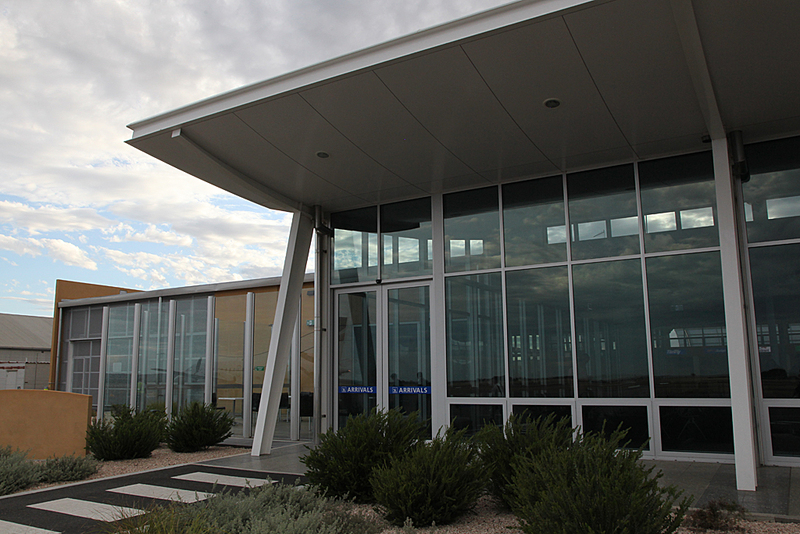 Ever since a new terminal has been built at Port Lincoln airport, on the Eyre Peninsula, South Australia in 2013, I thought it was time for a return visit. 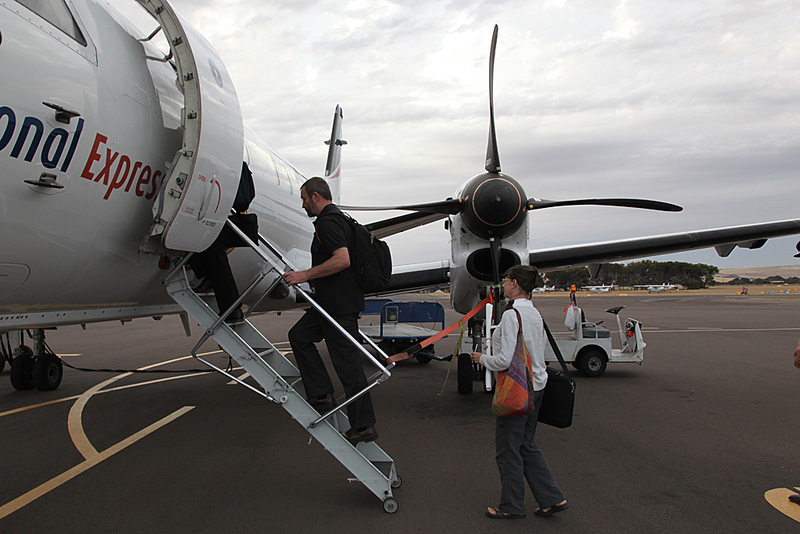 When I was last there in 2010 when Qantaslink resumed Adelaide Port Lincoln flights. 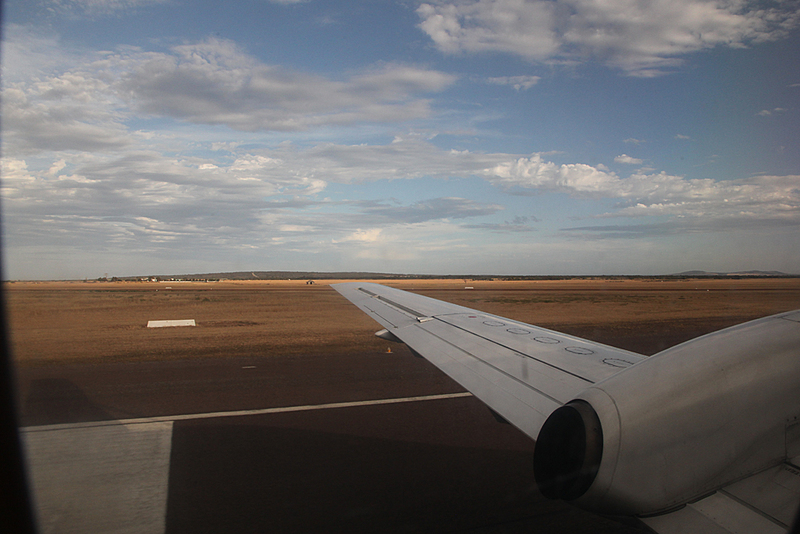 Link to that report is here. 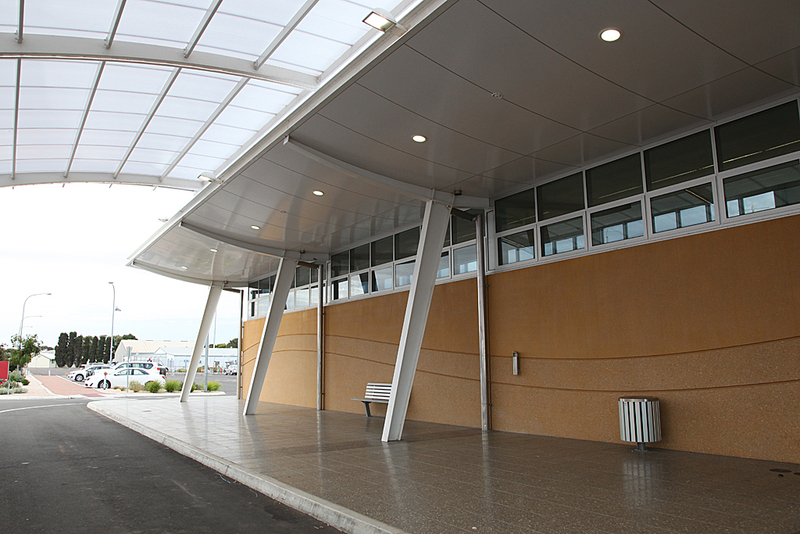 Back then the old terminal was still in use. 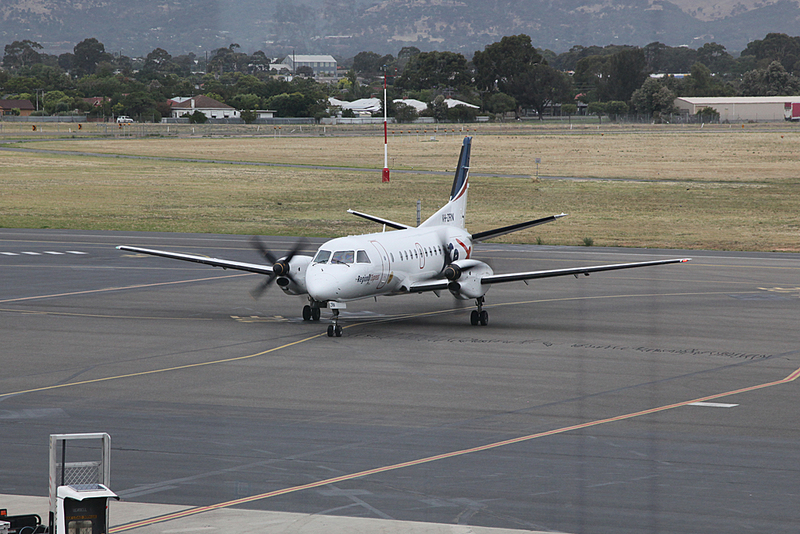 It was quite small, so it was struggling with both a 72 seater Dash8-400 and a 34 seater SAAB 340 on the ground at the same time. 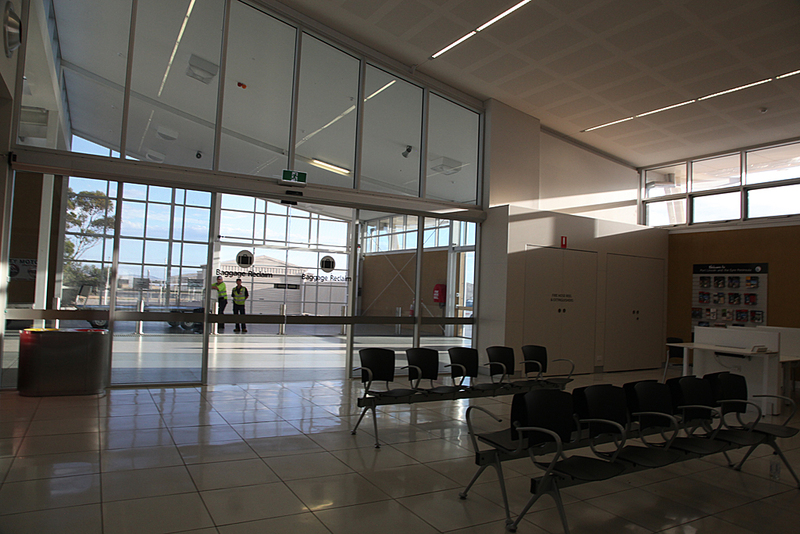 The new terminal is much bigger going on pictures I have seen so far. 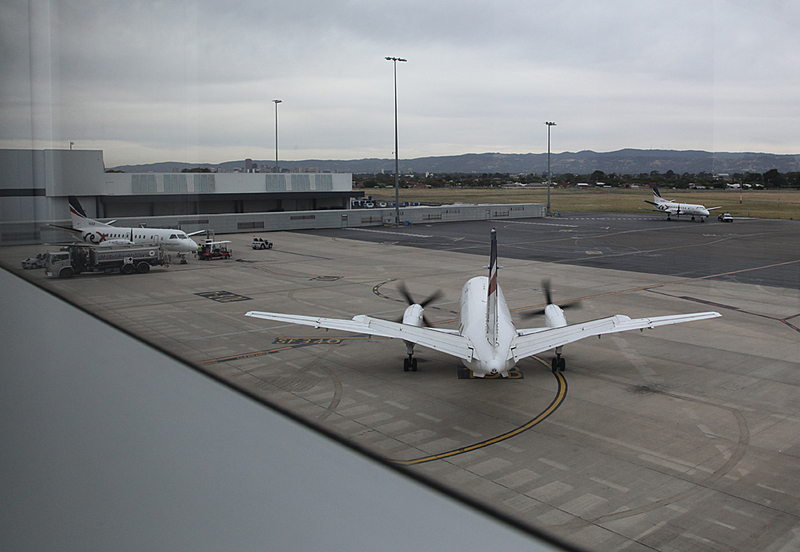 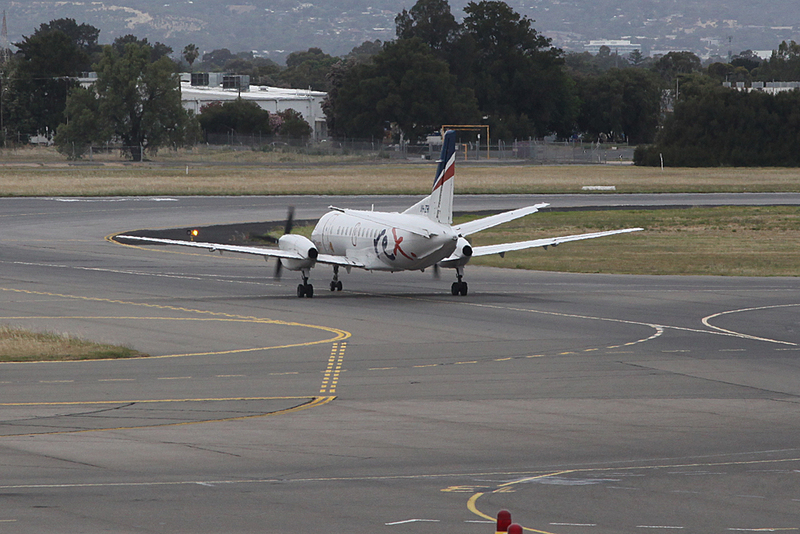 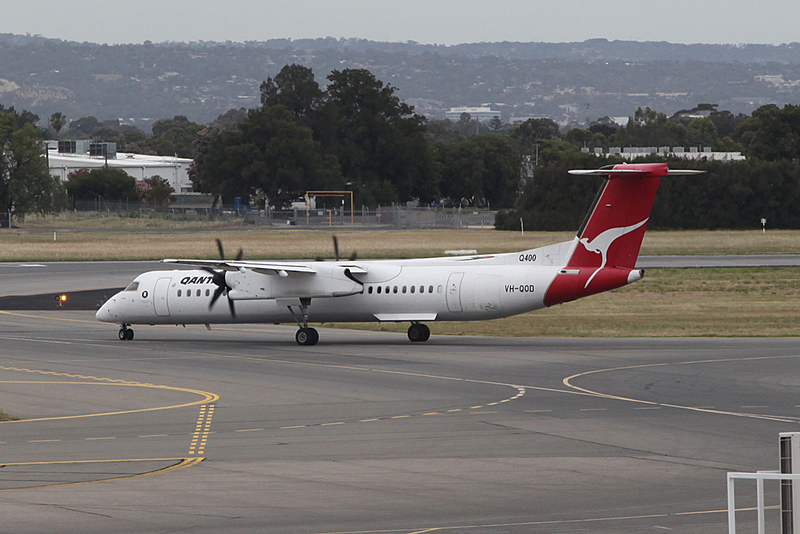 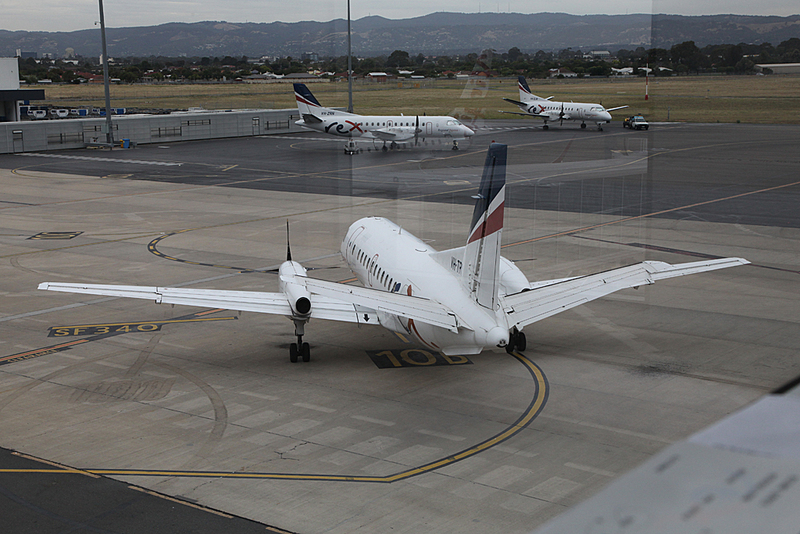 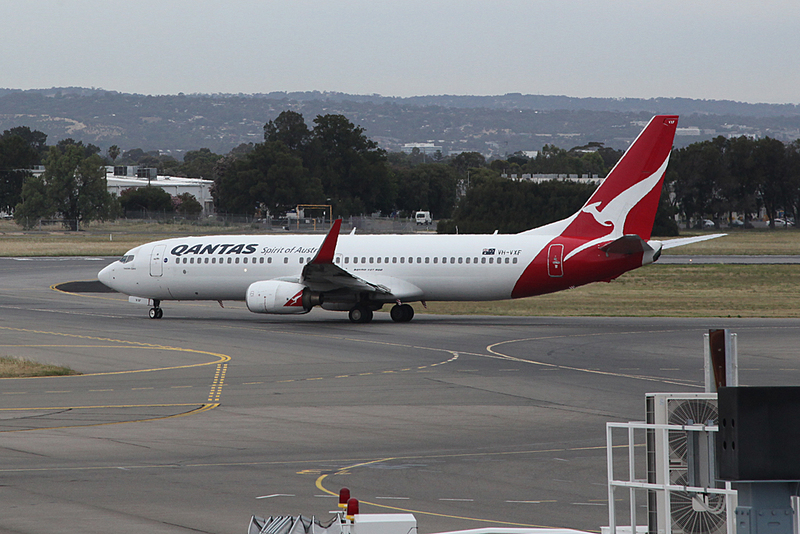 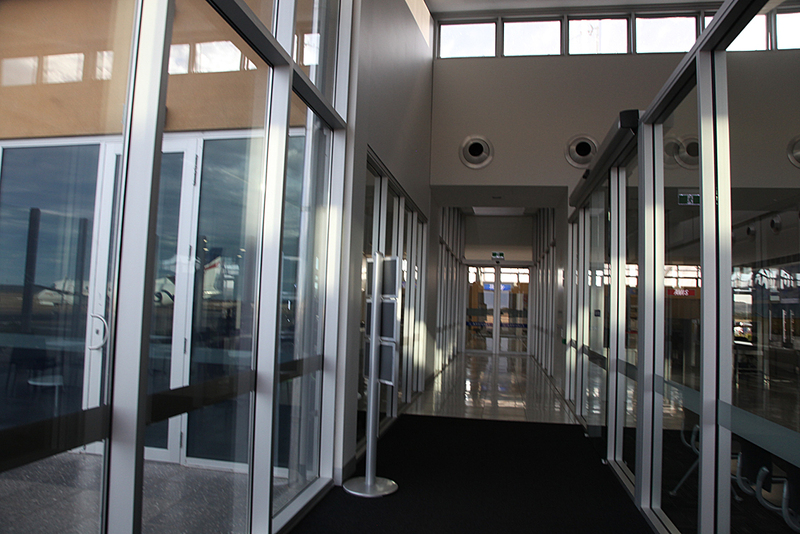 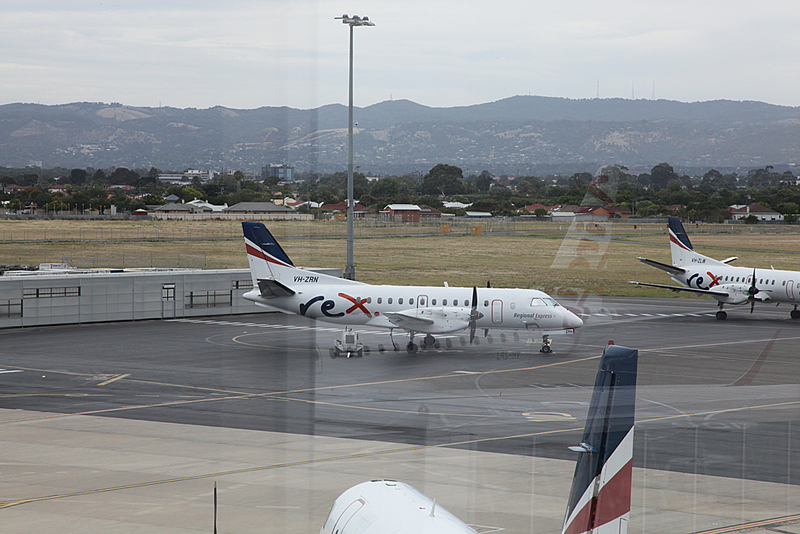 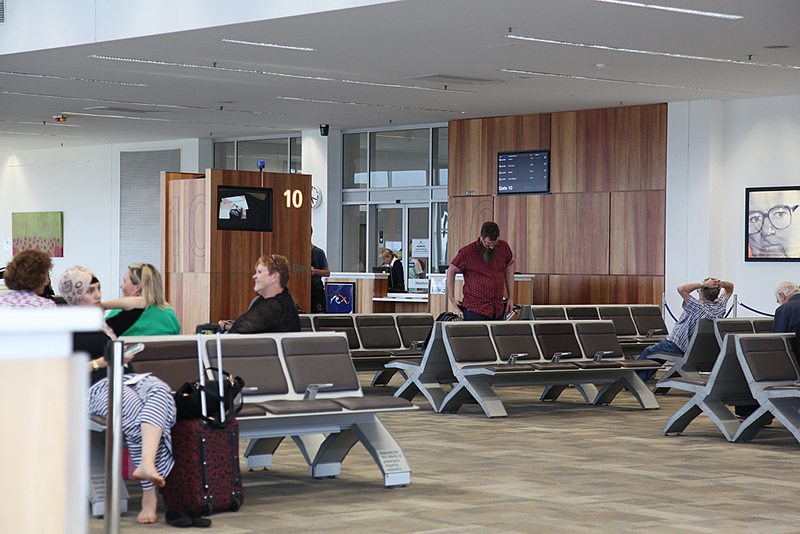 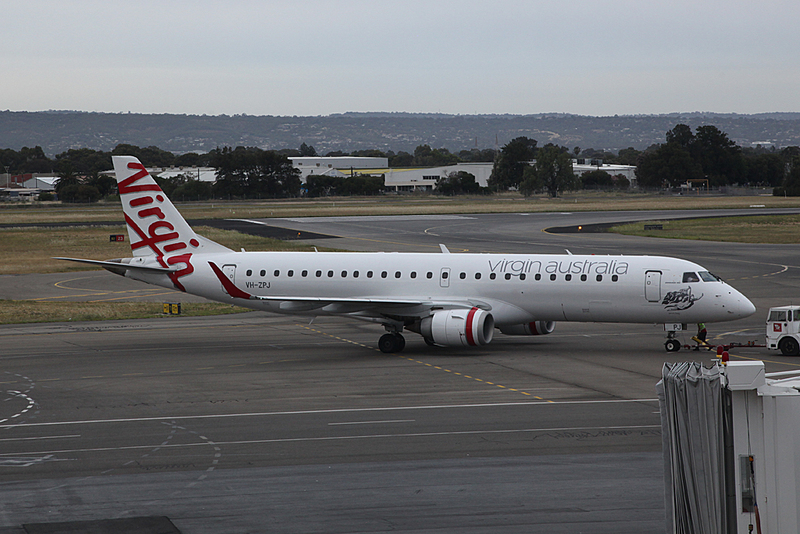 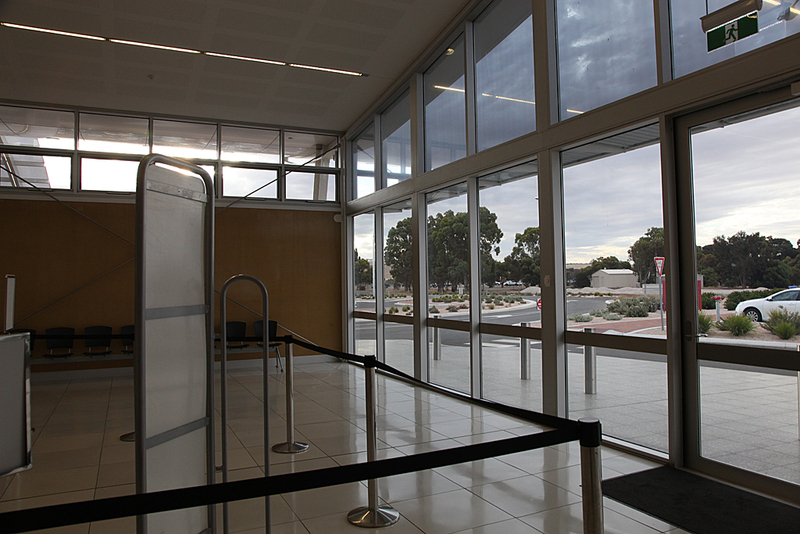 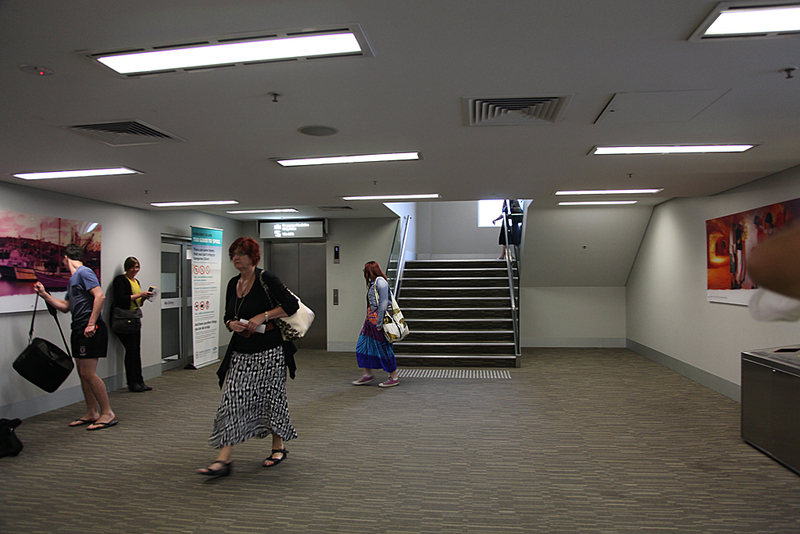 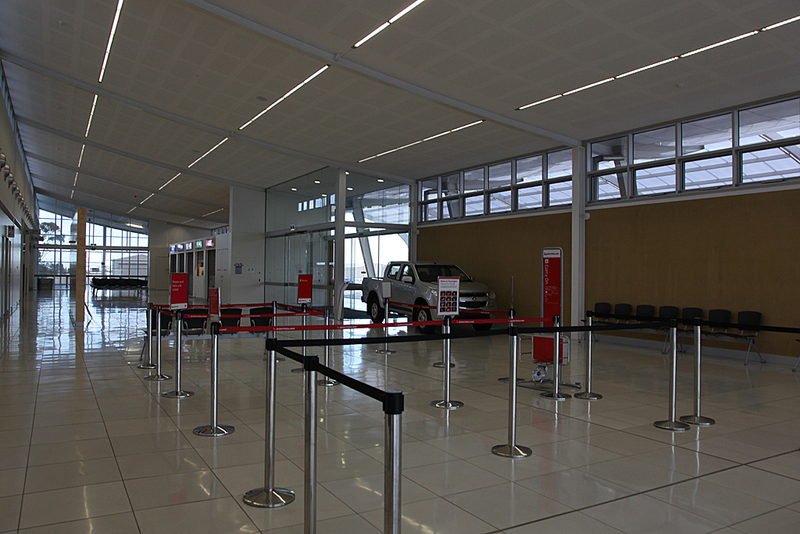 Also the old terminal did not have security screening so Qantaslink passengers connecting to a mainline Qantas flight in Adelaide would have to go through it in Adelaide. 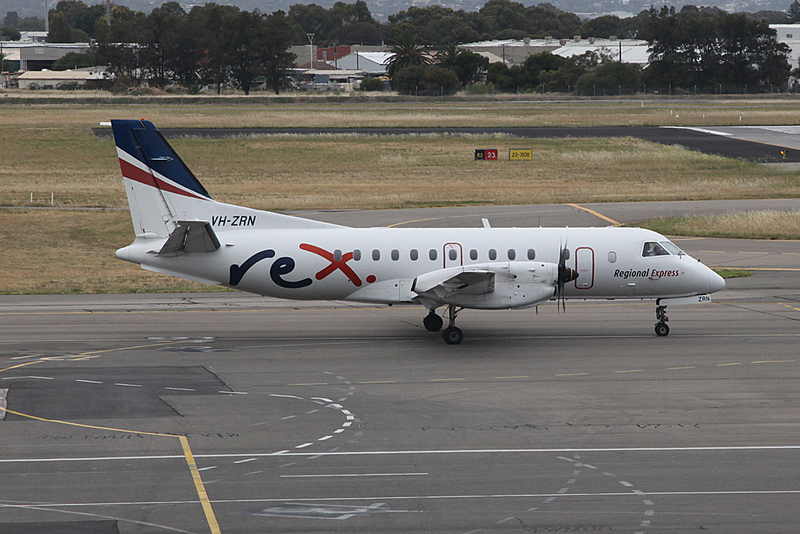 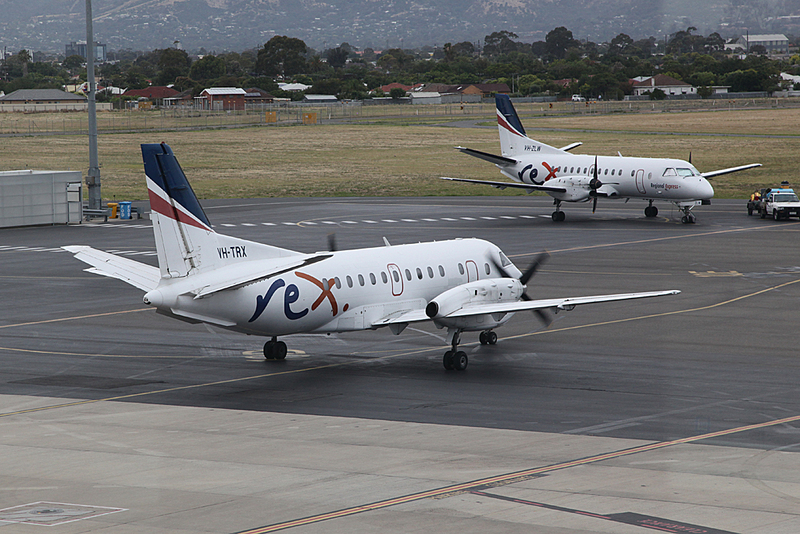 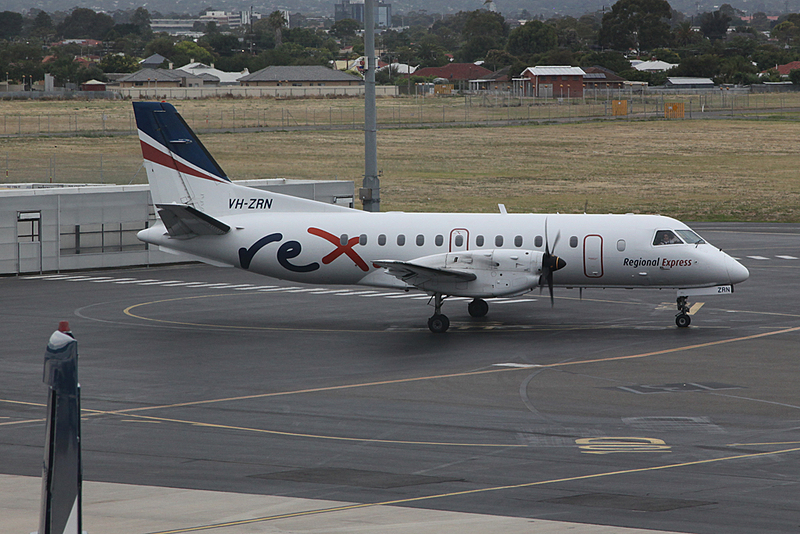 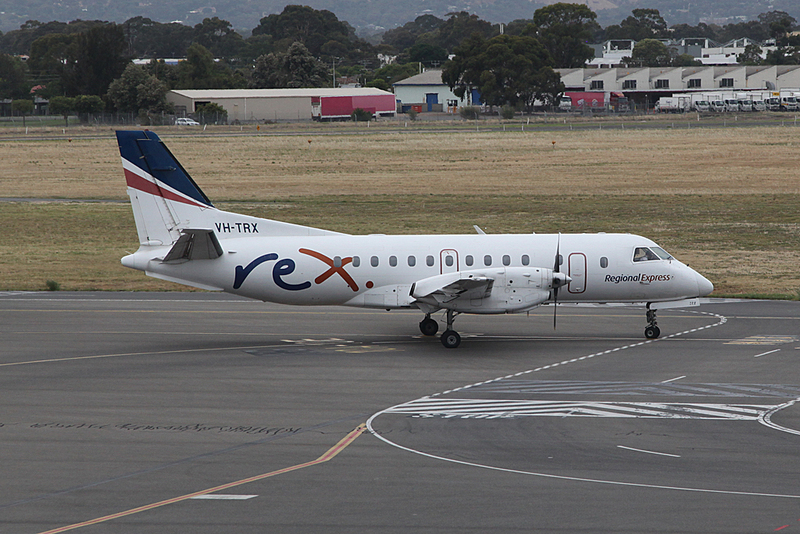 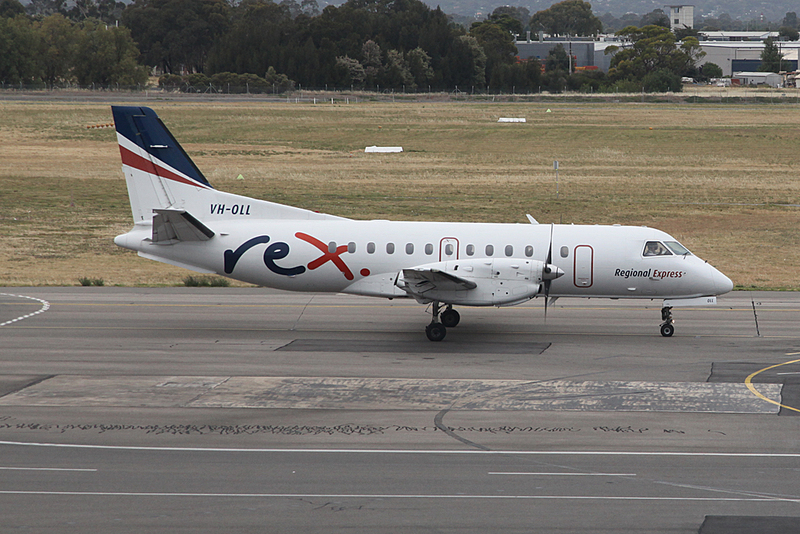 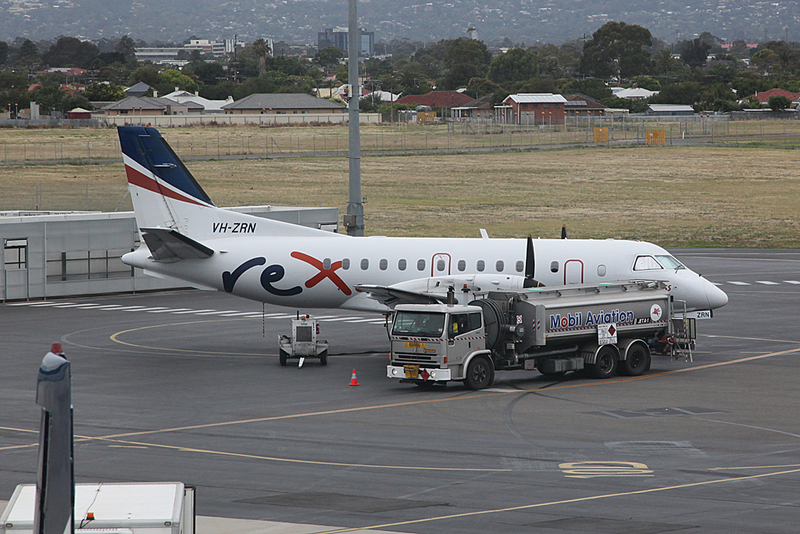 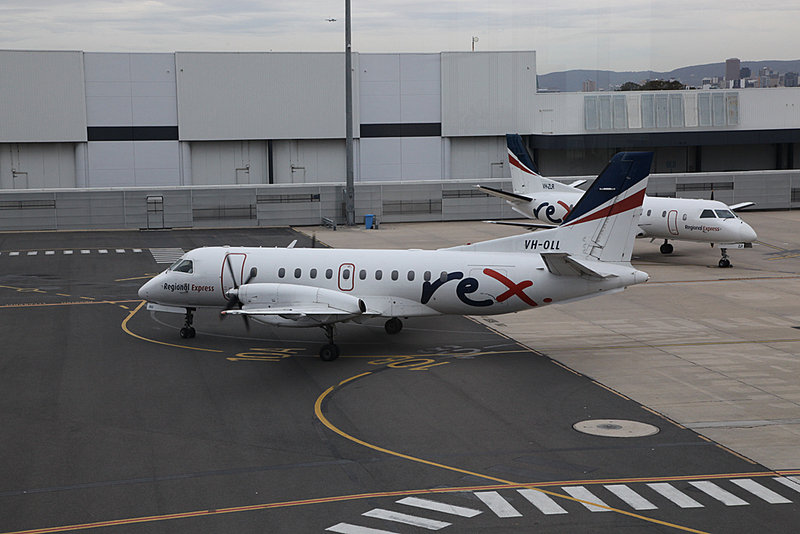 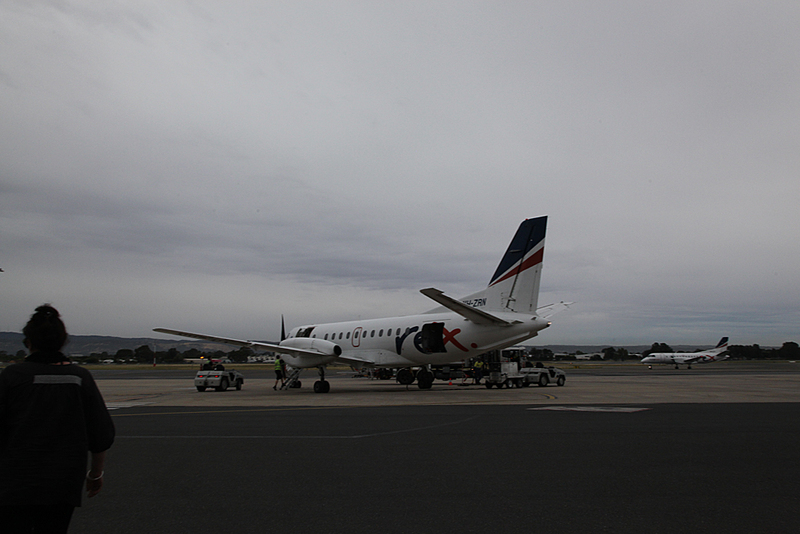 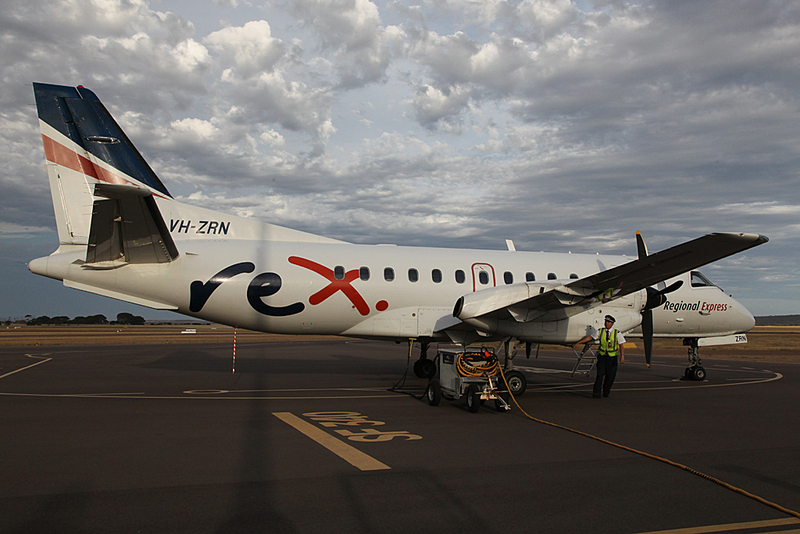 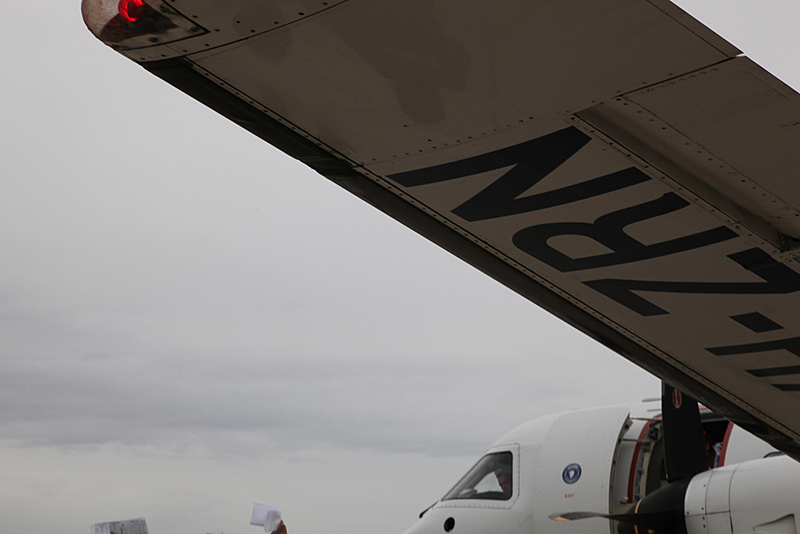 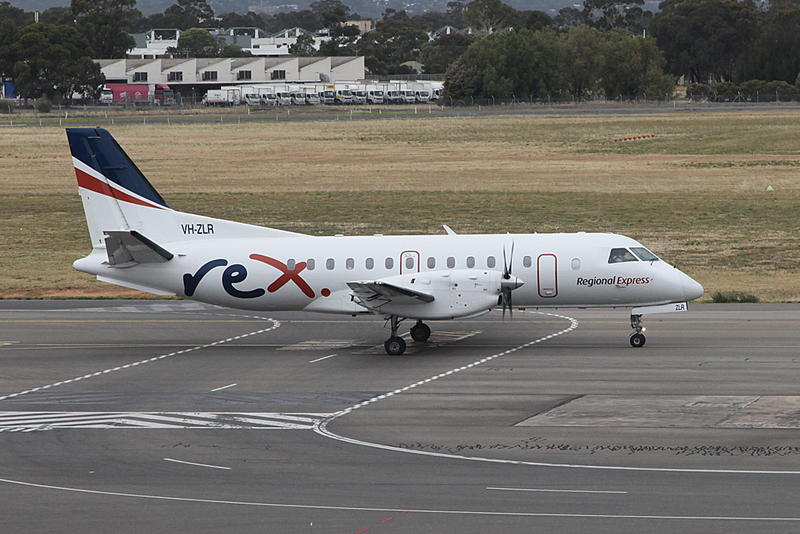 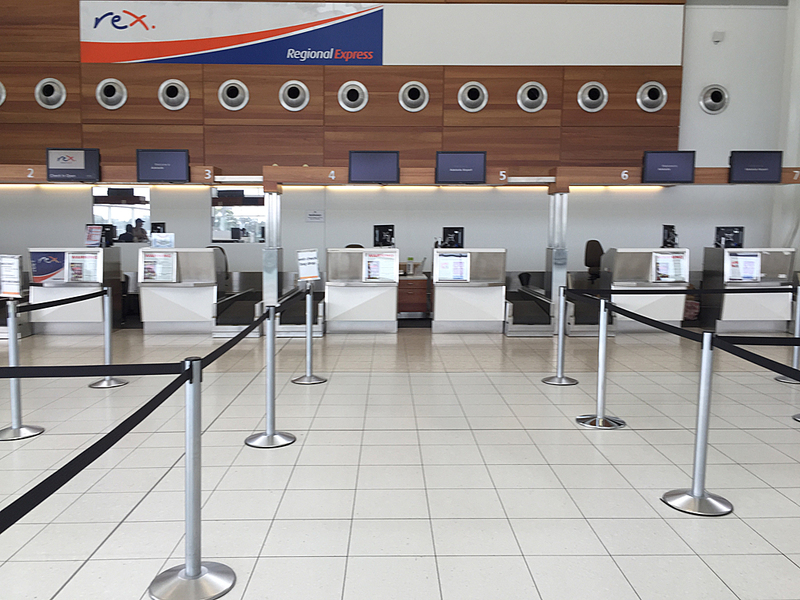 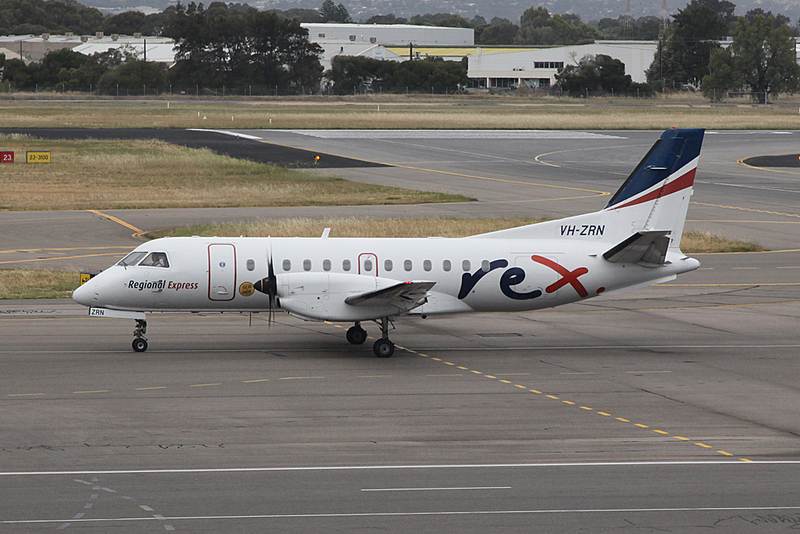 However from what I have been told, passengers on REX flights don't have to go through security screening in Port Lincoln as it is only required for large turboprops and jets. 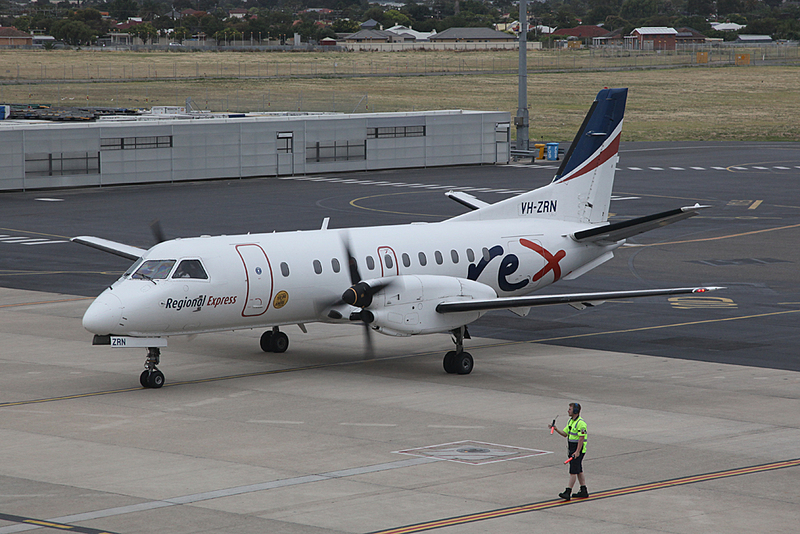 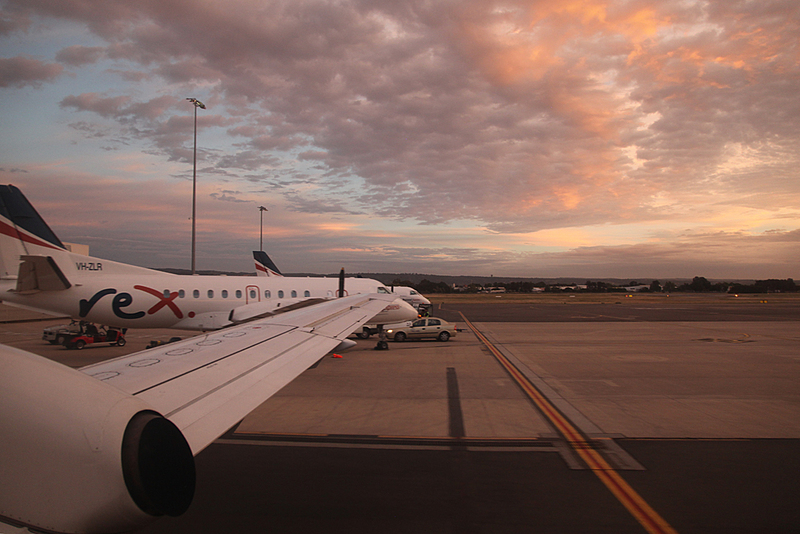 Also over the next couple of years I plan on visiting all the airports served by Regional Express from Adelaide, Broken Hill, Mount Gambier etc. 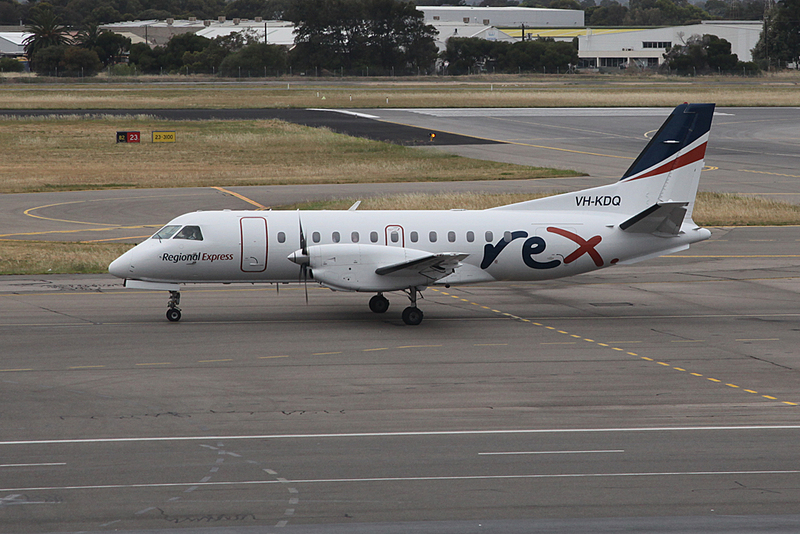 So far flown to Kingscote on Kangaroo Island with Regional Express, although I have been there previously in 2004 with now defunct Great Western on a Beech 1900C. 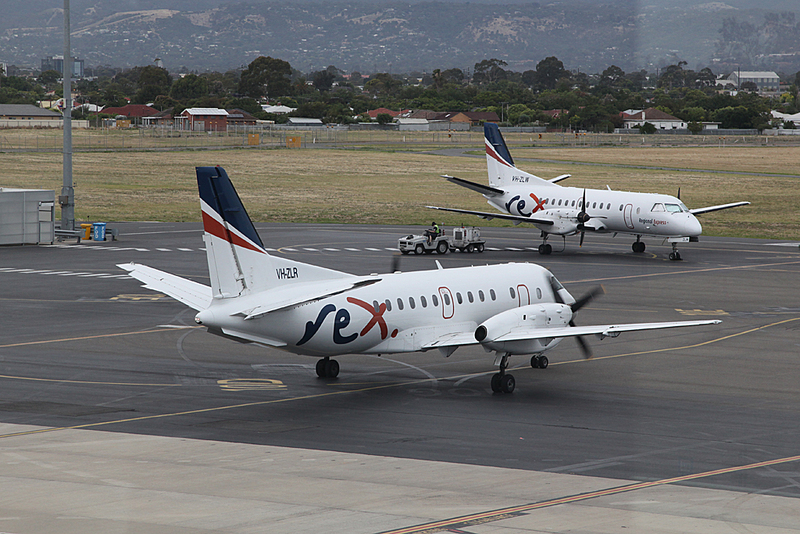 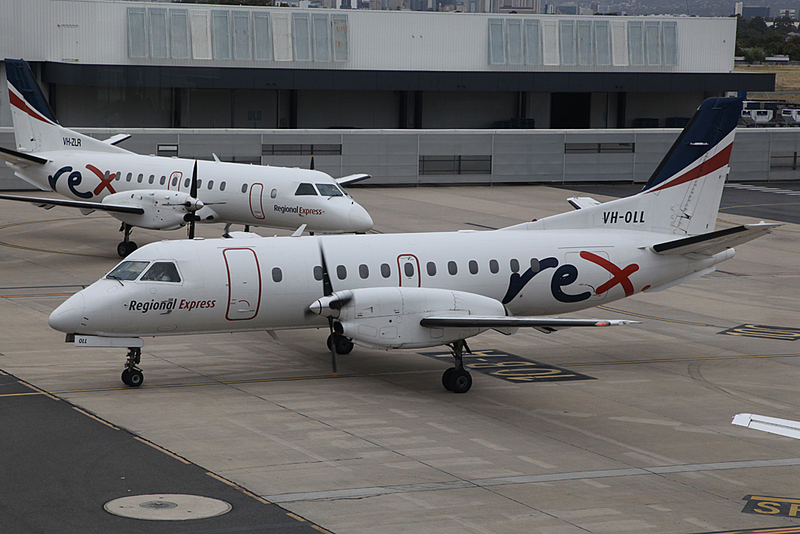 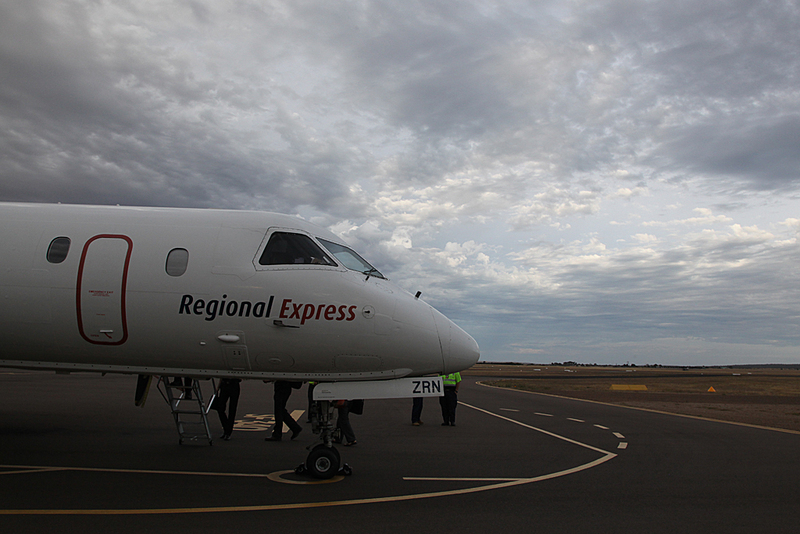 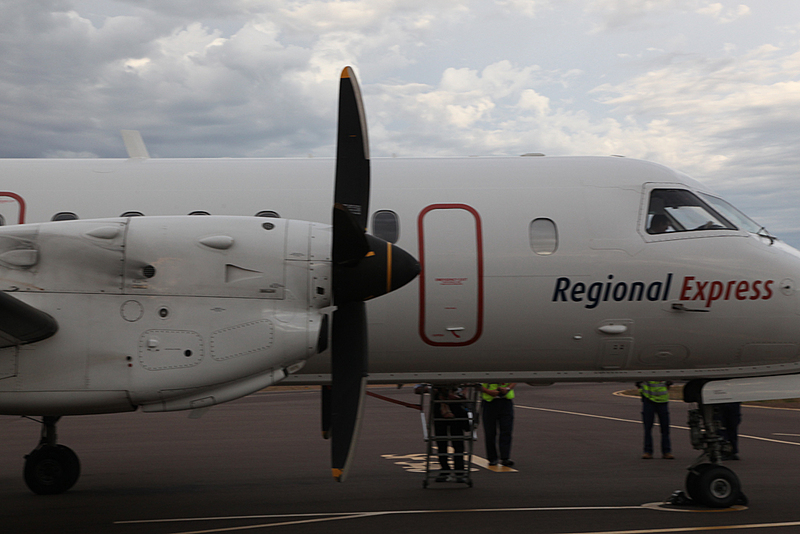 First flight with Regional Express and on a SAAB 340. 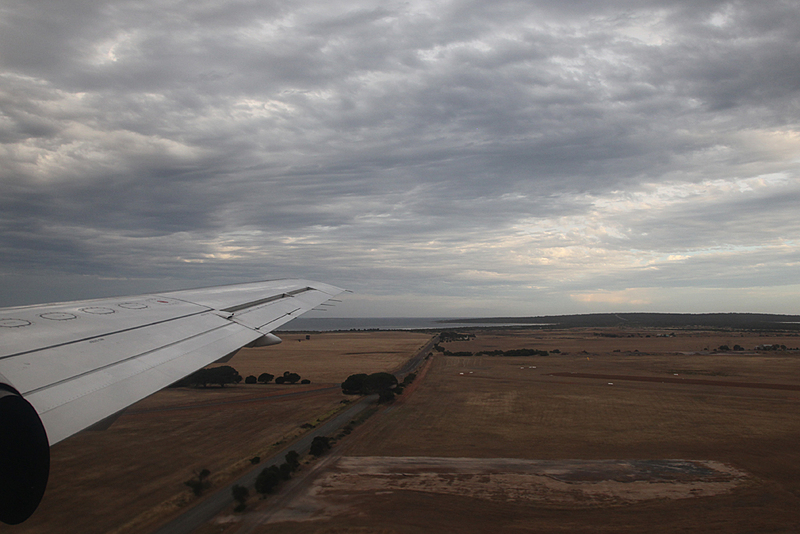 As mentioned earlier, I had been to Kingscote in 2004. 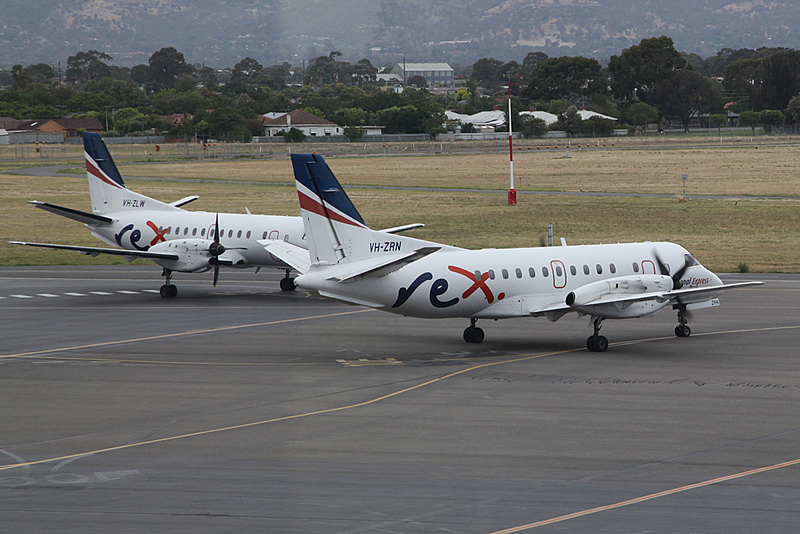 Also, a friend of mine is a first officer flying the SAAB 340 for REX, and was able to make a number of small arrangements for my booking and flights to ensure that indeed I had a good time. 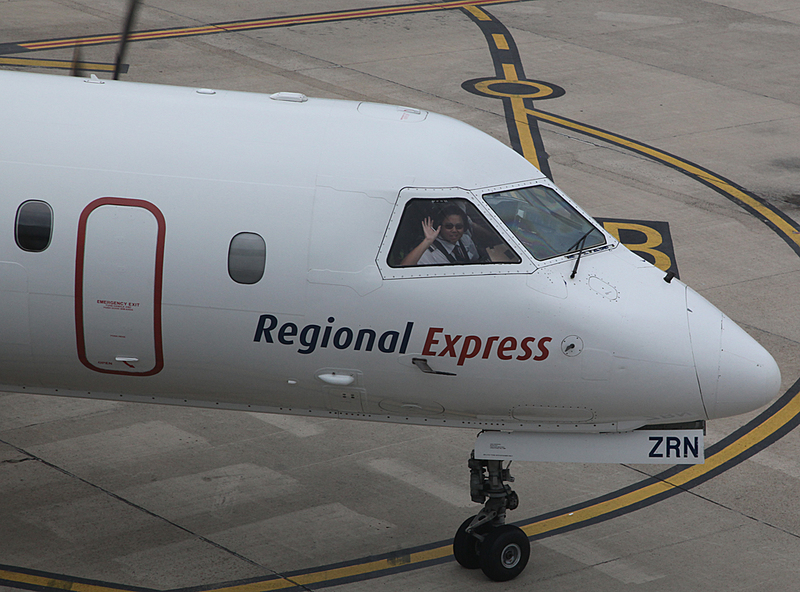 My friend, who just happen to be operating this flight I was to be on, picked me up from home and we made it to the airport in plenty of time. 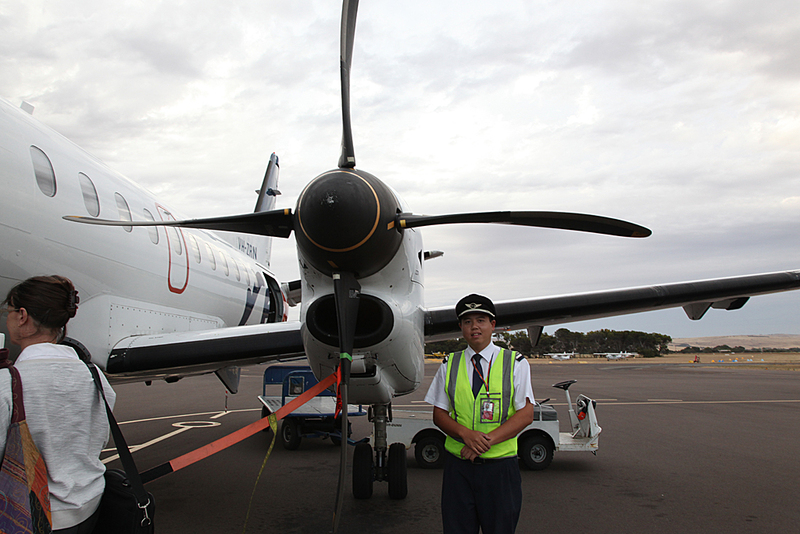 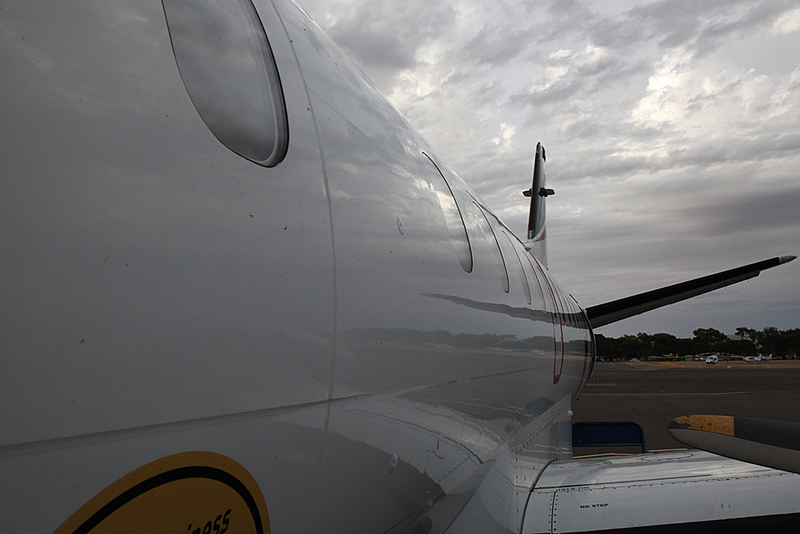 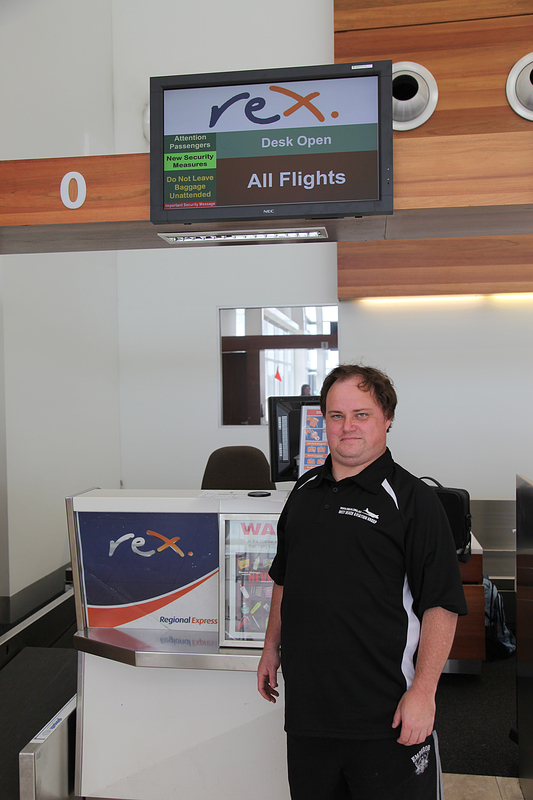 His first flight for today is to Whyalla, which departs at 4 PM. 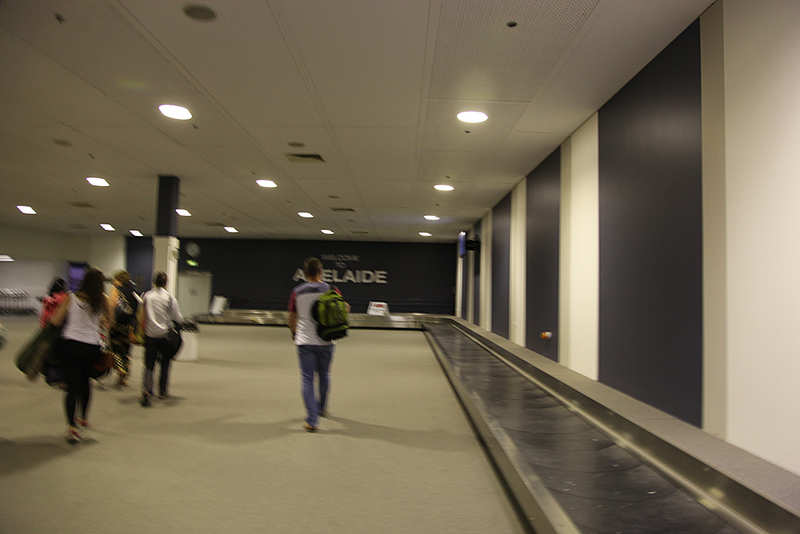 so I'm at the airport very early for the 6:30 PM flight to Port Lincoln. 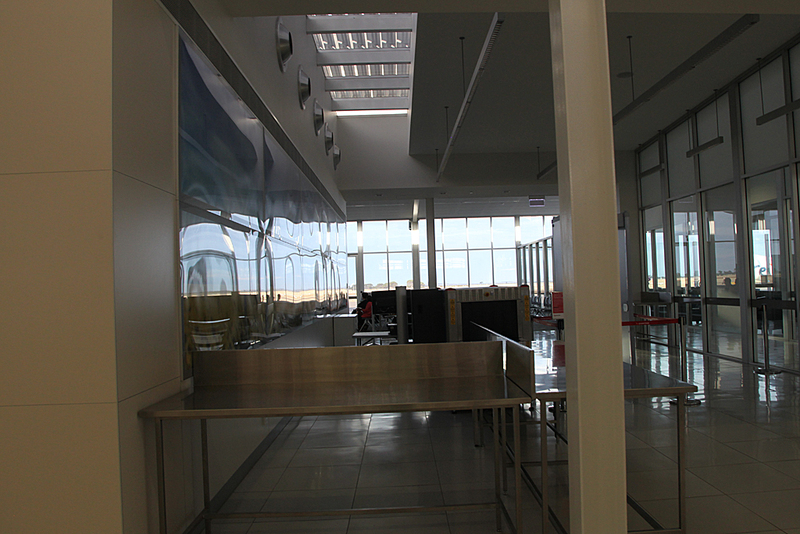 There was no queue at check in so after the check in formalities, had a leisurely chat for 10 minutes. 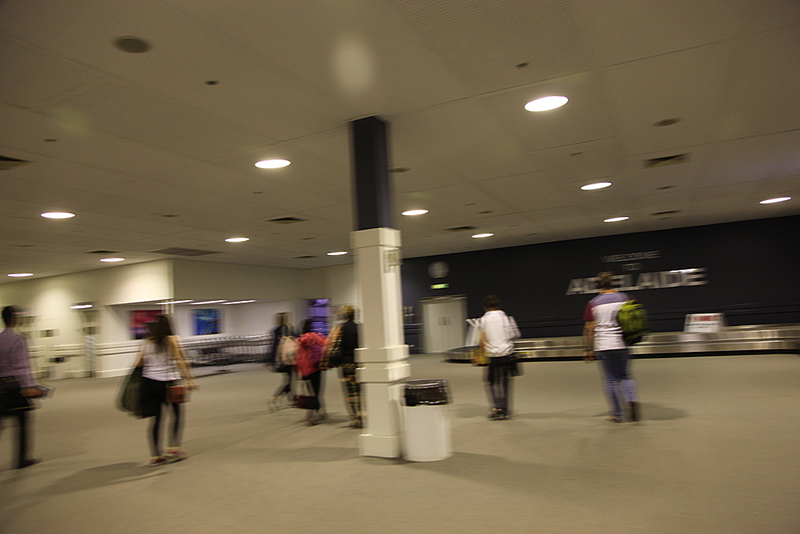 No dramas with security as all I had was my Canon 5D camera, no laptop etc. 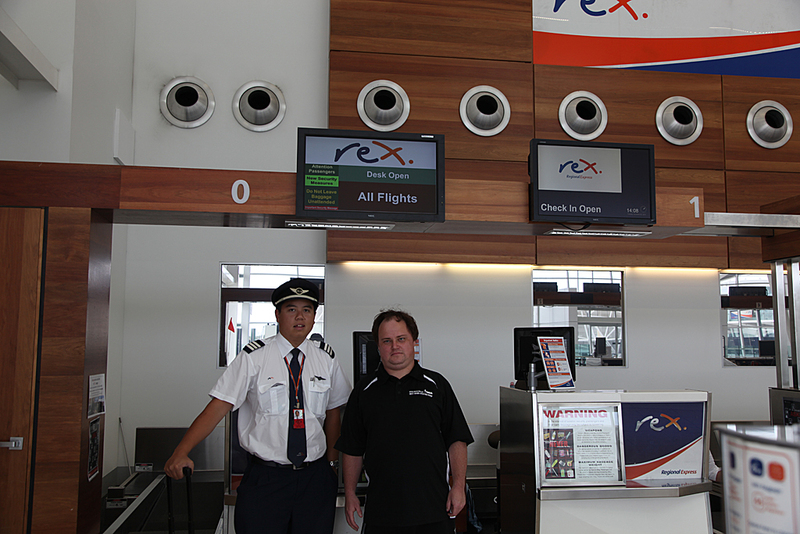 Once we got to gate 10 where the Rex flights operate from, I was introduced to the gate agent and made my way to the Rex Lounge. 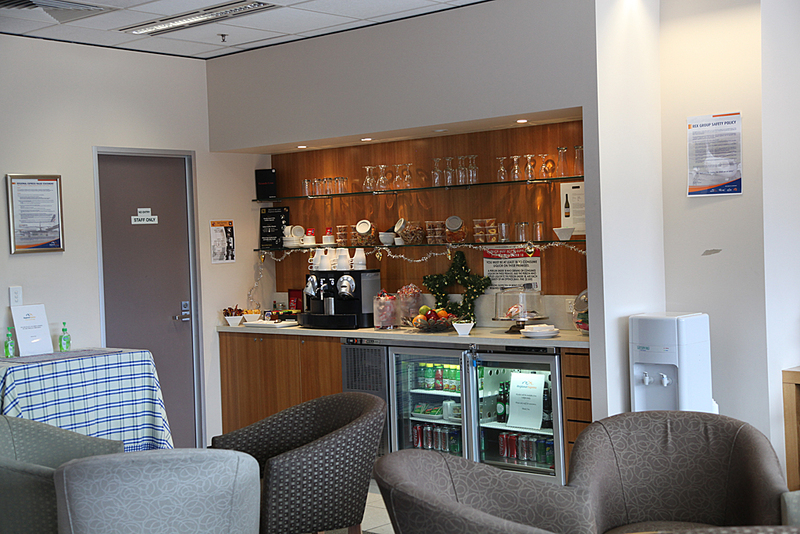 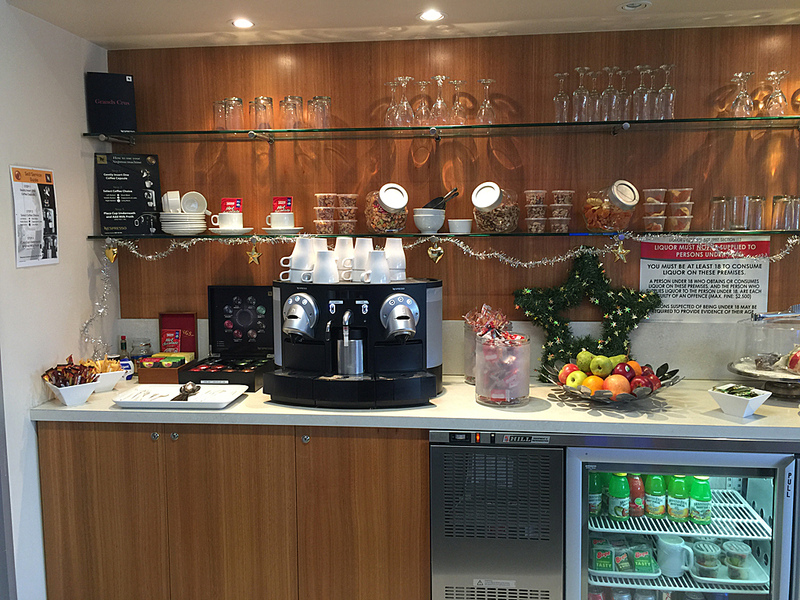 On offer are various snacks, soft drinks, fruit juices and alcoholic drinks are available on request. 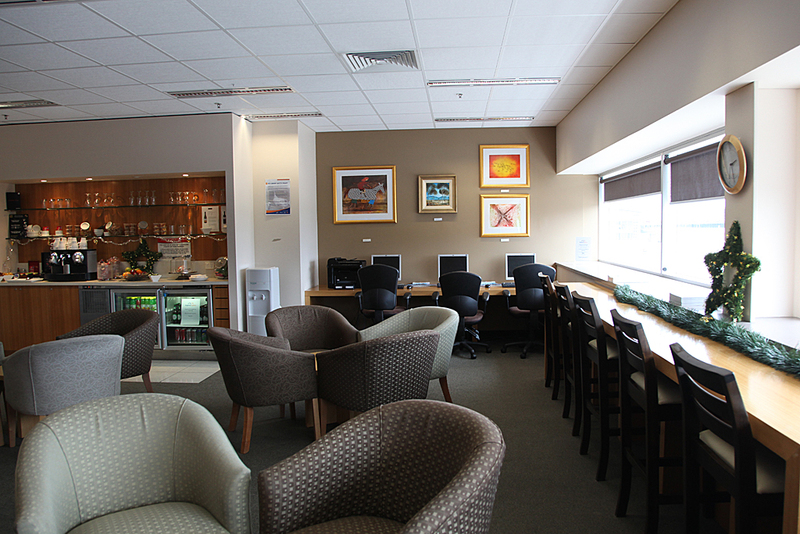 Only a small lounge, but nice. 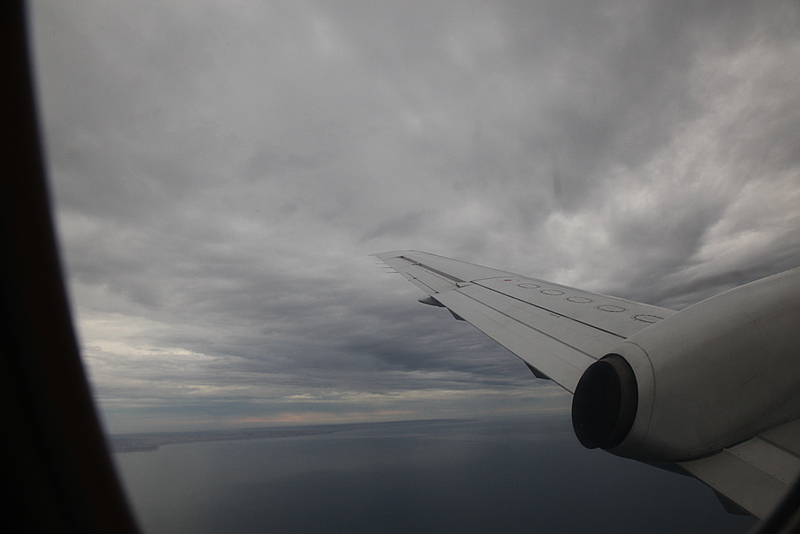 I think this is the first time I have been into one. 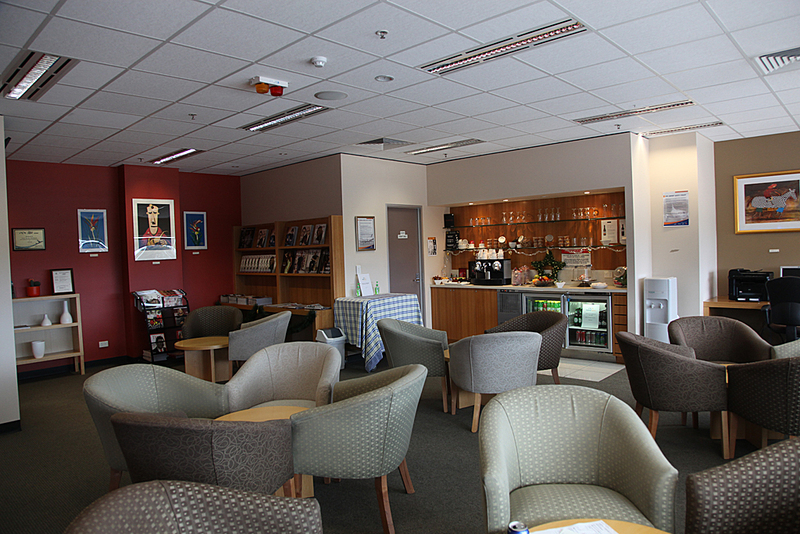 Although it is good to have a look inside the lounge, it's not the place for me as I would rather be sat somewhere watching aircraft movements. 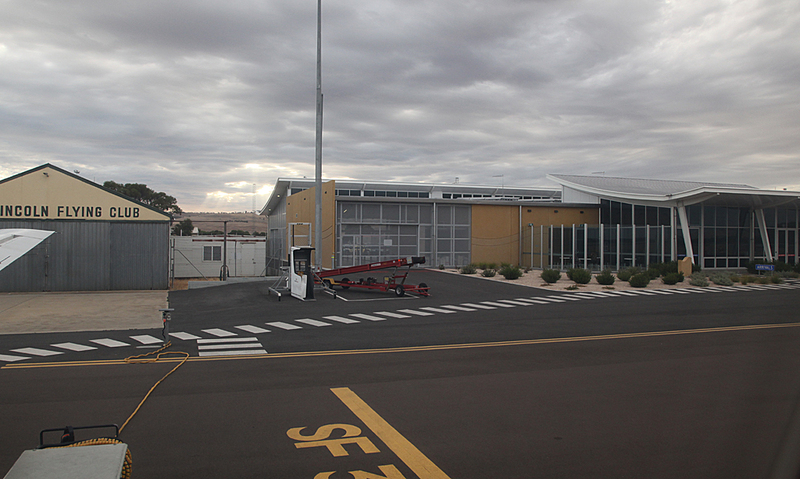 So after watching my friends flight depart and arrive back from Whyalla, it was about 6 PM and time to get ready at gate 10. 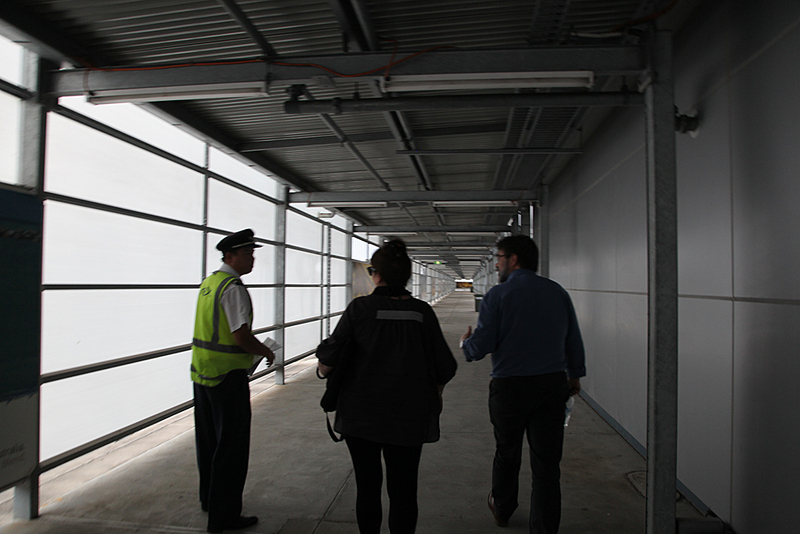 The walk out to the aircraft was the same jail like tunnel as on my Kingscote trip. 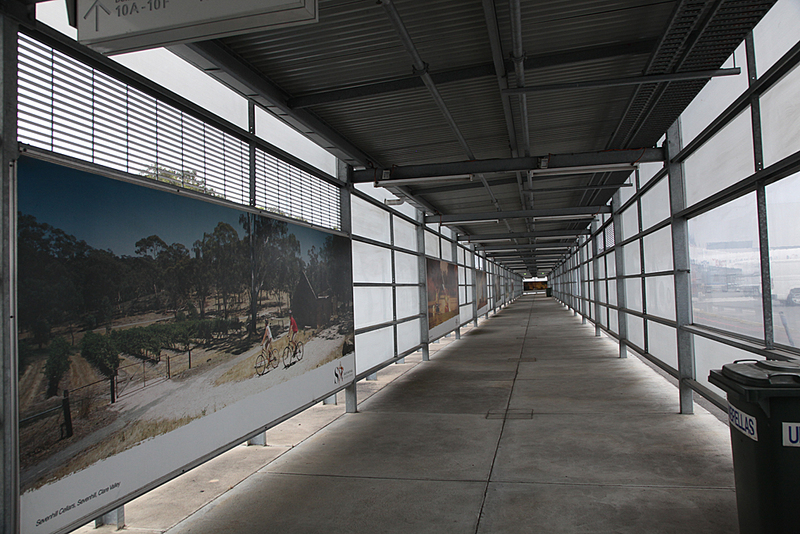 Still a small Tarmac walk and it was raining lightly. 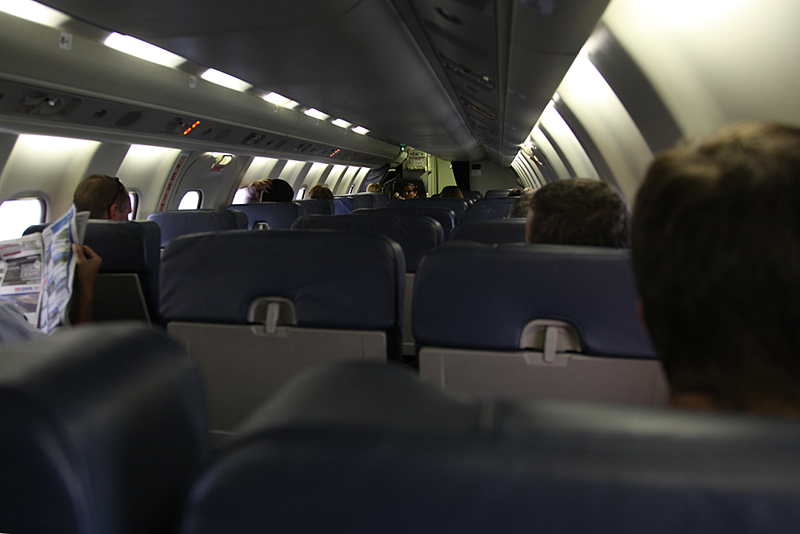 Load was about three quarters full. 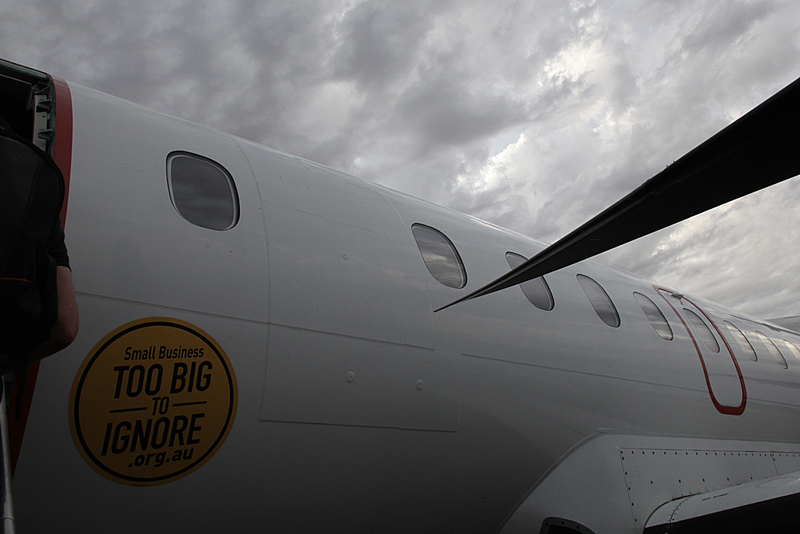 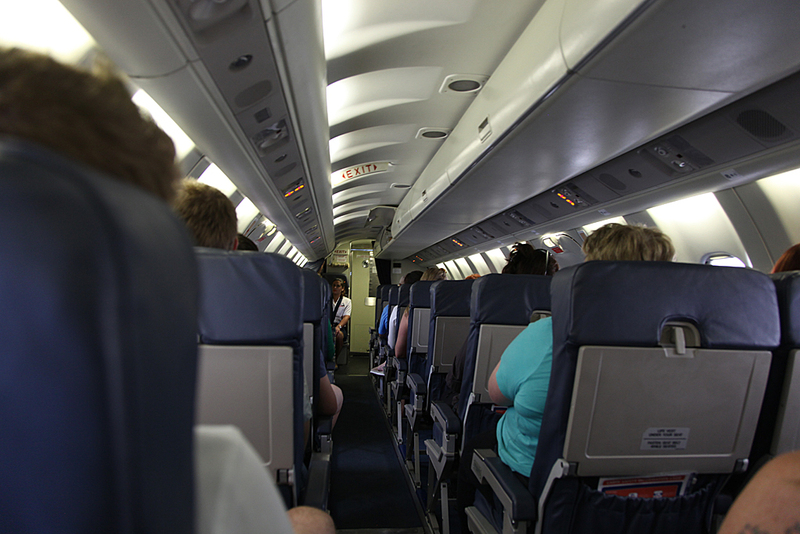 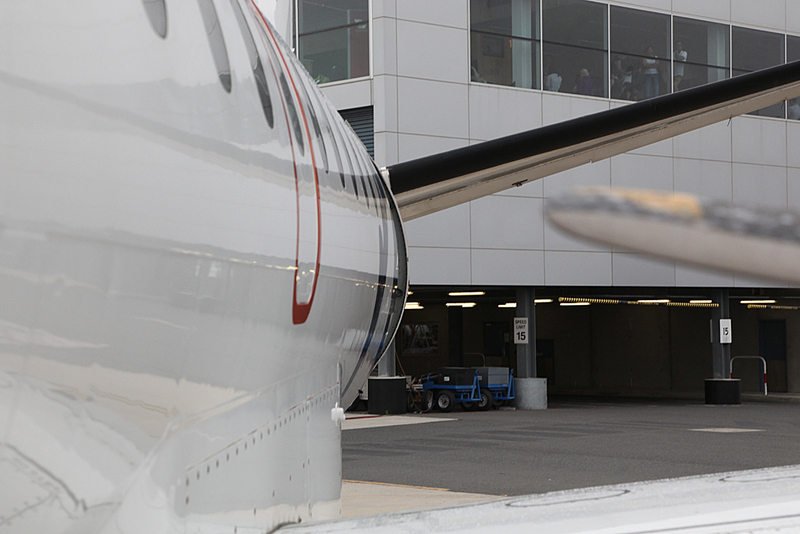 There are two types of passenger on a SAAB 340, those who bump their heads in the door and those who are about to. 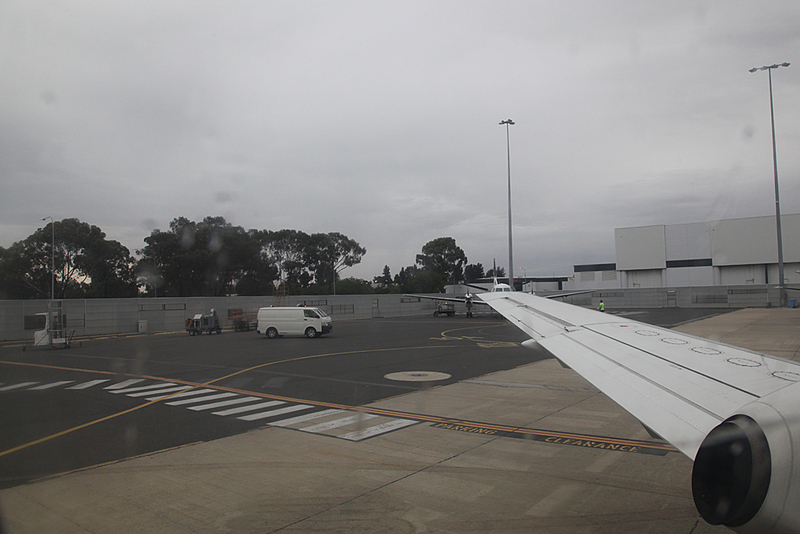 I think the SAAB 340 is a bit louder than a Dash8-100 and I think there is a bit more vibration too. 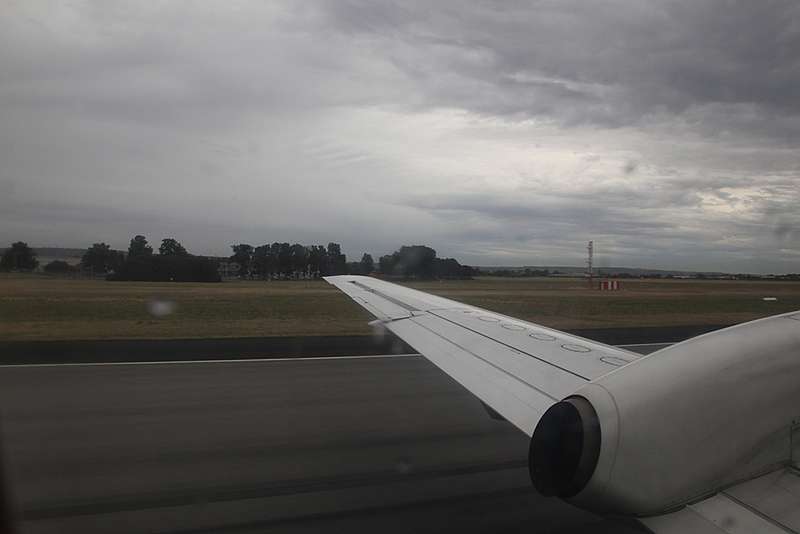 Take off was powerful, but some vibration could be felt. 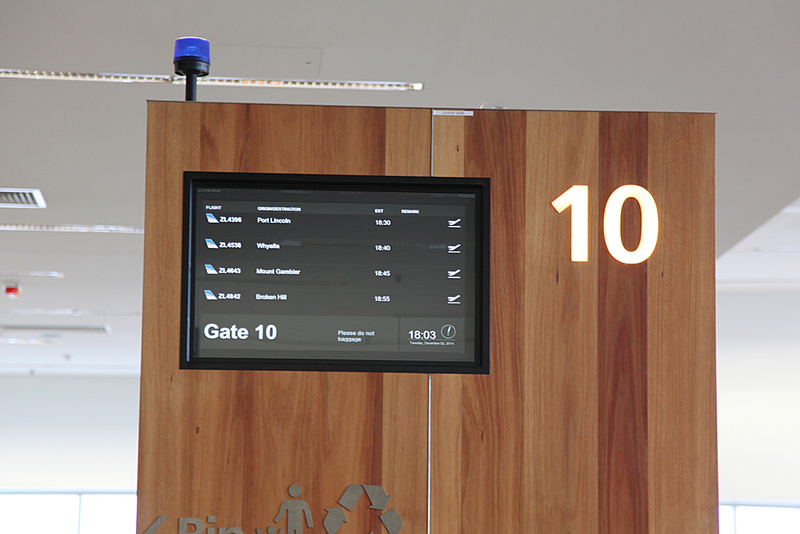 Flying time is about 35 minutes. 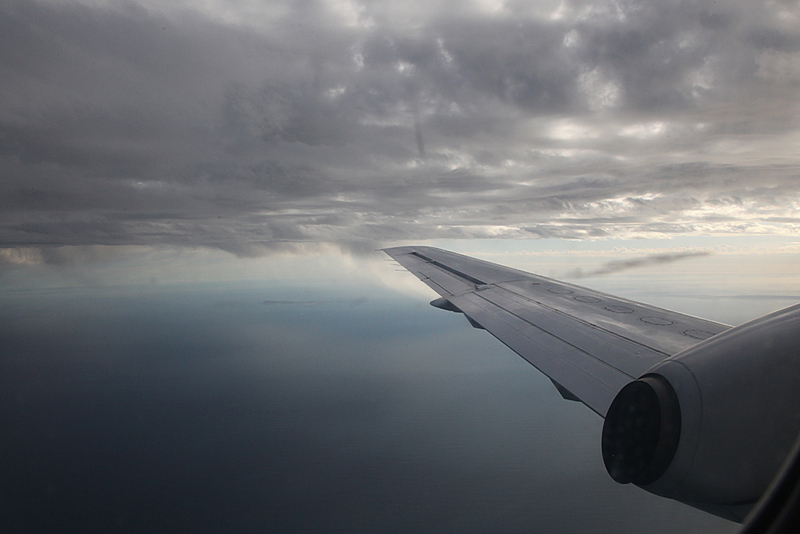 Cruising altitude was about 9000 feet. 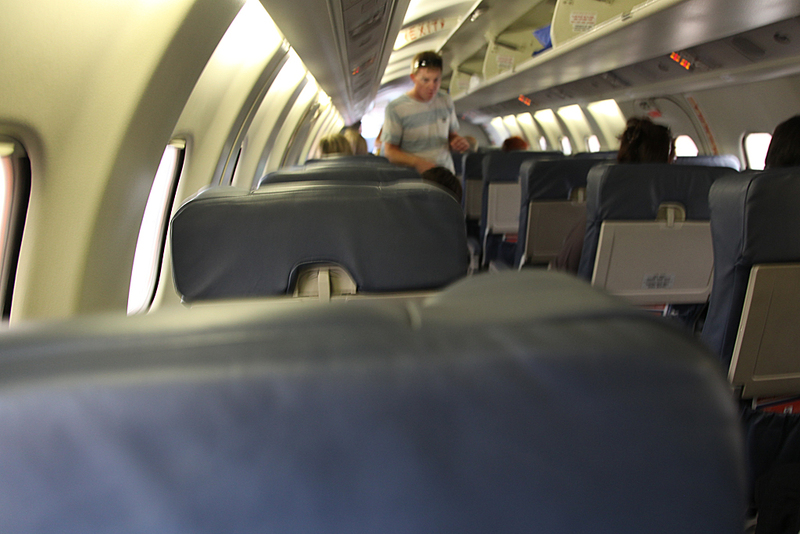 Was quite a bit of light turbulence and the crew were concerned it could get worse, so no tea or coffee was offered, but water and a choice of sweet or savory snacks were offered. 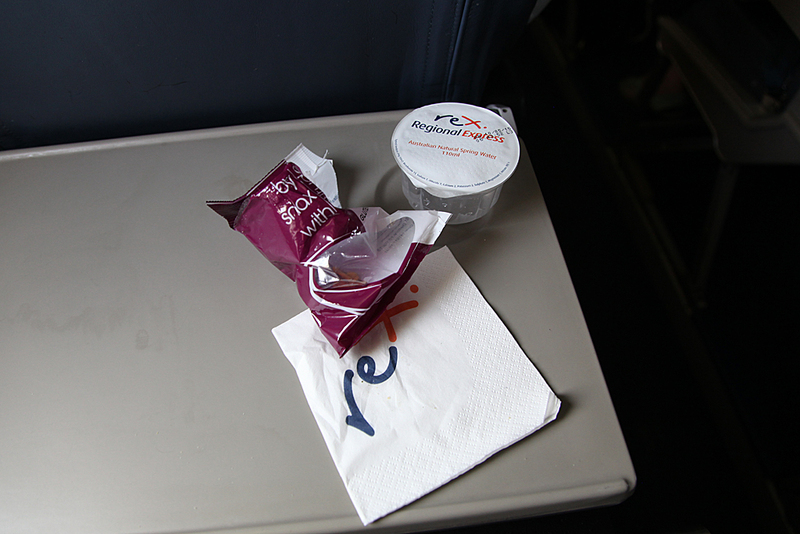 Had the savoury snack which was quite nice. 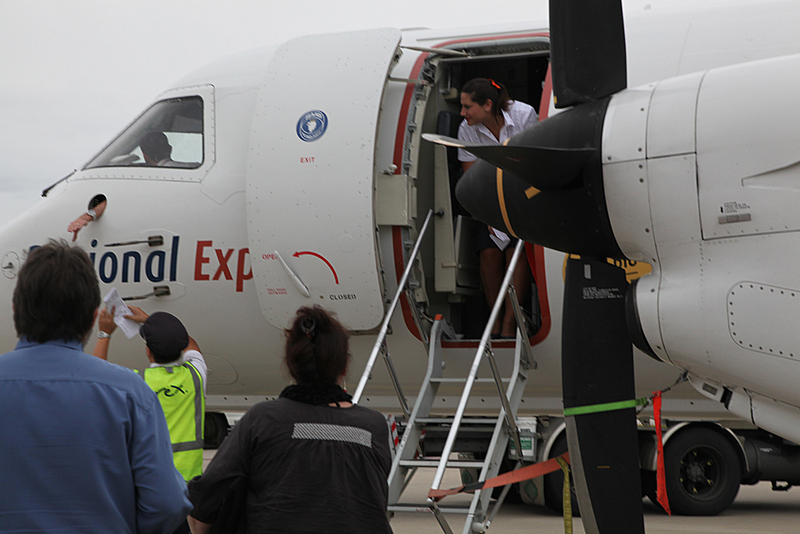 Also there was a trainee flight attendant onboard, the SAAB 340 usually has one. 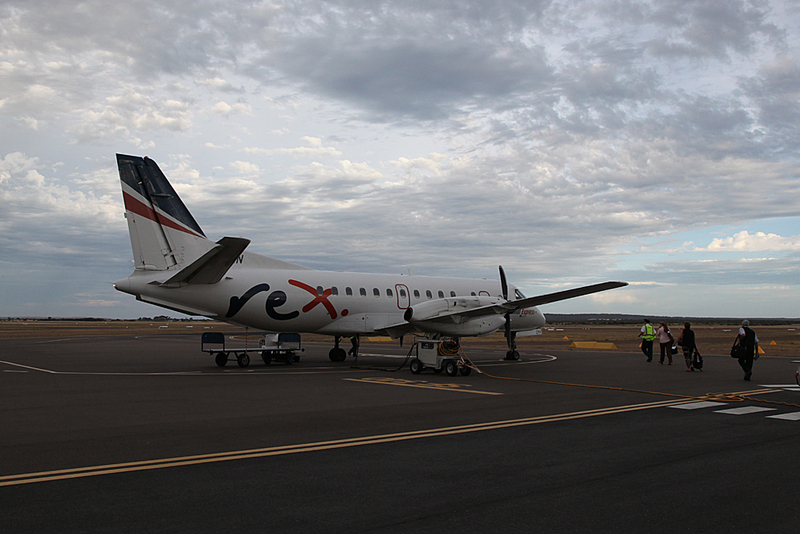 My friend said the trainee was also on the flight to Whyalla as well. 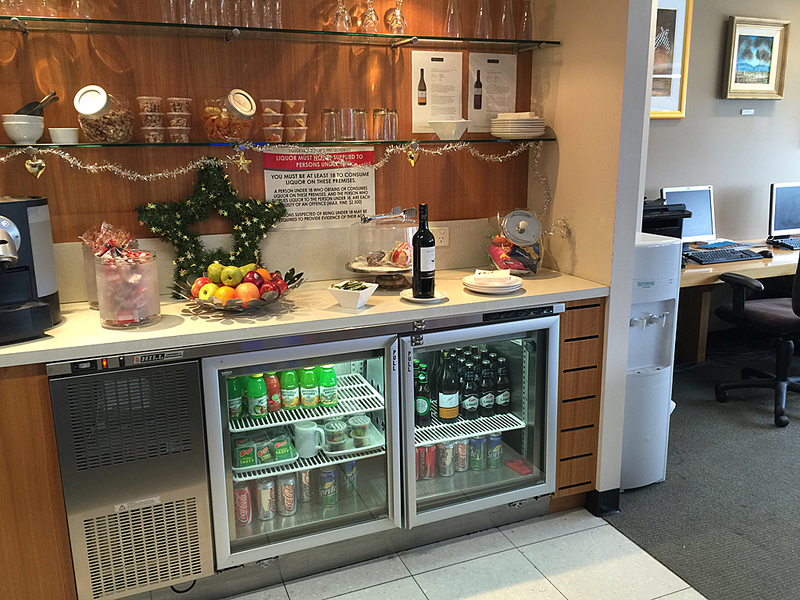 Soft drinks and alcohol were offered for sale. 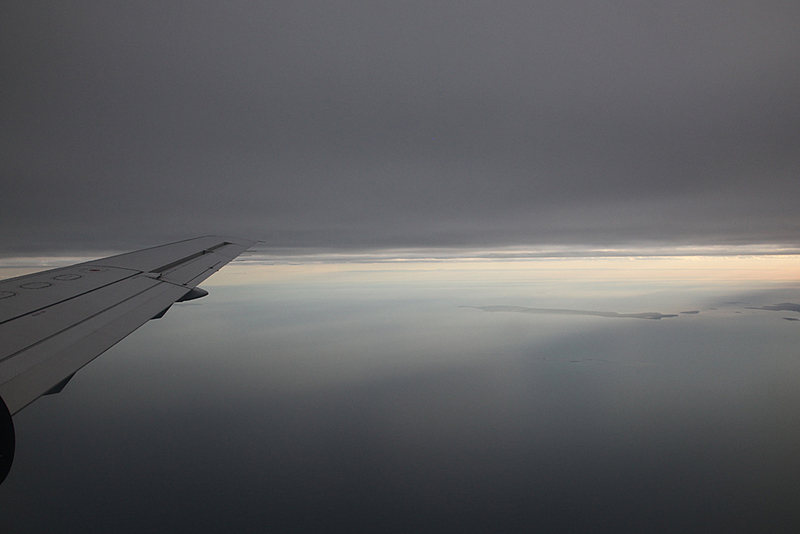 That was one thing I noticed different from my trip a few years ago. 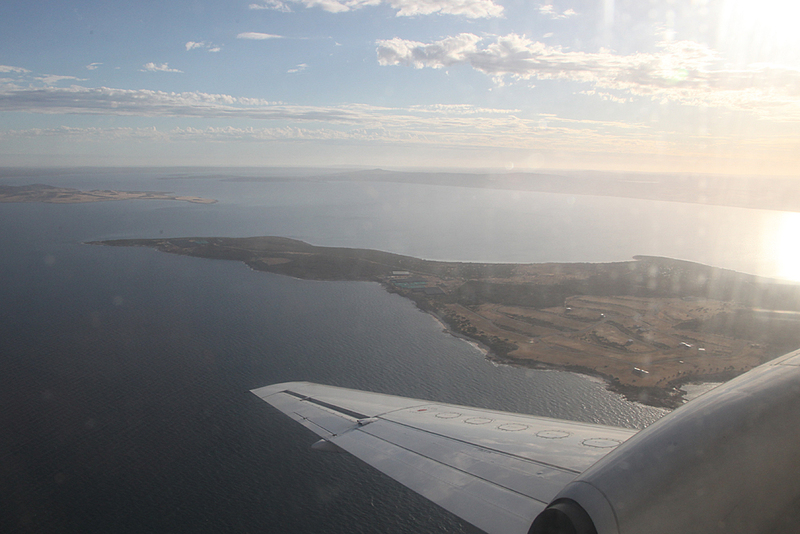 Landing in Port Lincoln I was expecting it to be like the Skytrans Dash8 I flew on a few weeks earlier, once on the ground maximum braking and reverse pitch used to stop quickly, but it was a more gentle braking action. 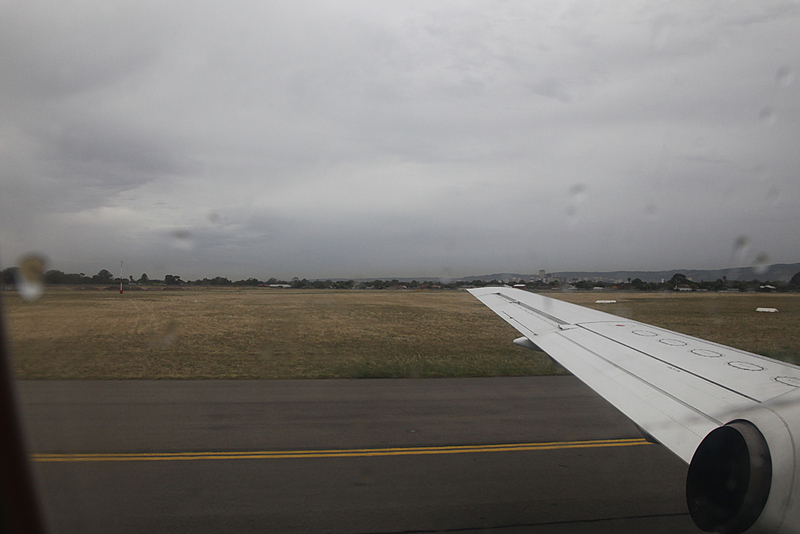 Rolled to the end of the runway and backtracked to the taxiway to the terminal. 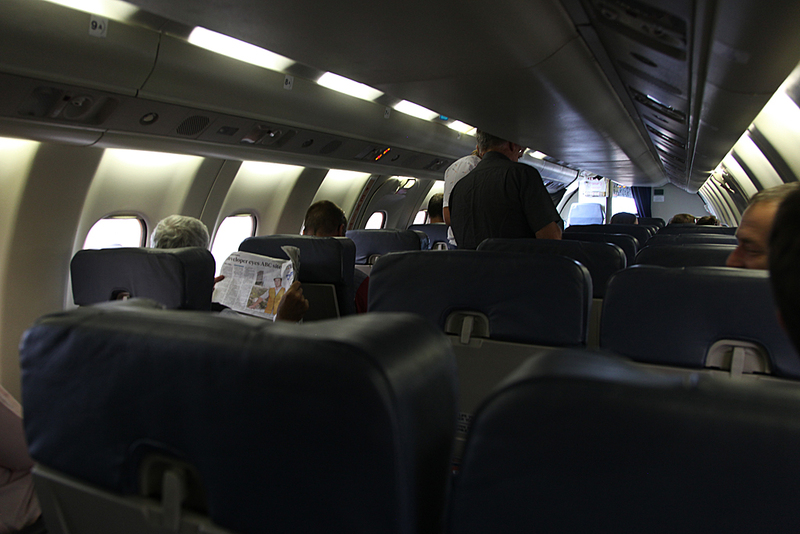 Once the engines were shut down and the door opened, I was thinking 'whats going on here? 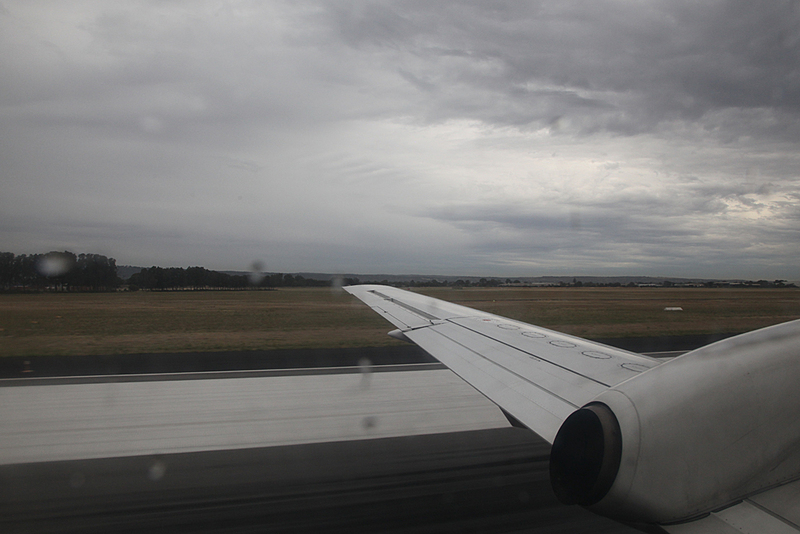 ', as everyone was taking their time to get off the aircraft and there was no mad scramble to be the first off. 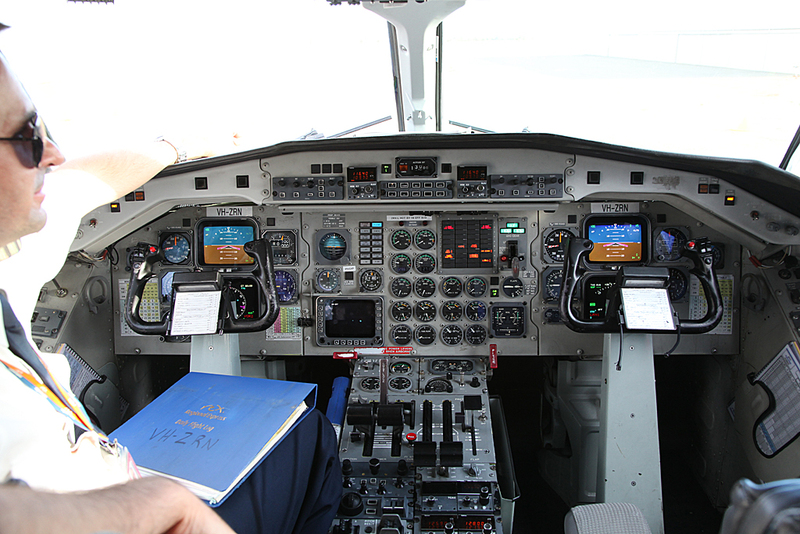 Got the obligatory flight deck photo. 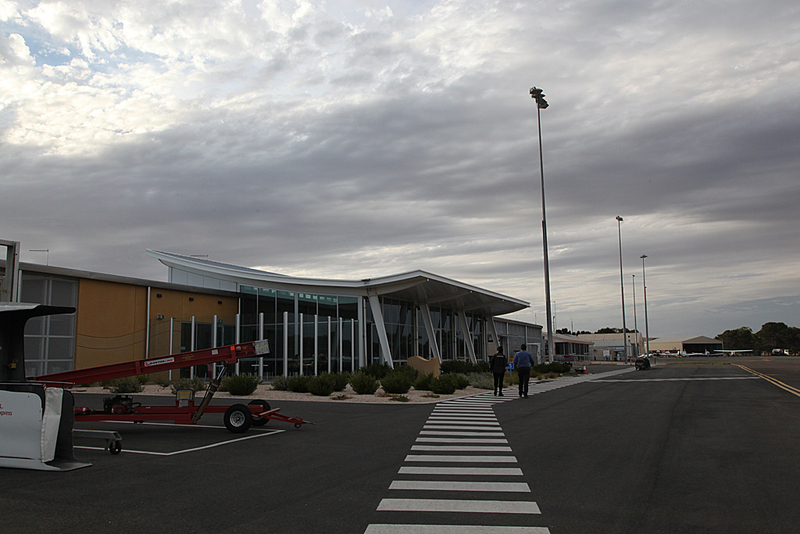 A short walk to the new Port Lincoln terminal which has been in operation for about a year now. 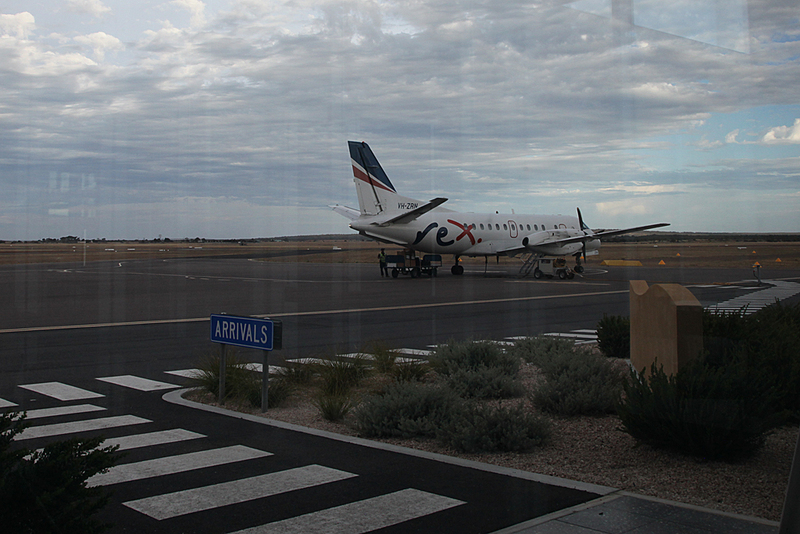 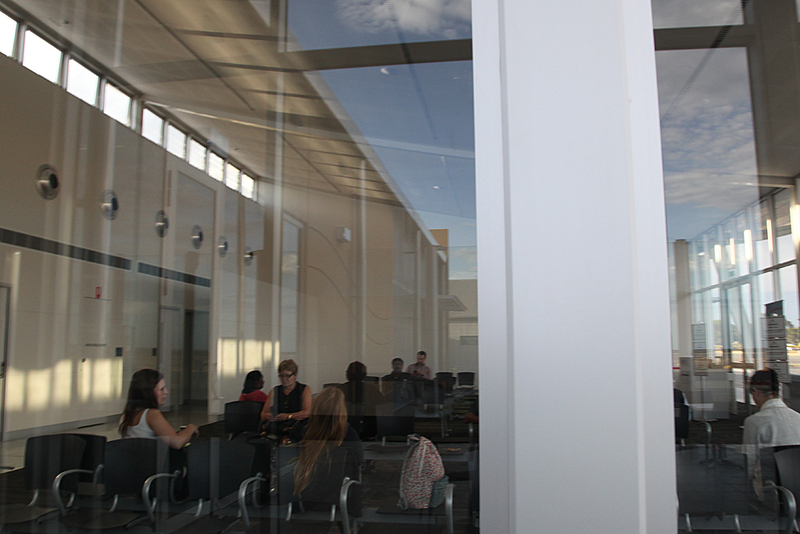 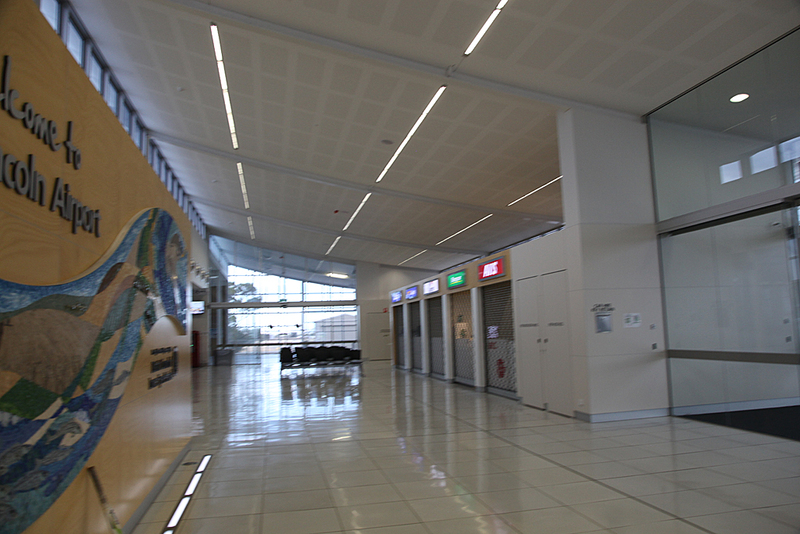 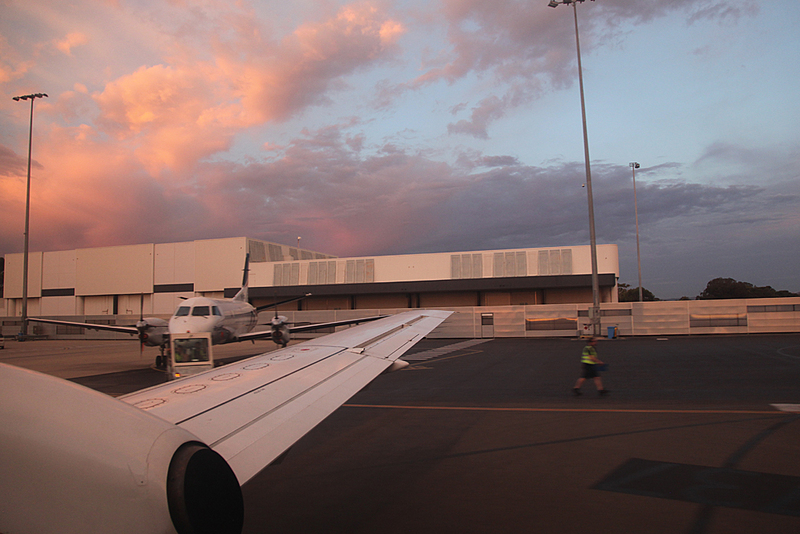 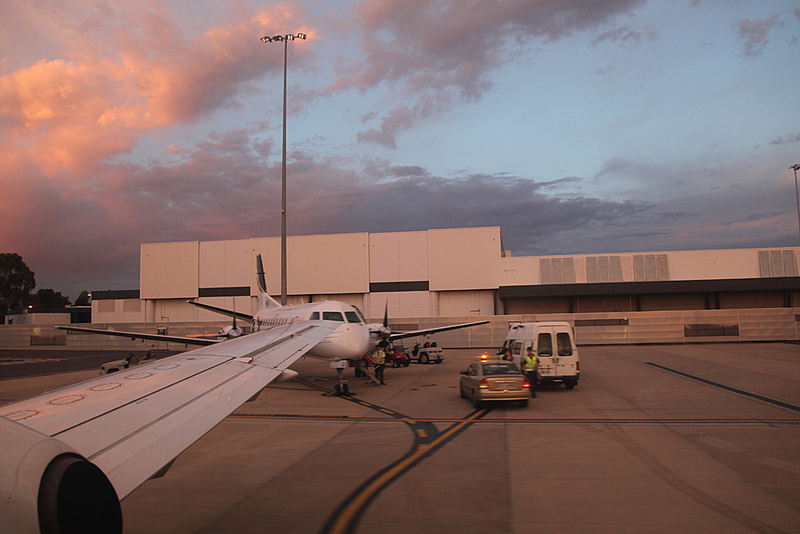 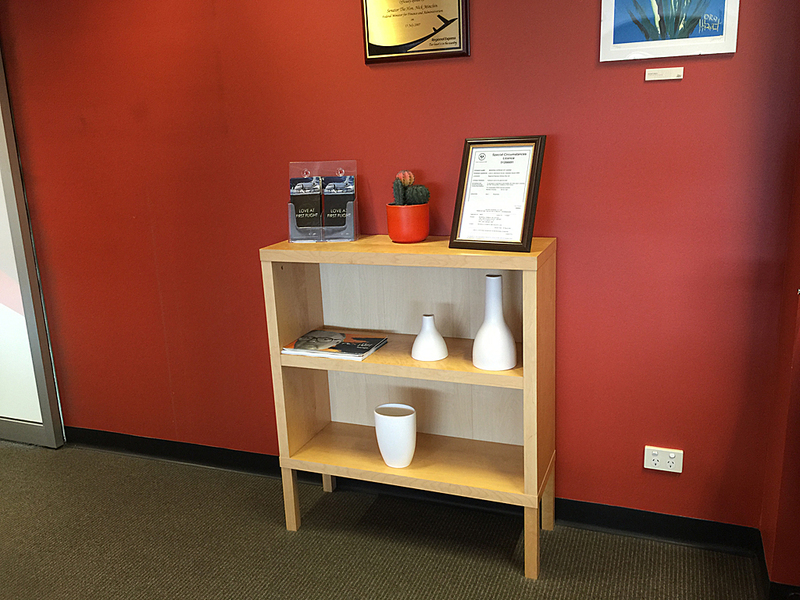 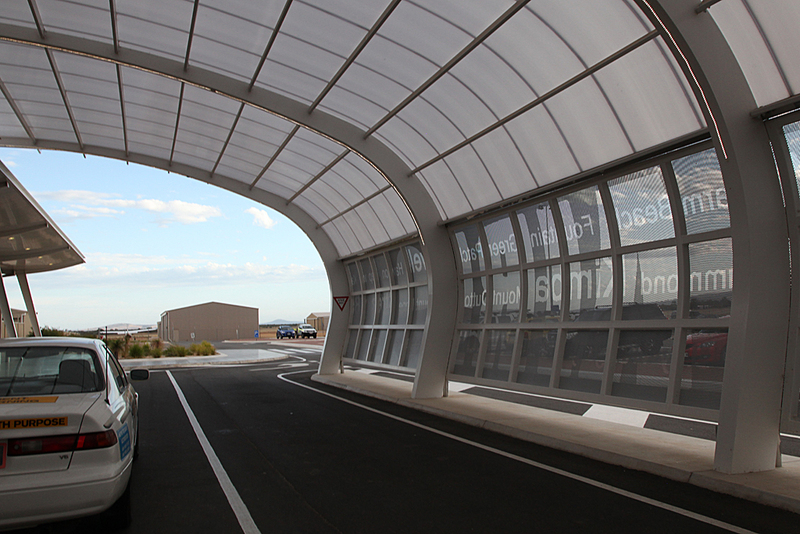 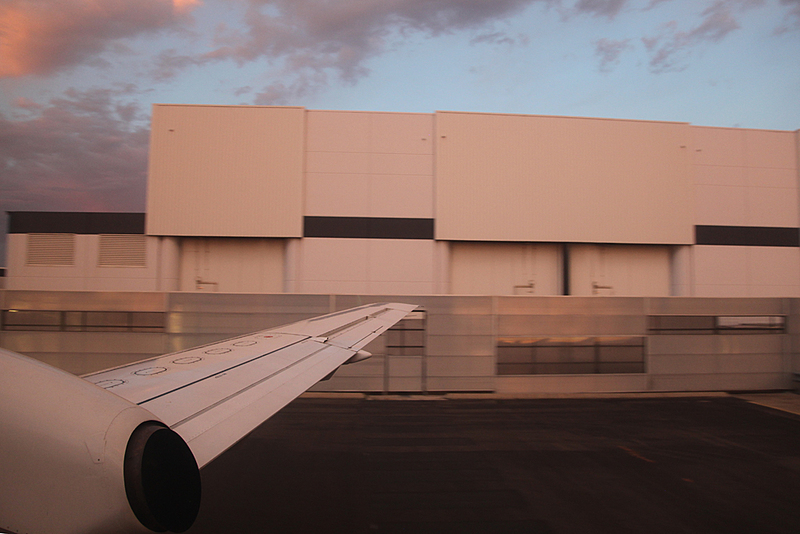 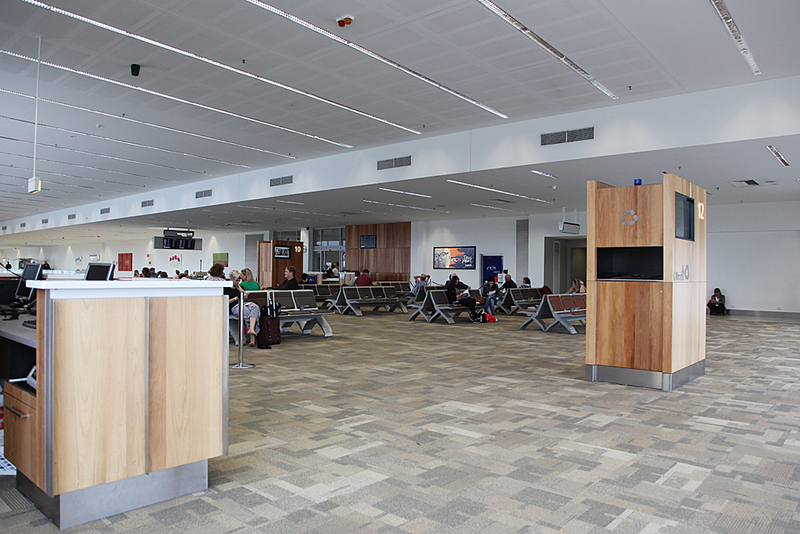 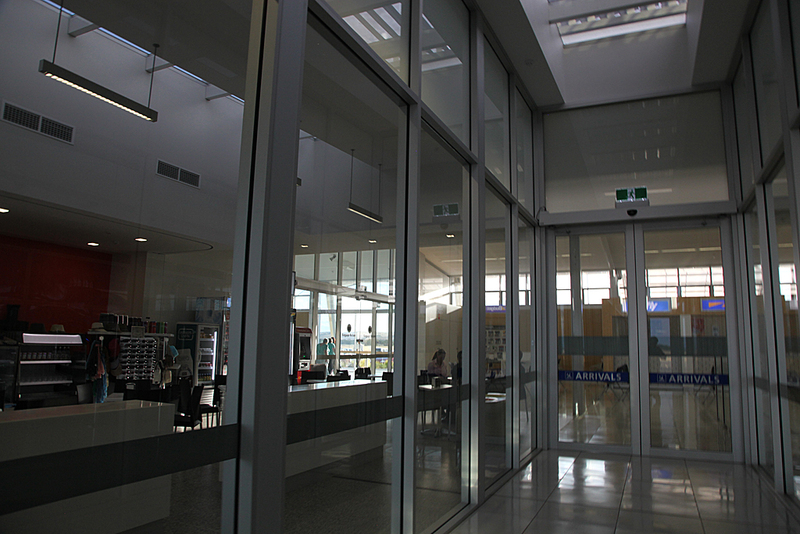 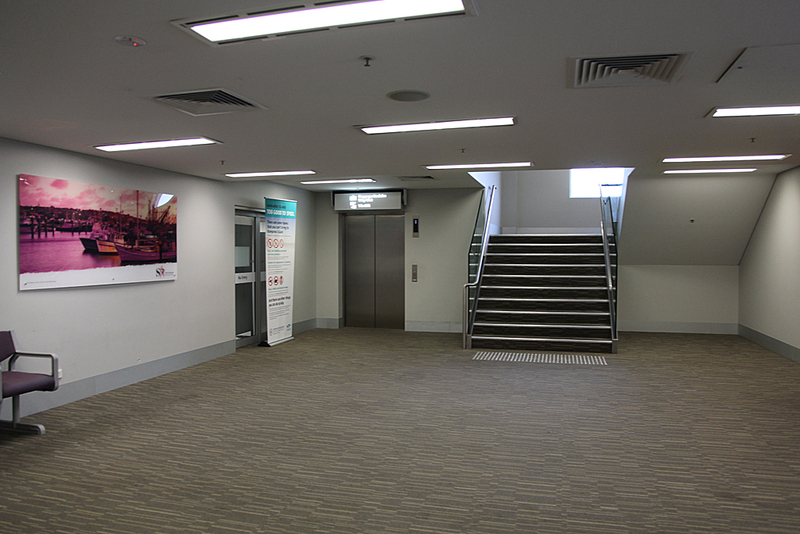 Externally it looks like Kalgoorlie airport in Western Australia and internally, looks like a mini Adelaide airport. 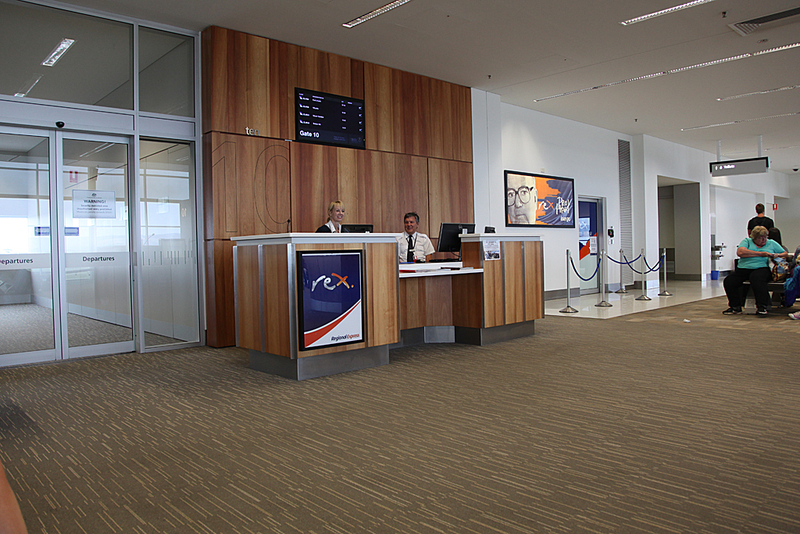 Quick and easy check in for the return. 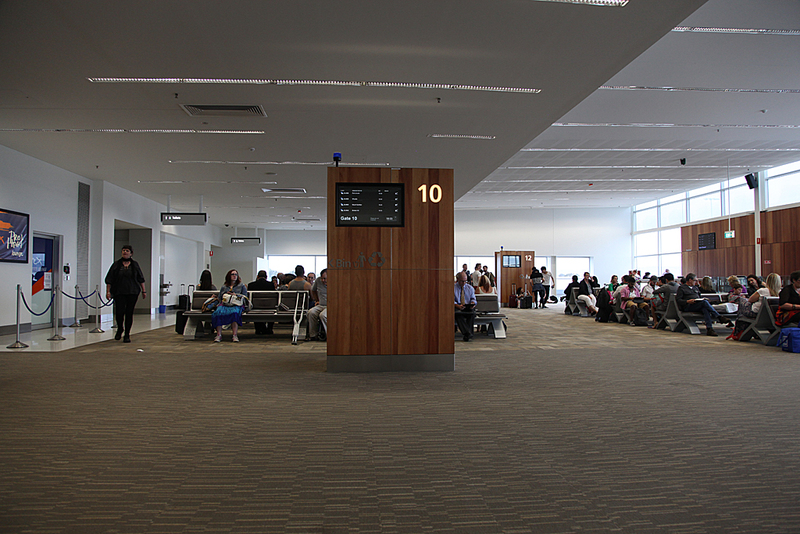 Barely had time to look about the terminal and gate area before it was time to board the aircraft for the flight home. 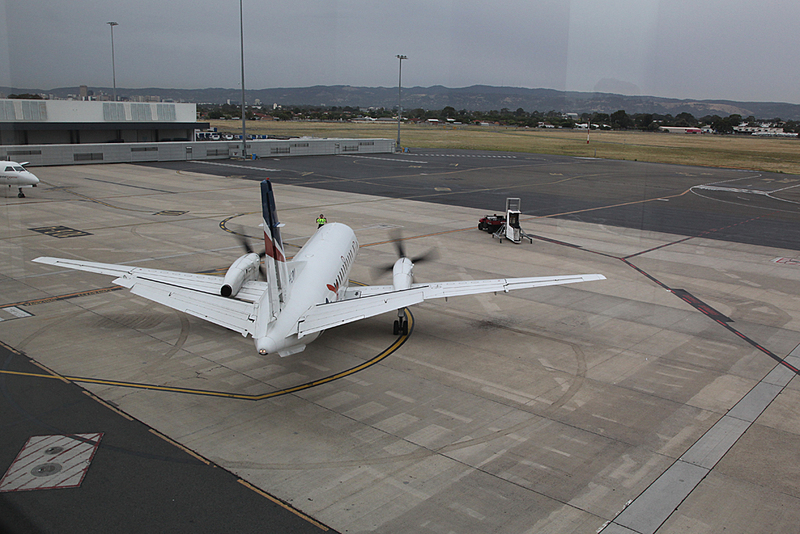 Load was about a third full for the return to Adelaide. 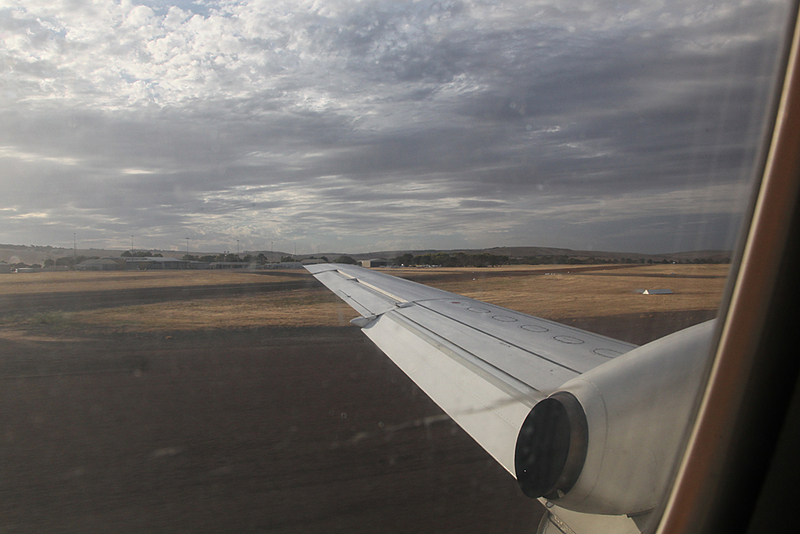 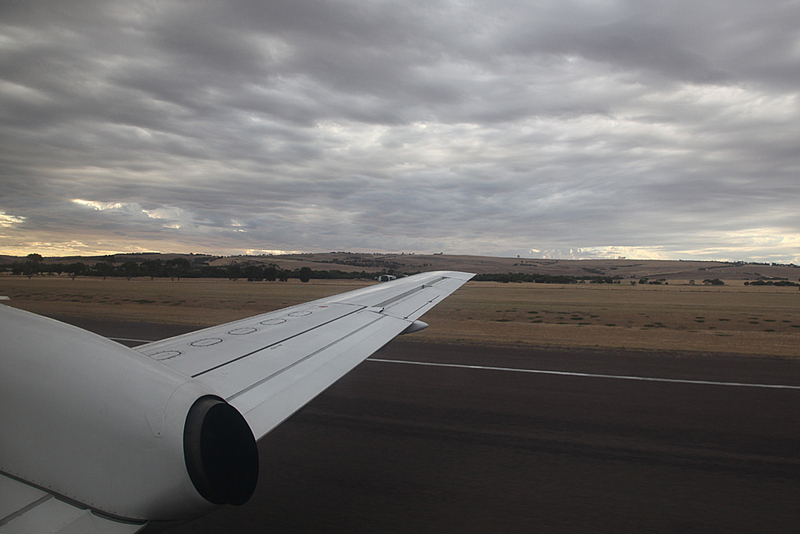 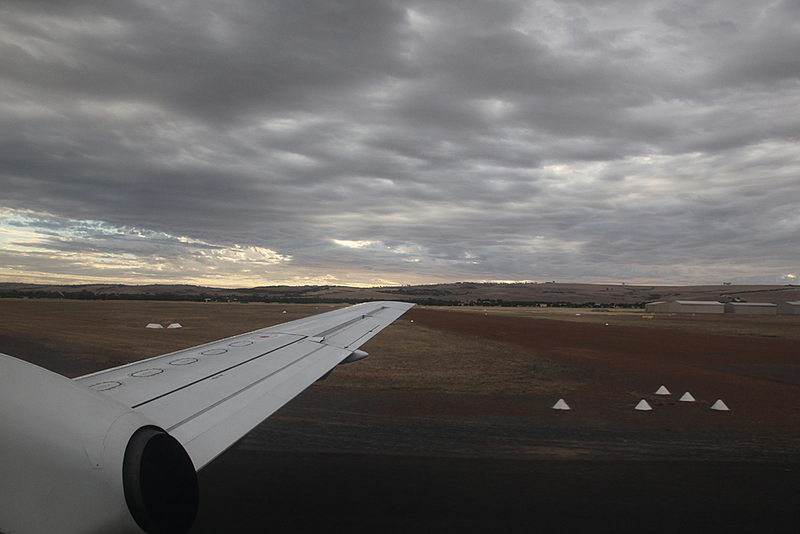 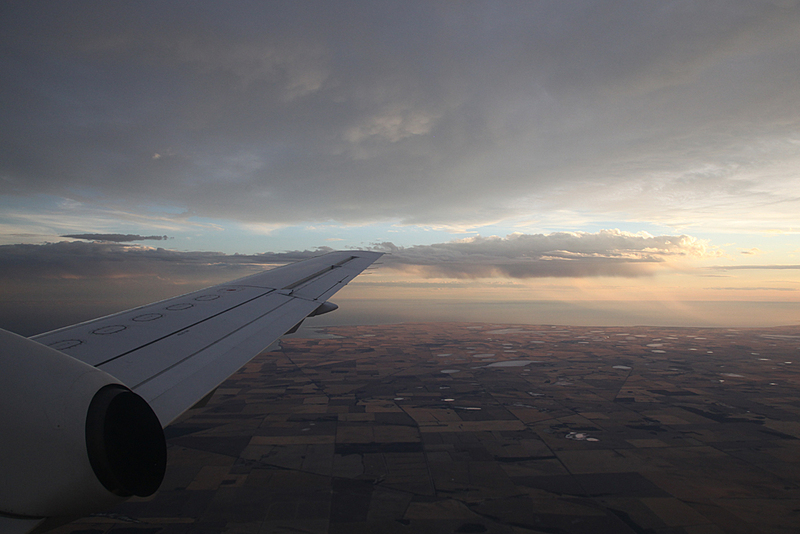 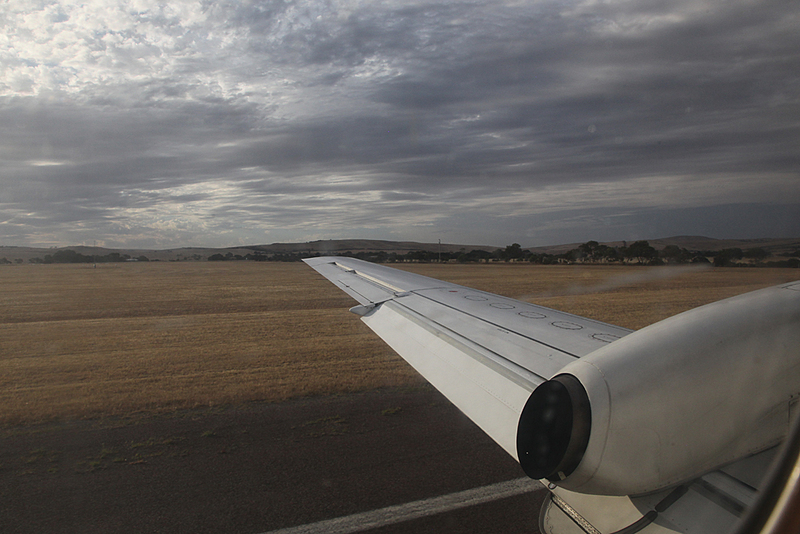 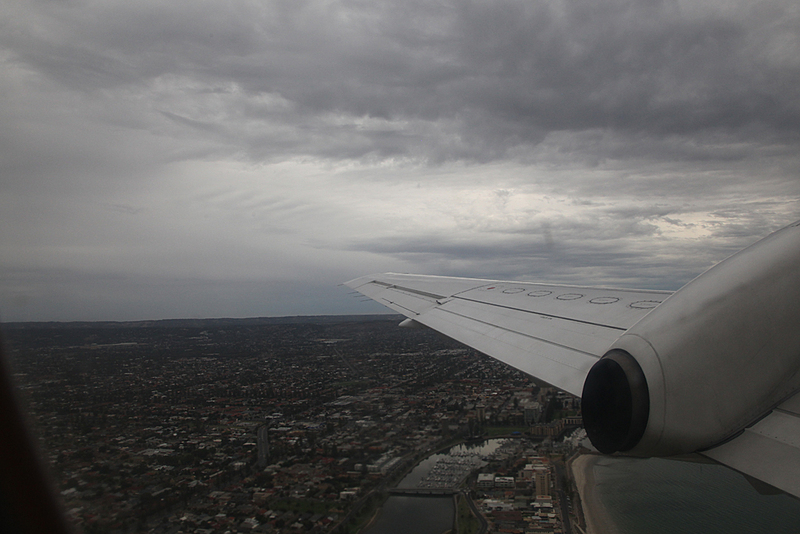 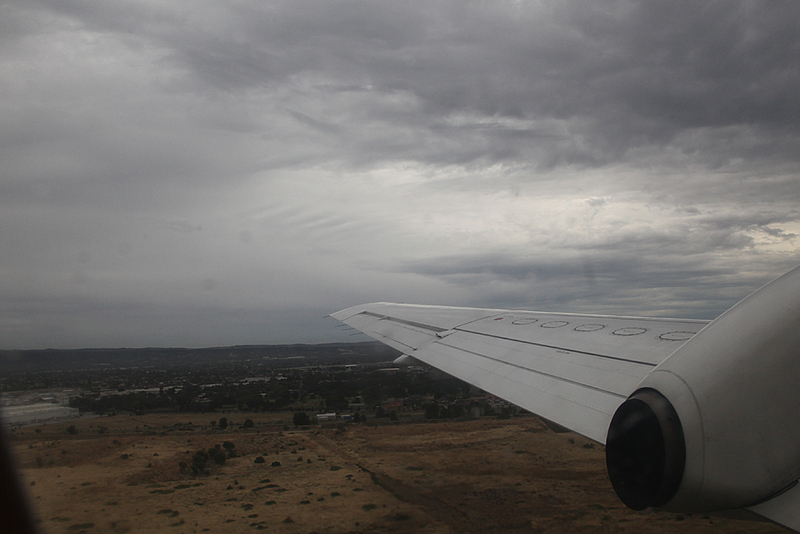 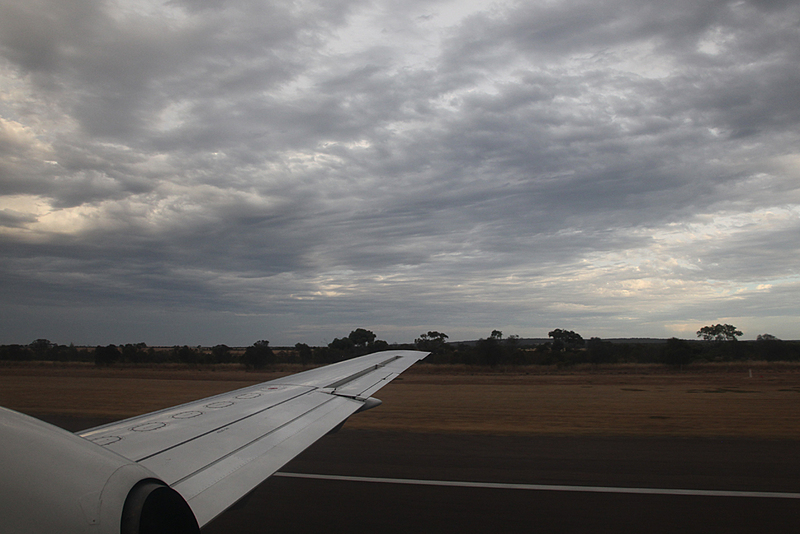 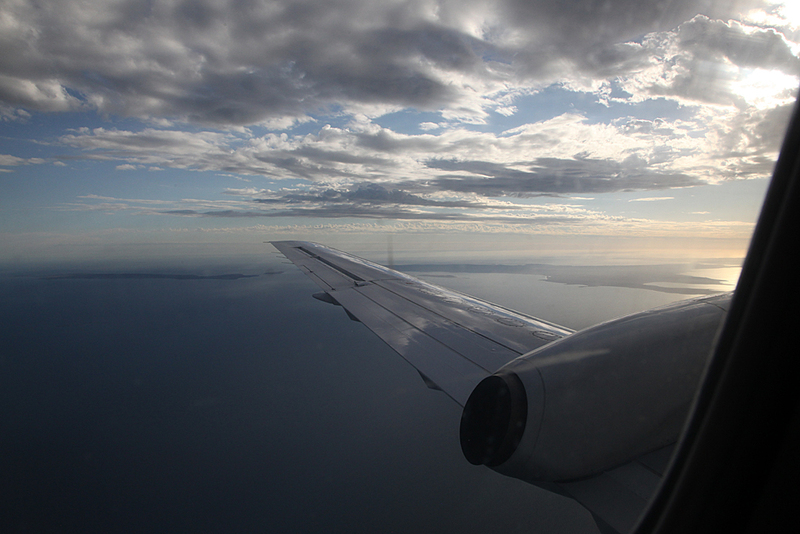 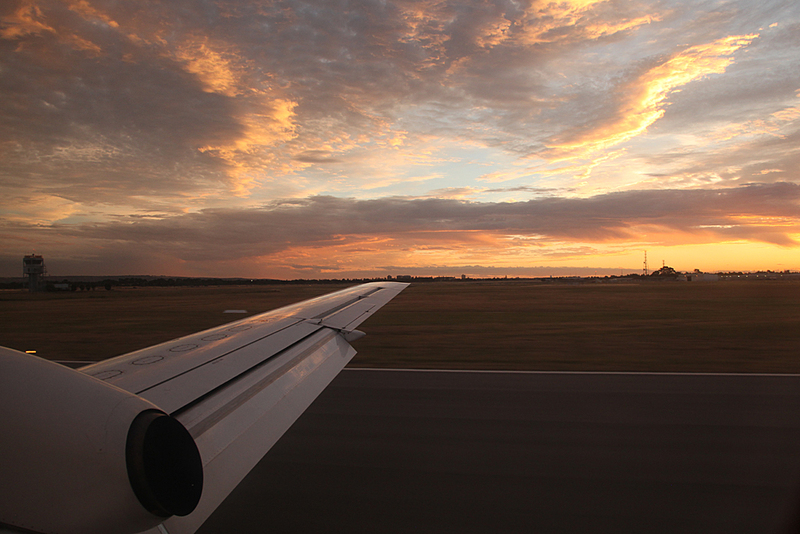 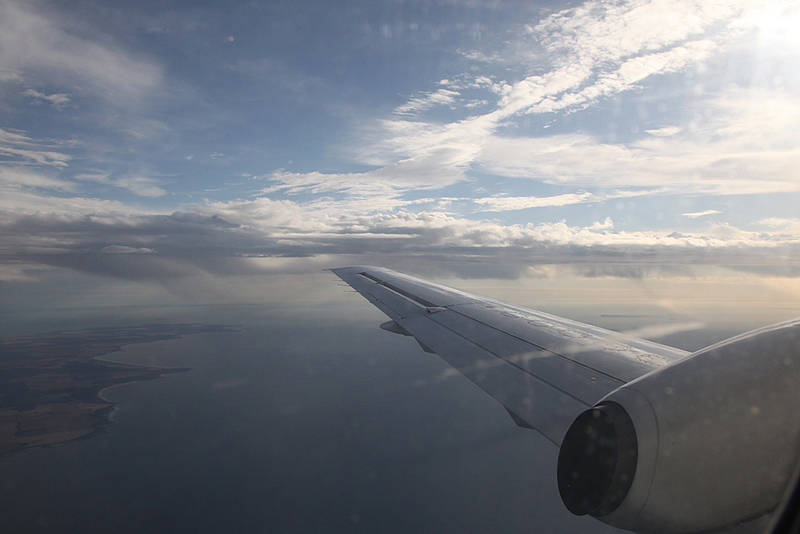 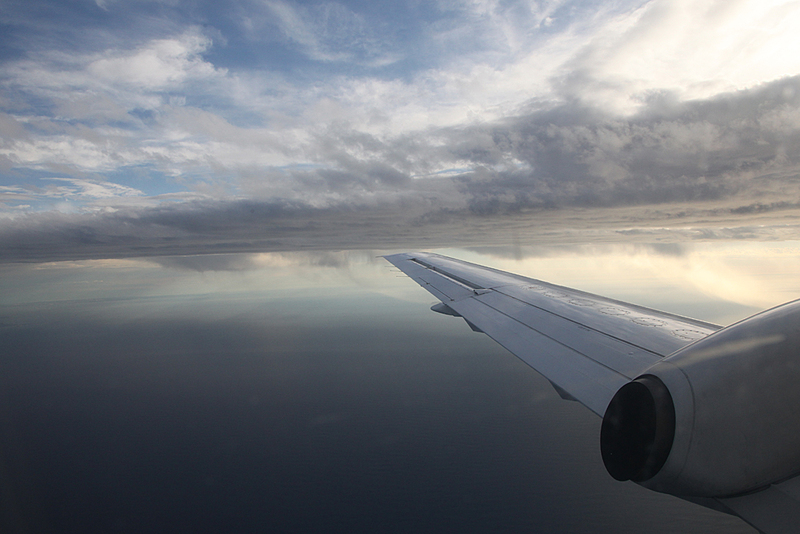 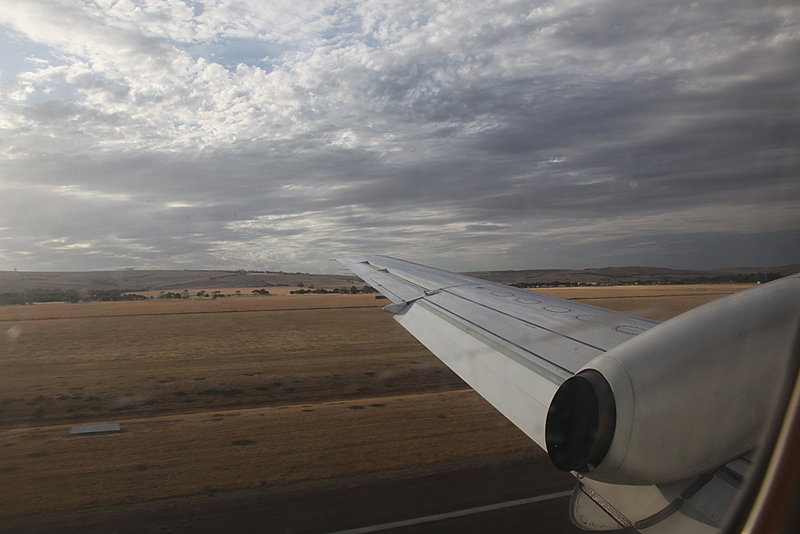 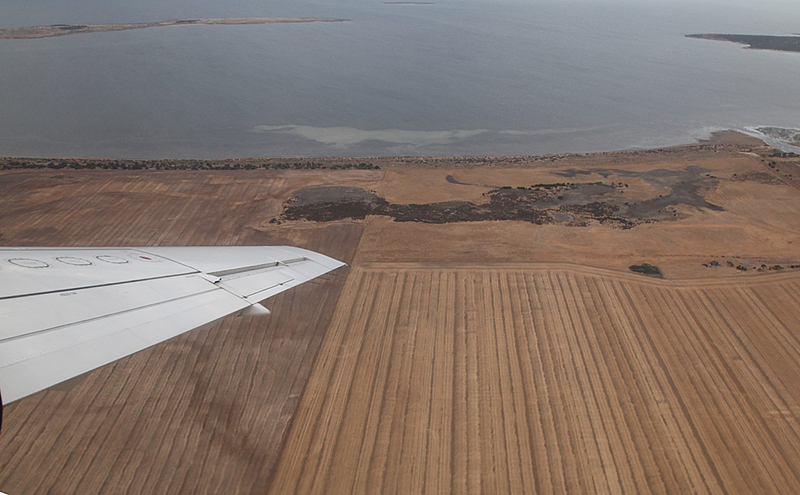 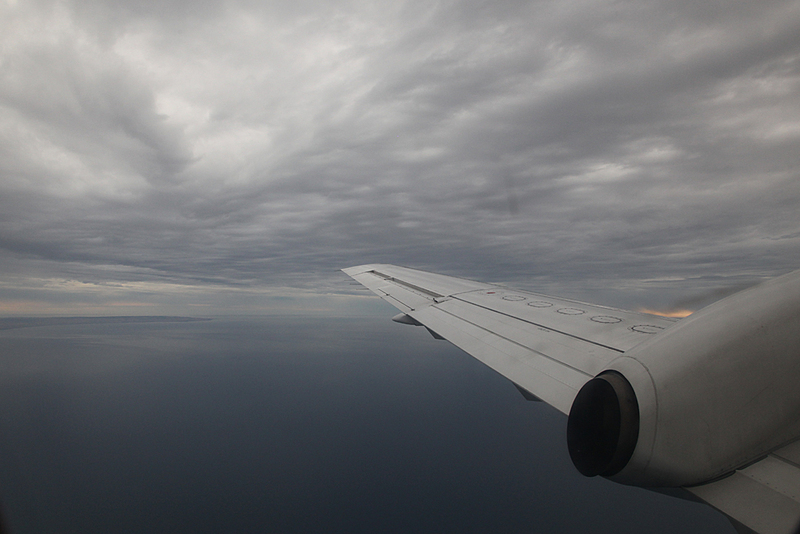 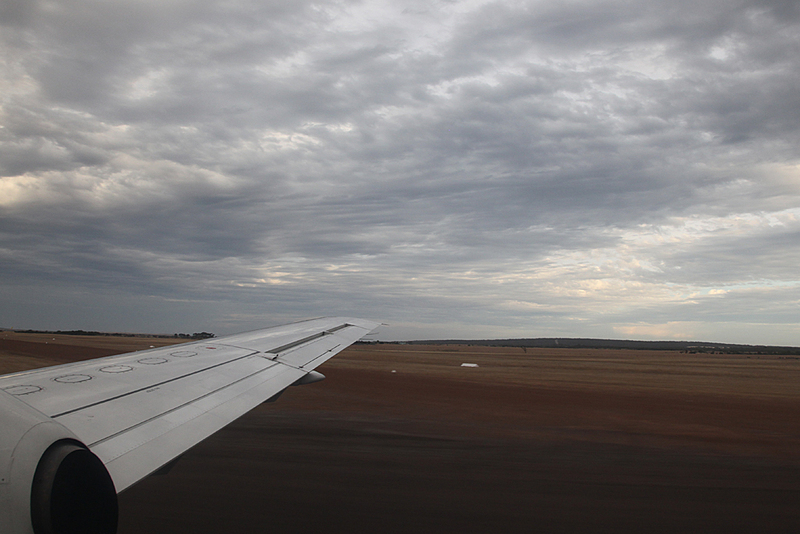 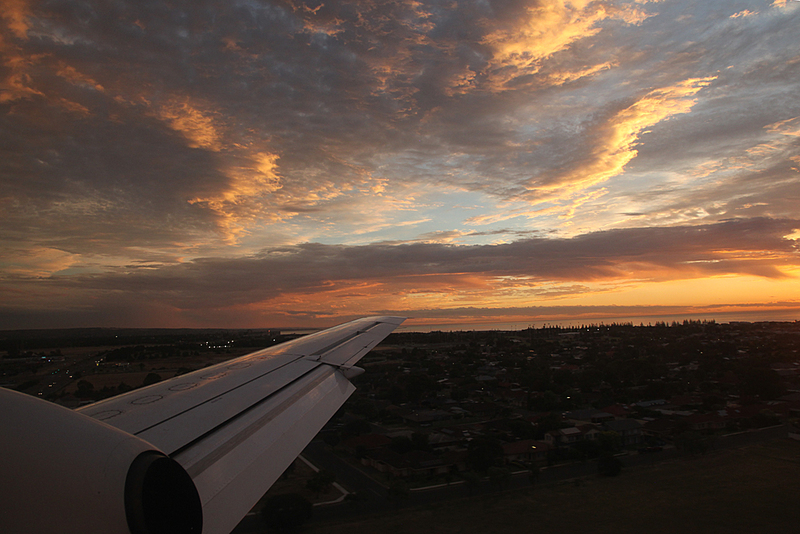 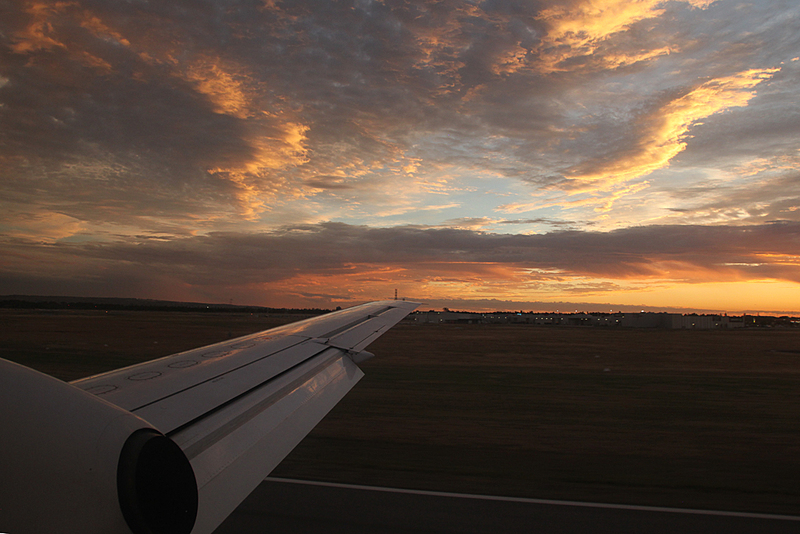 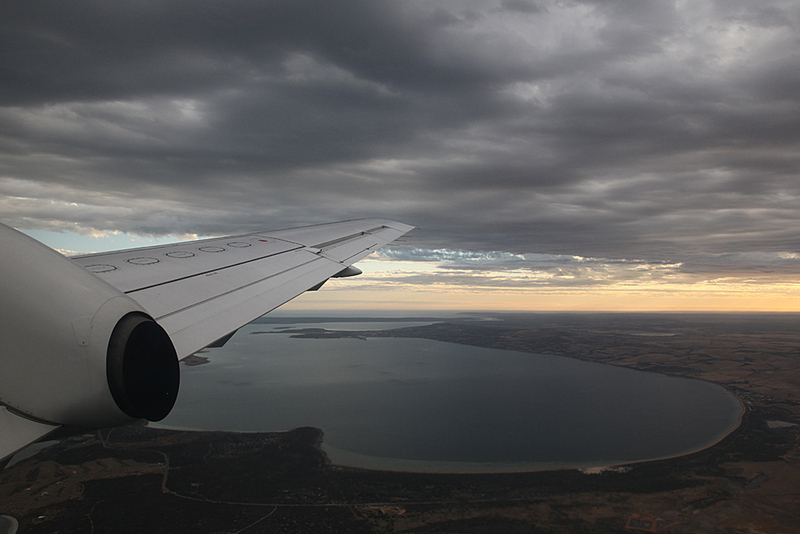 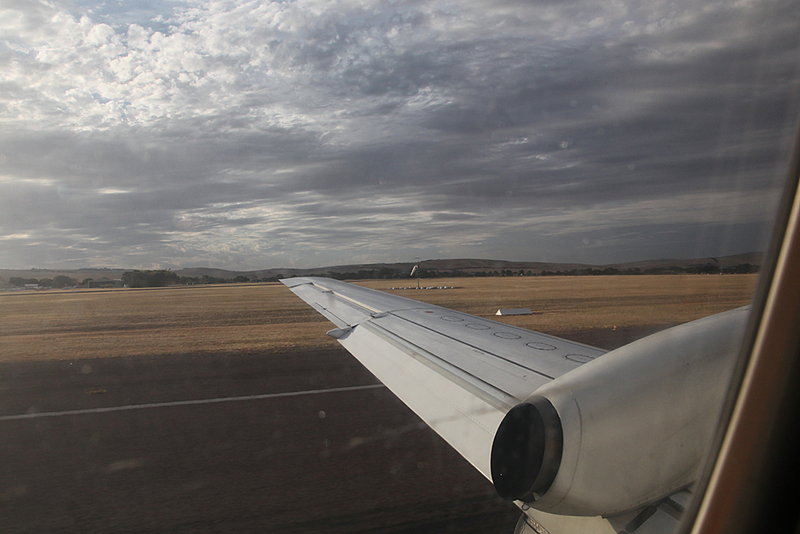 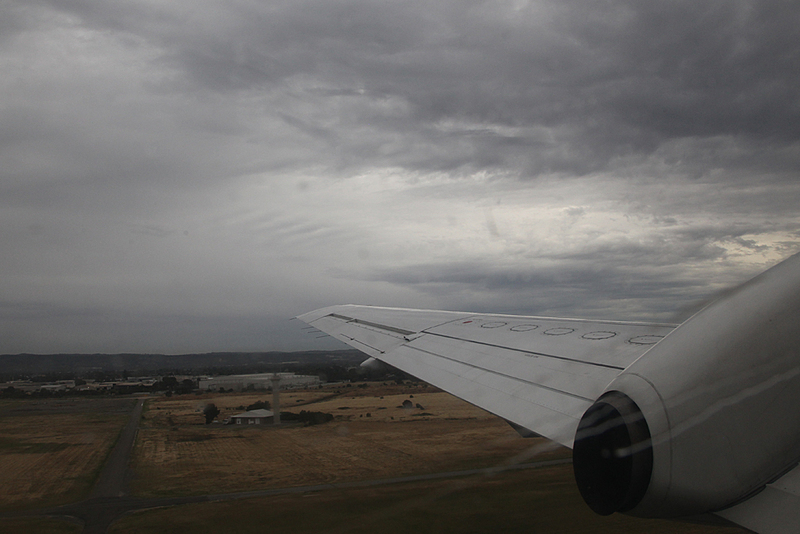 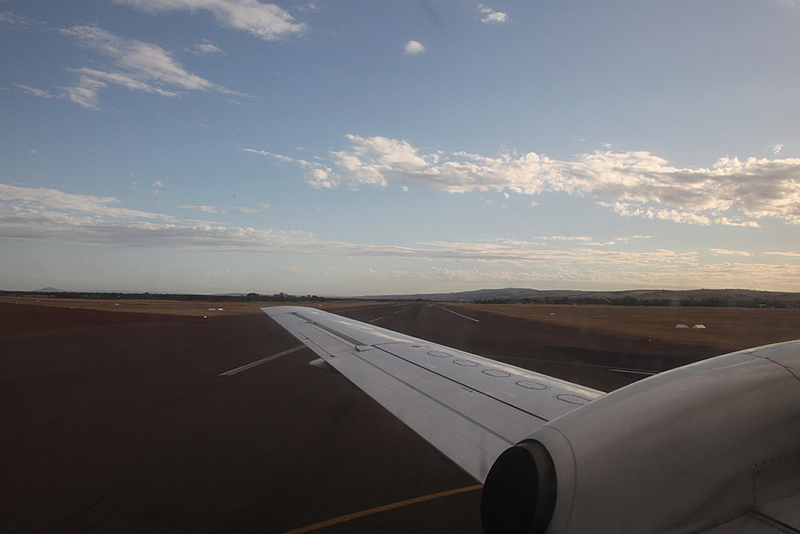 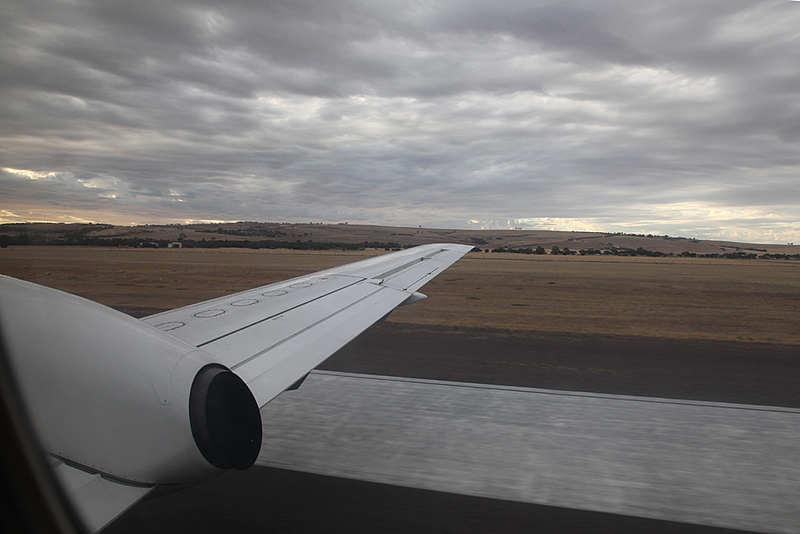 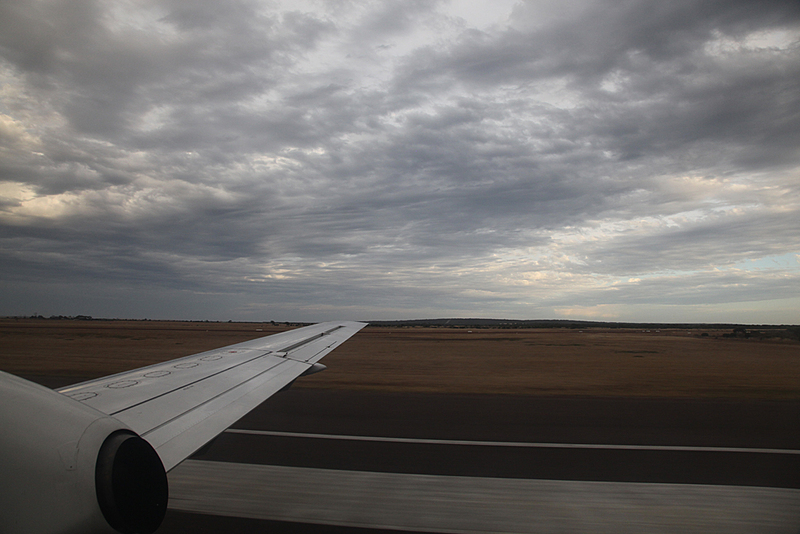 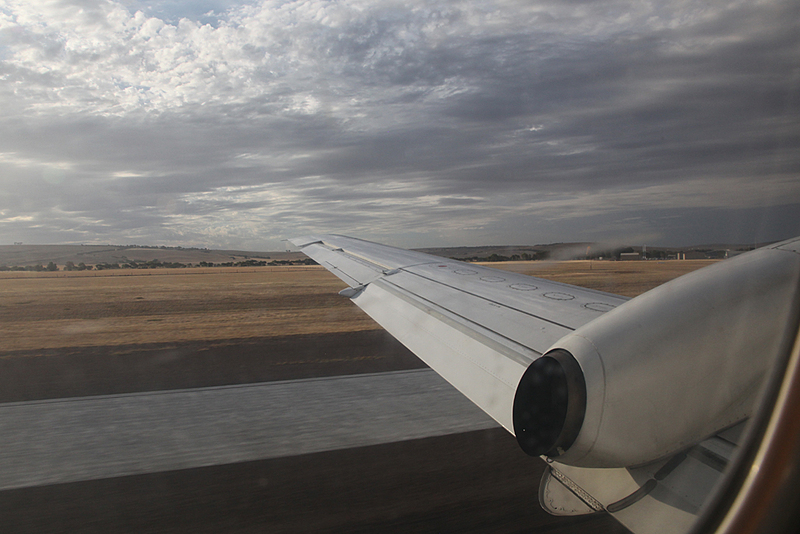 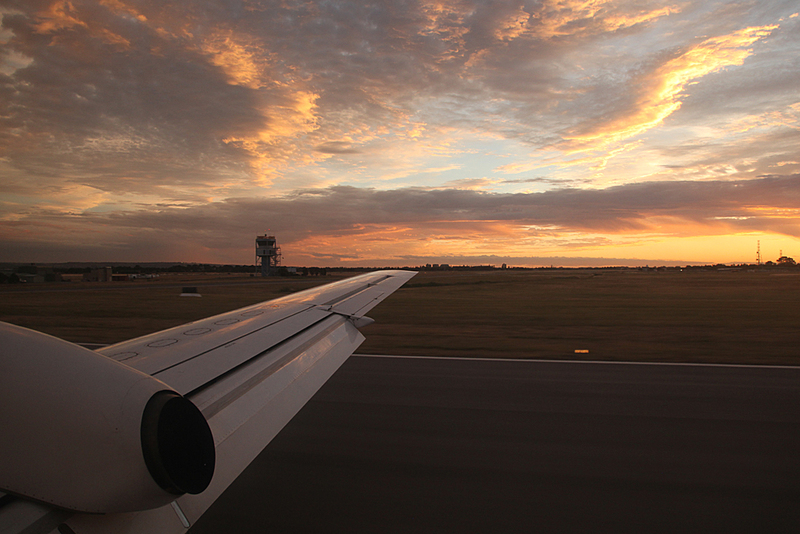 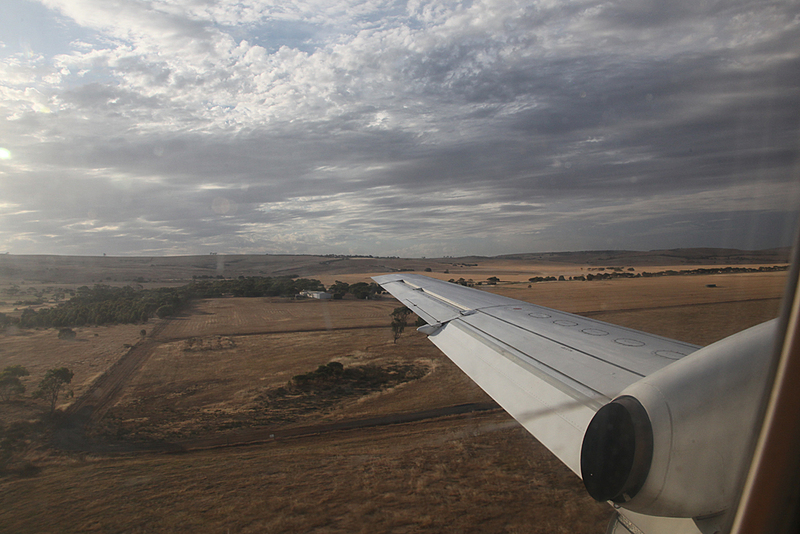 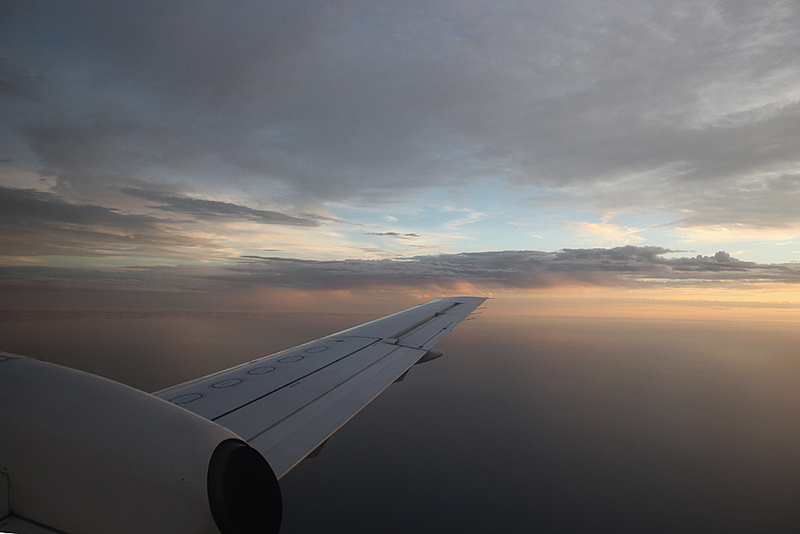 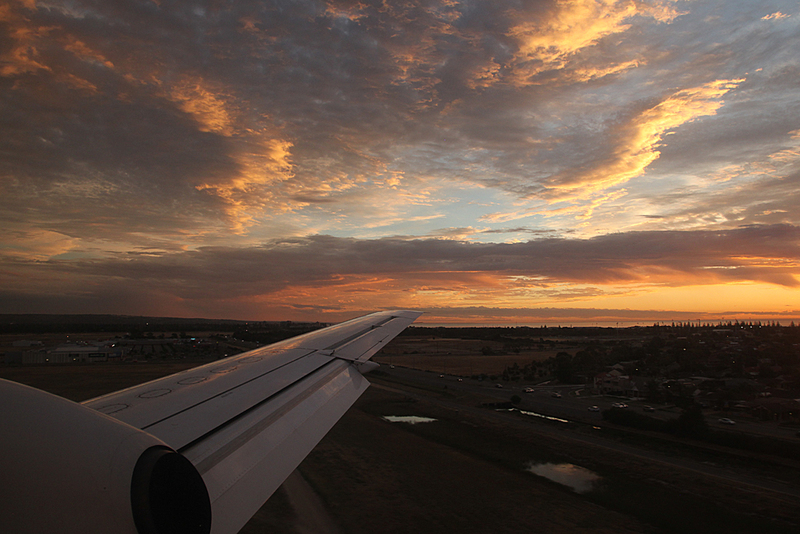 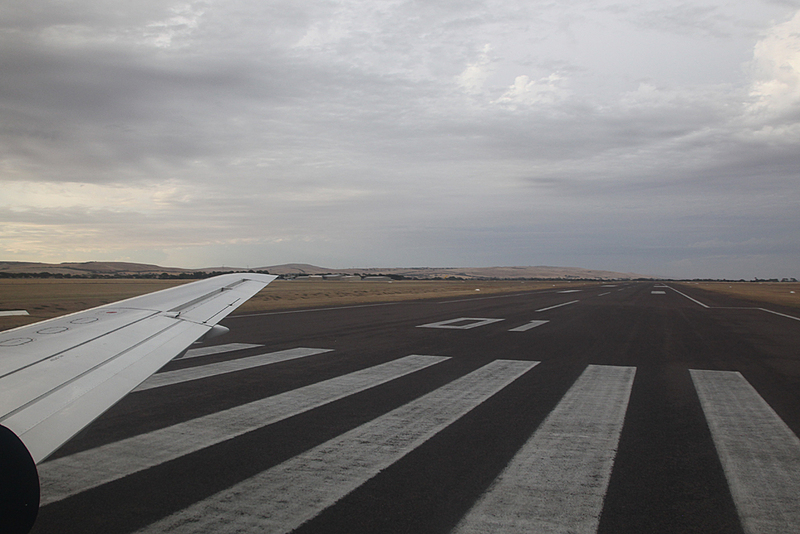 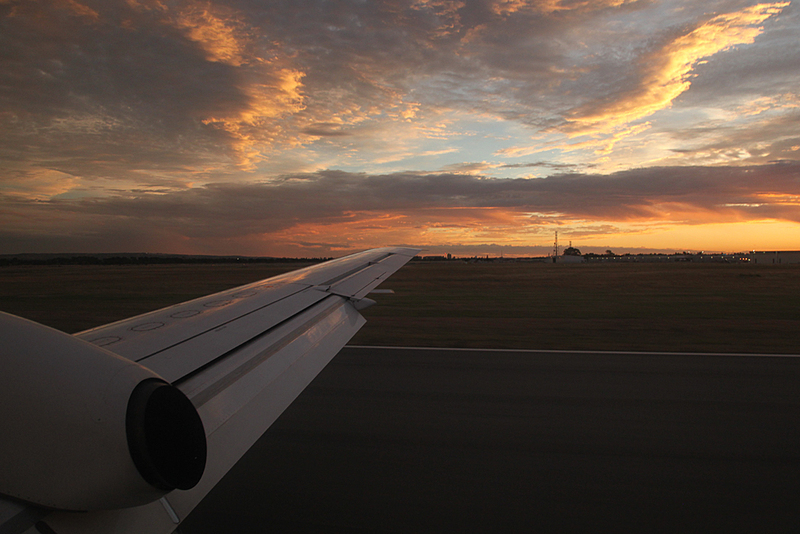 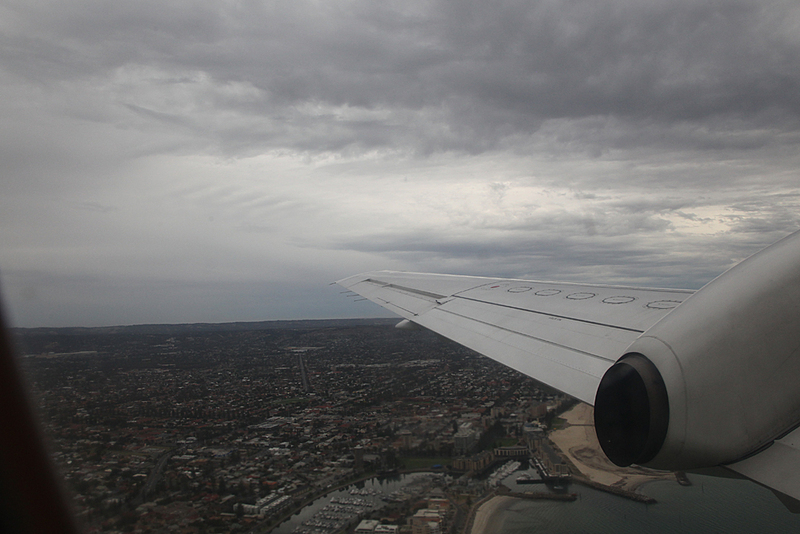 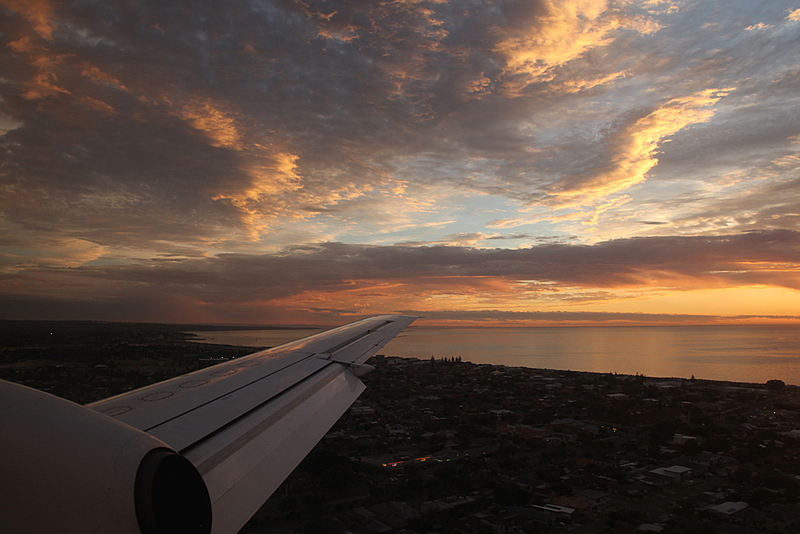 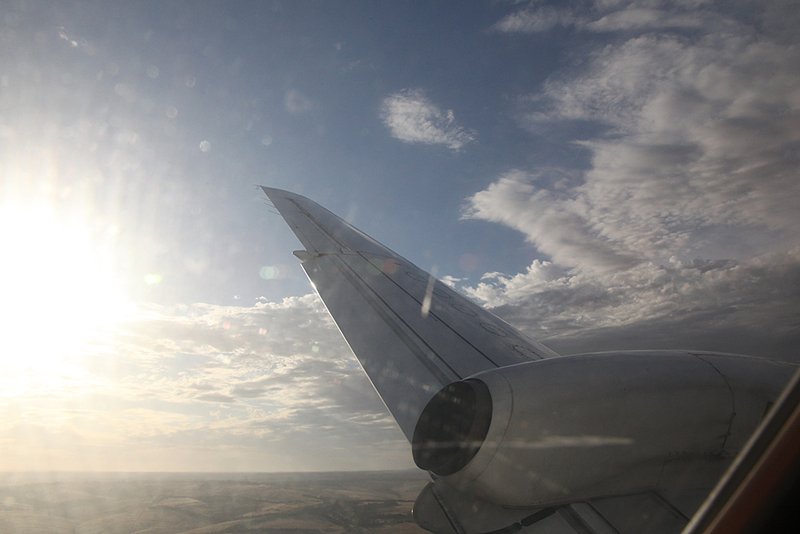 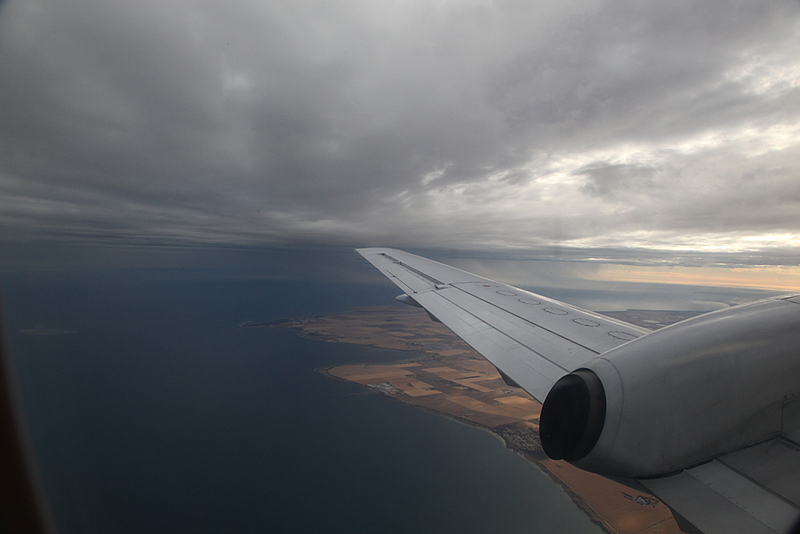 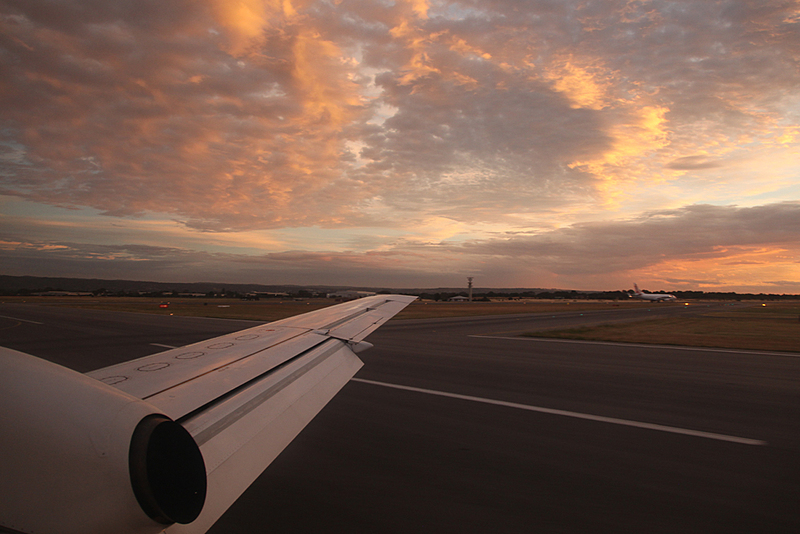 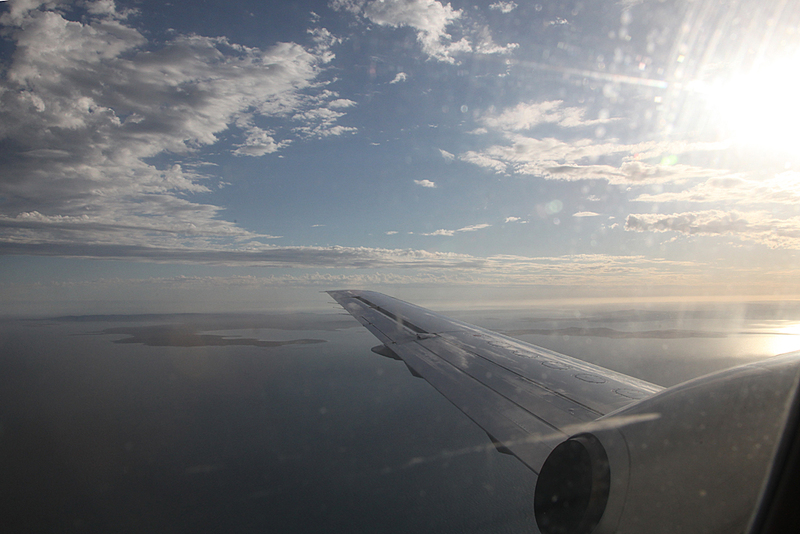 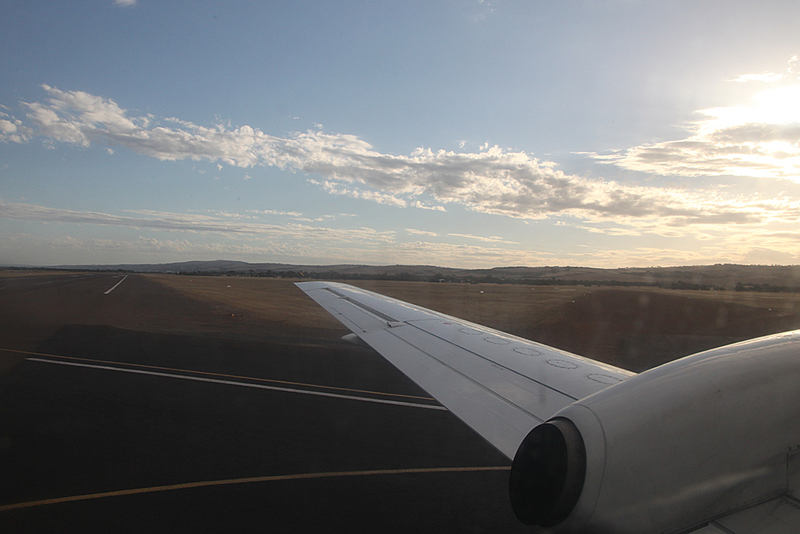 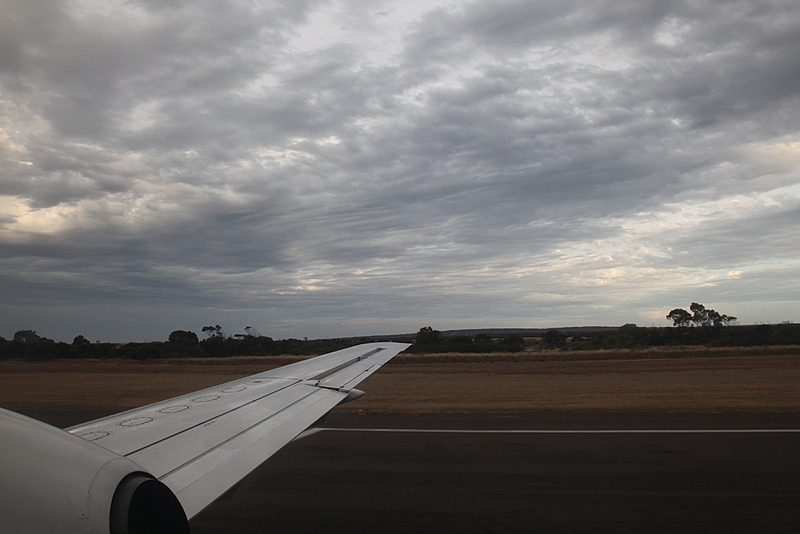 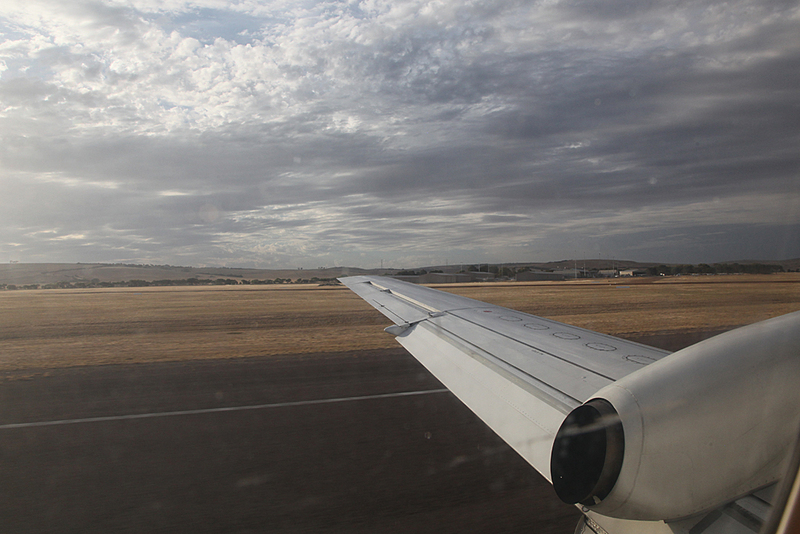 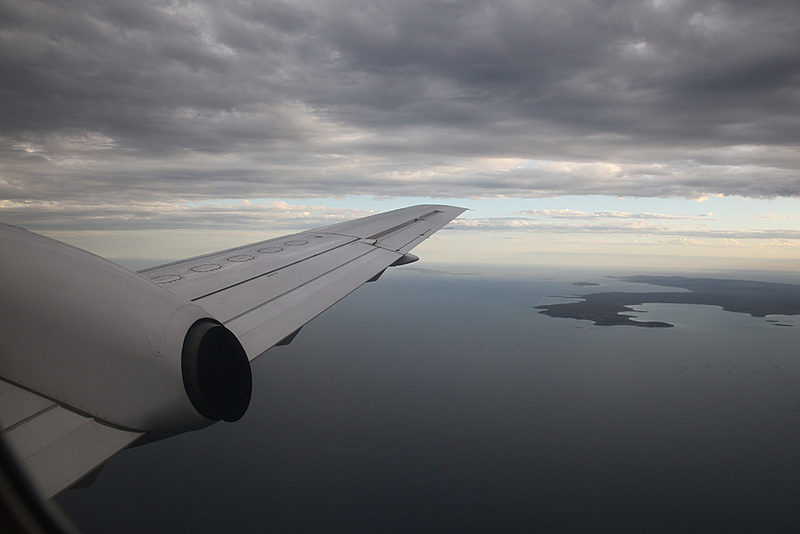 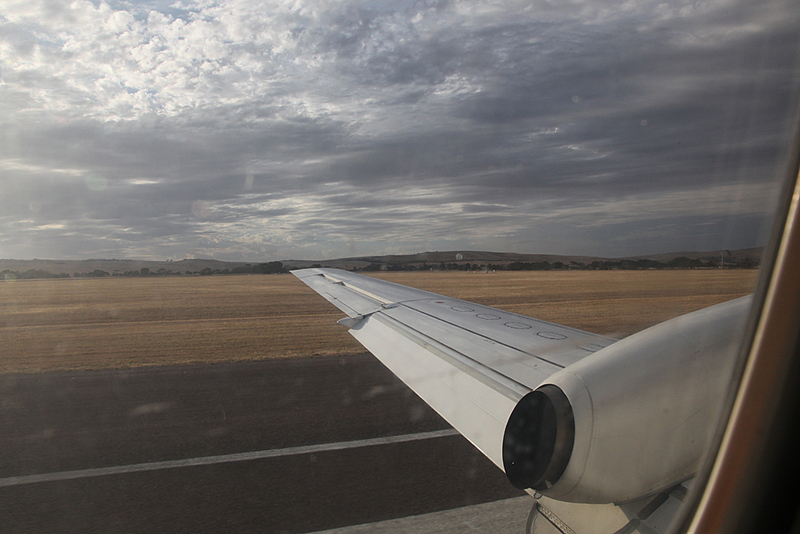 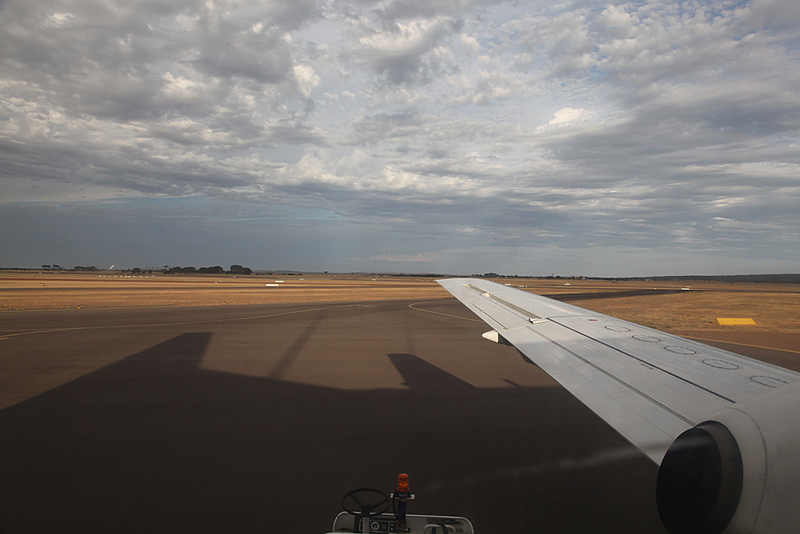 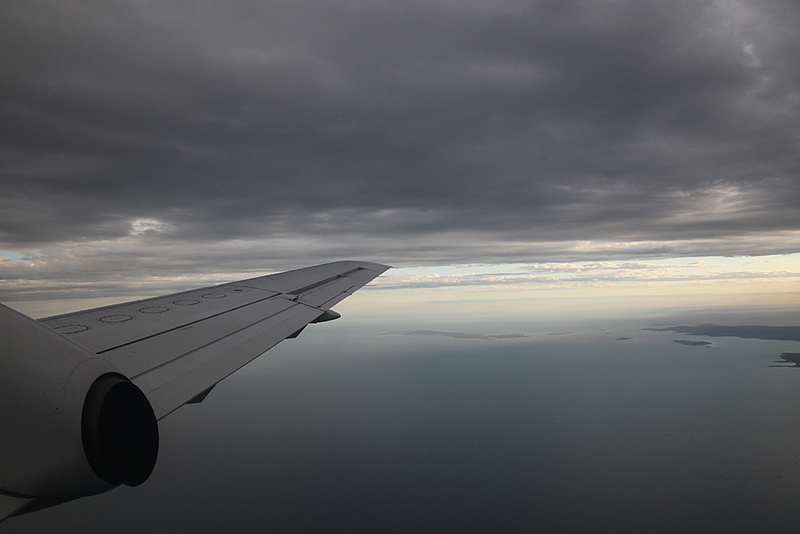 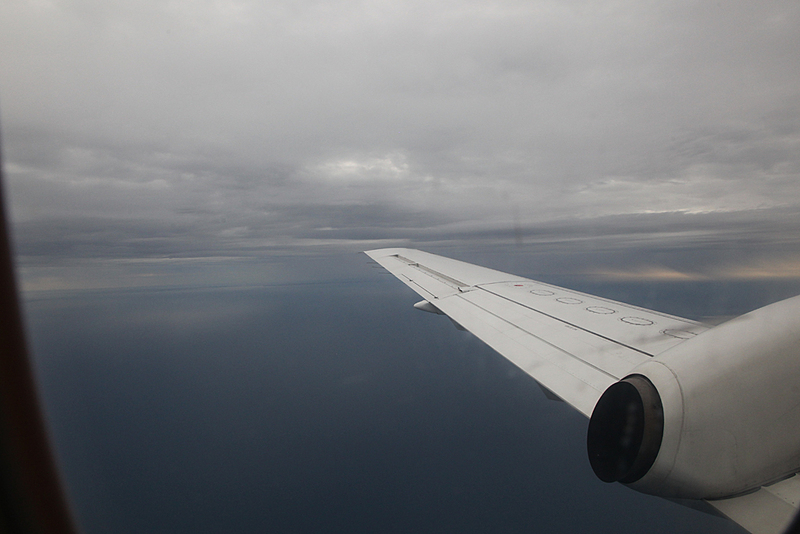 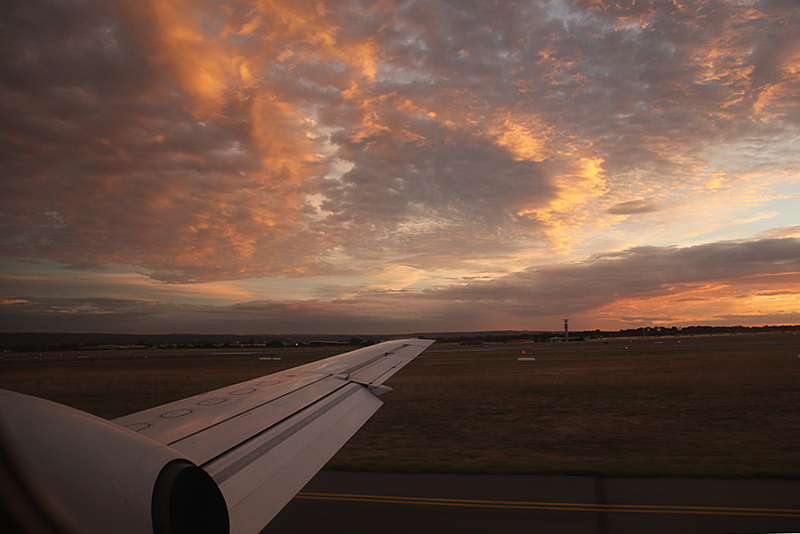 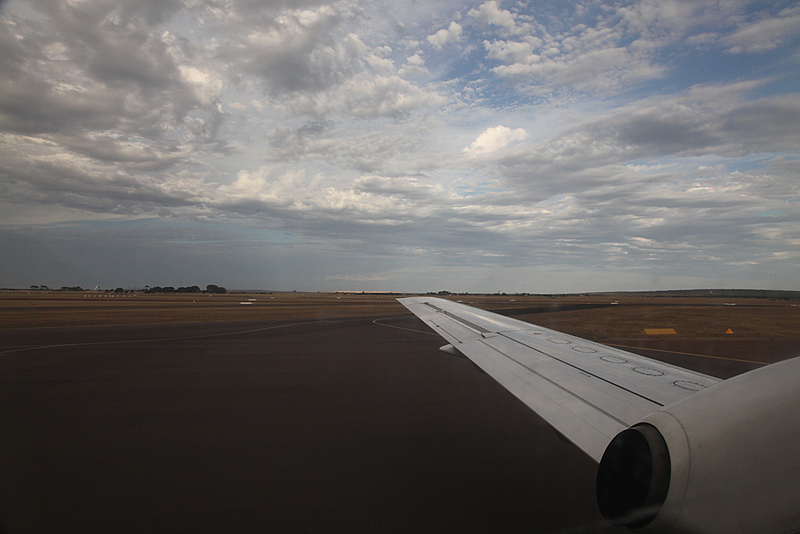 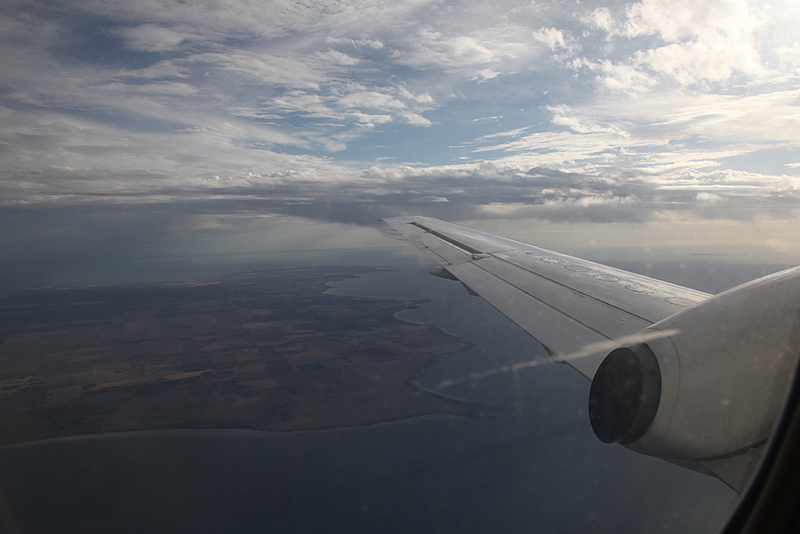 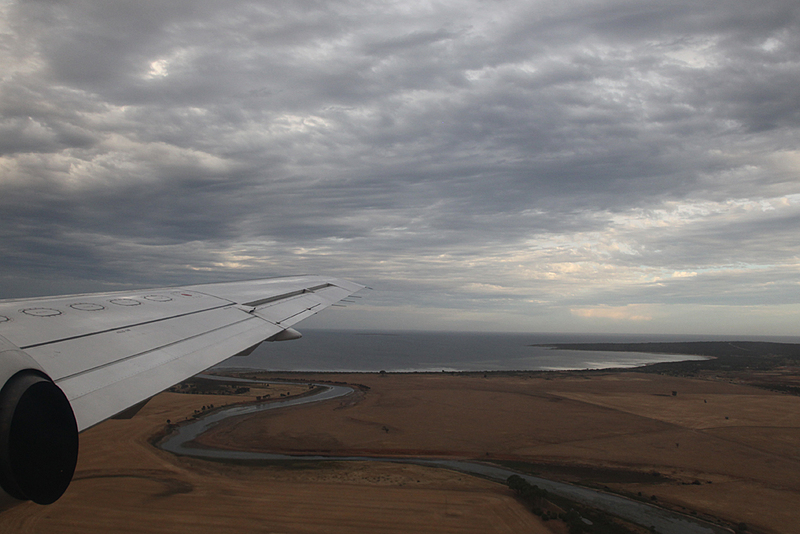 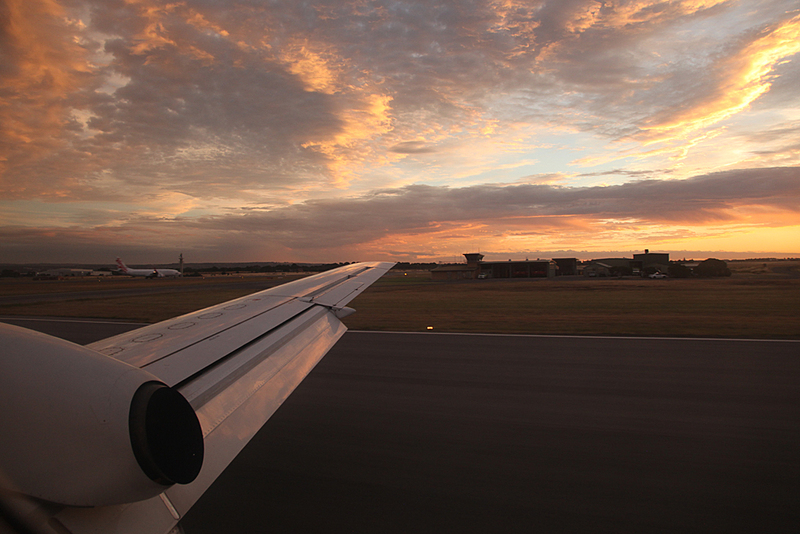 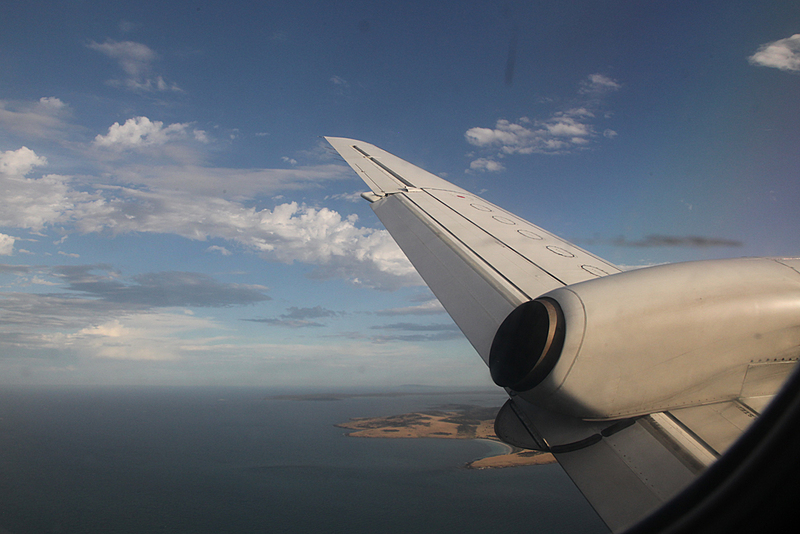 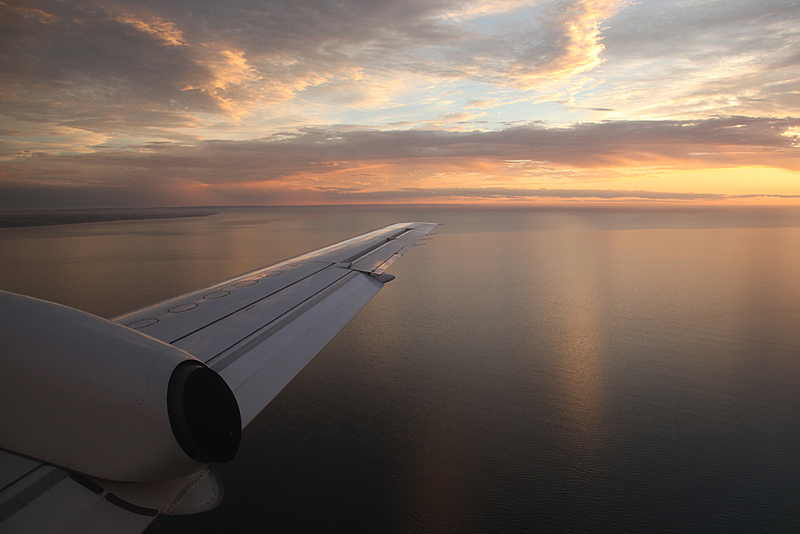 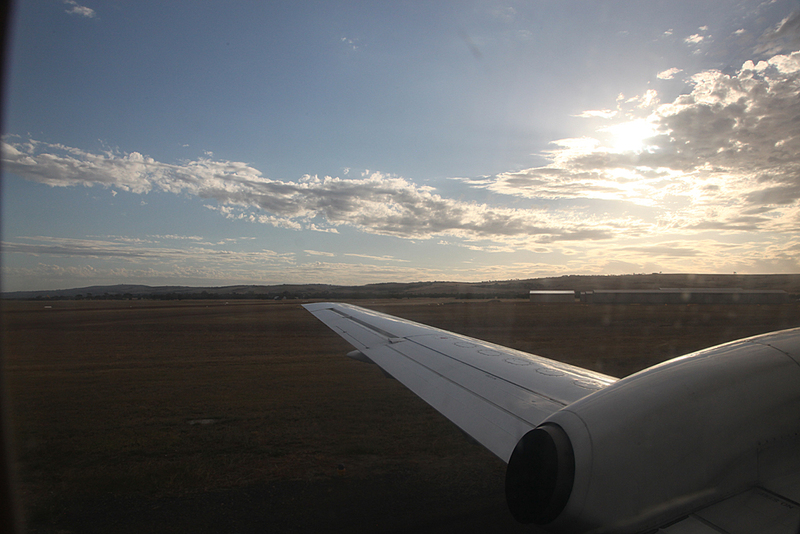 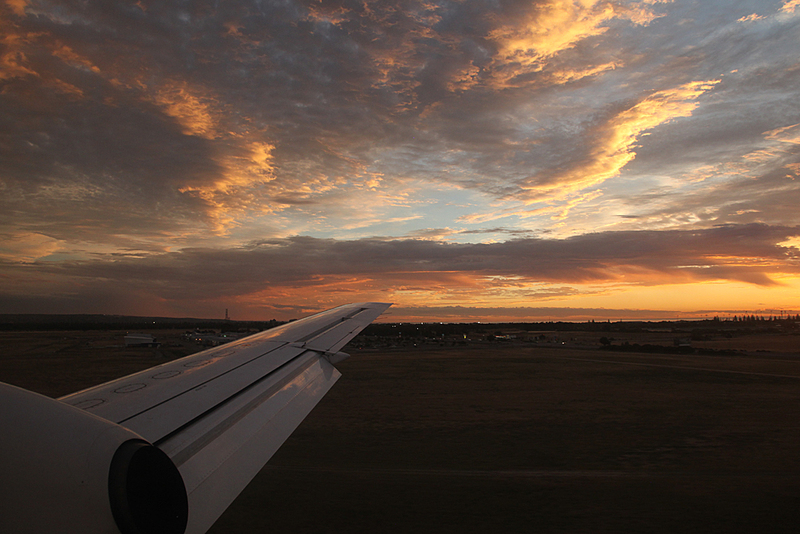 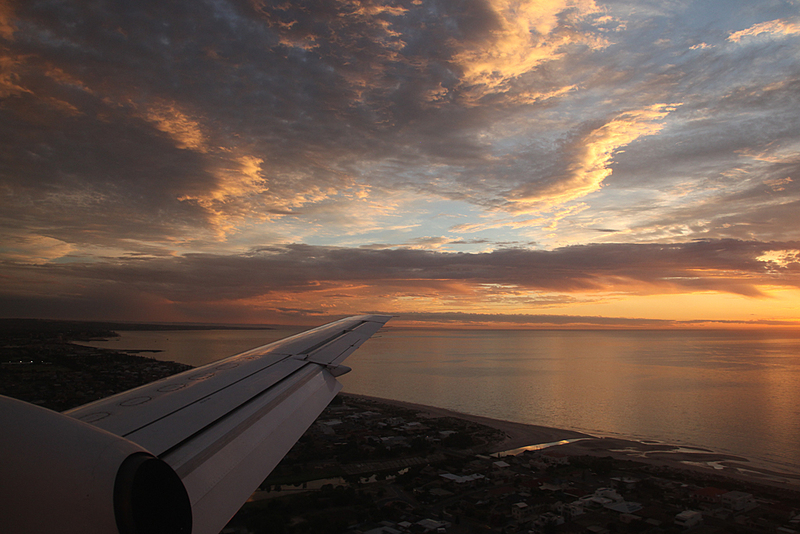 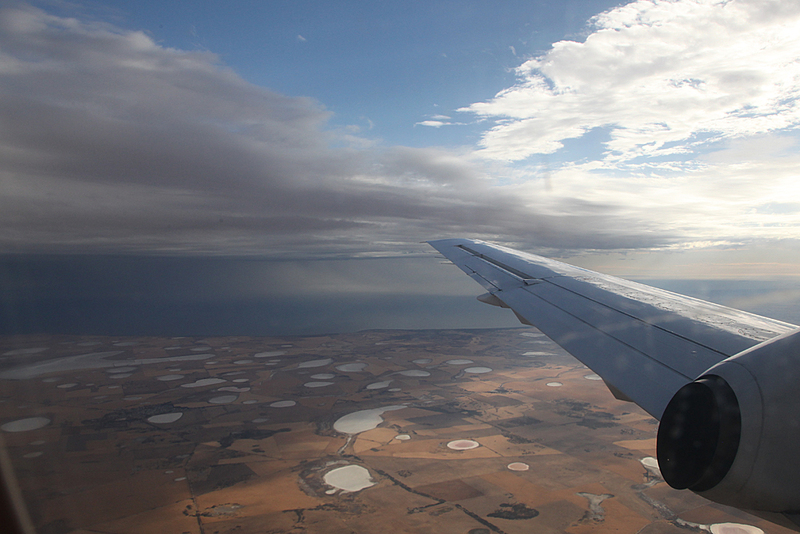 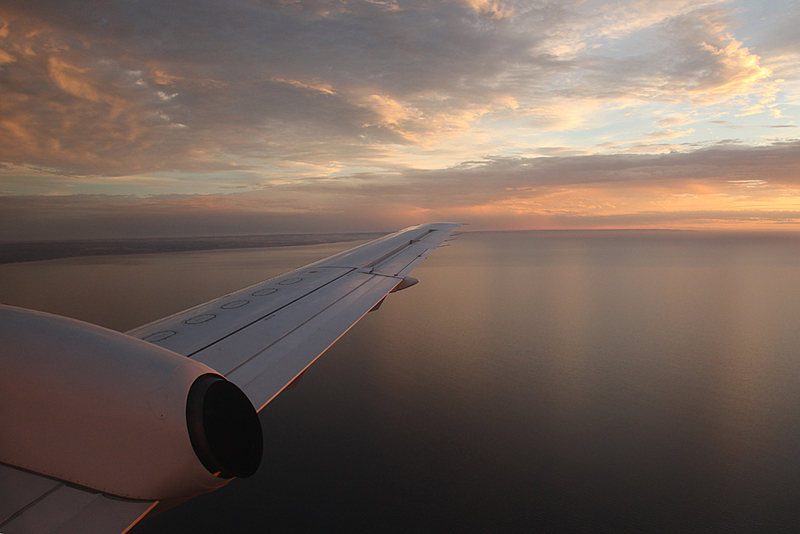 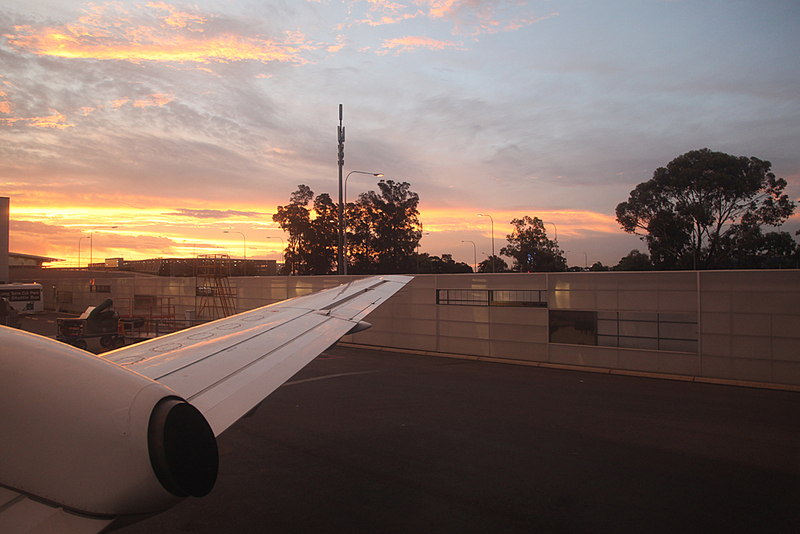 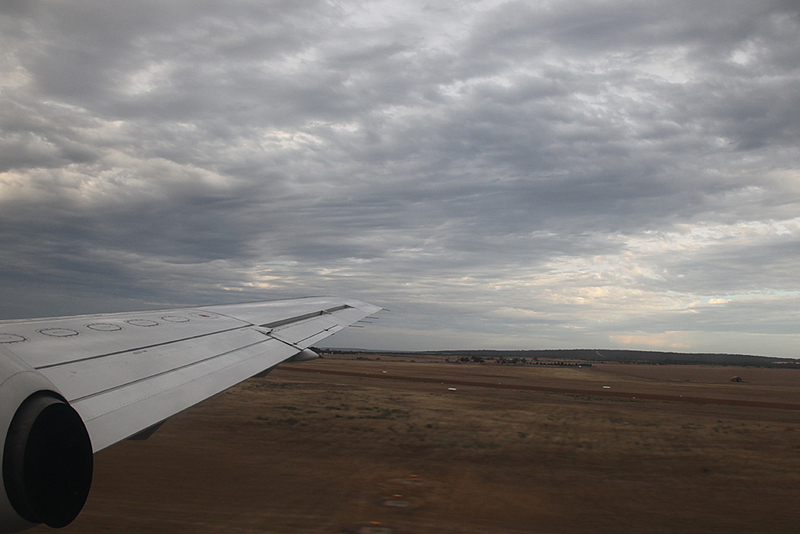 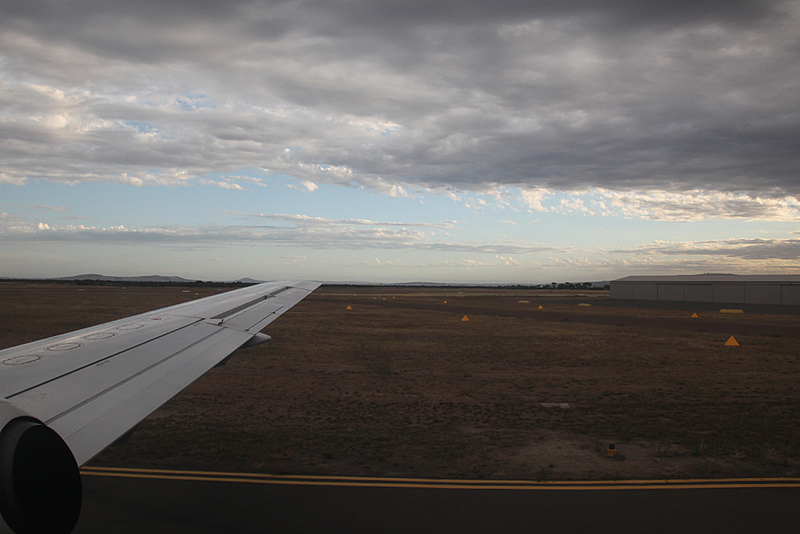 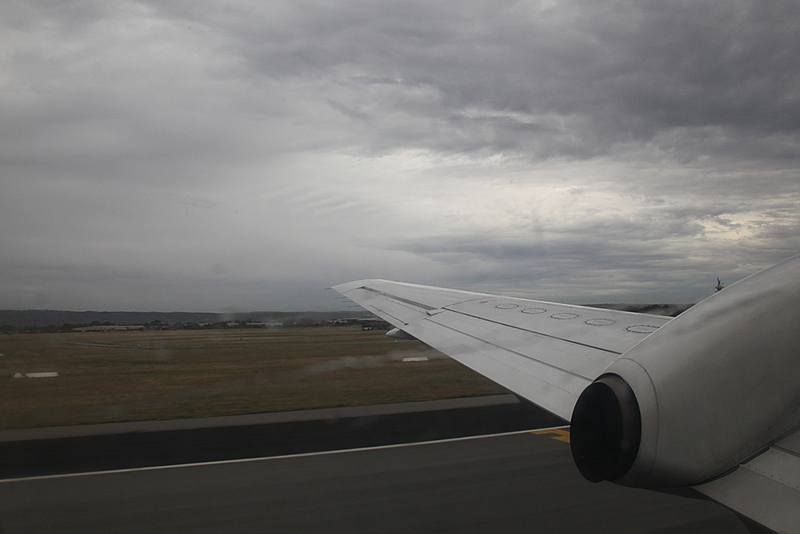 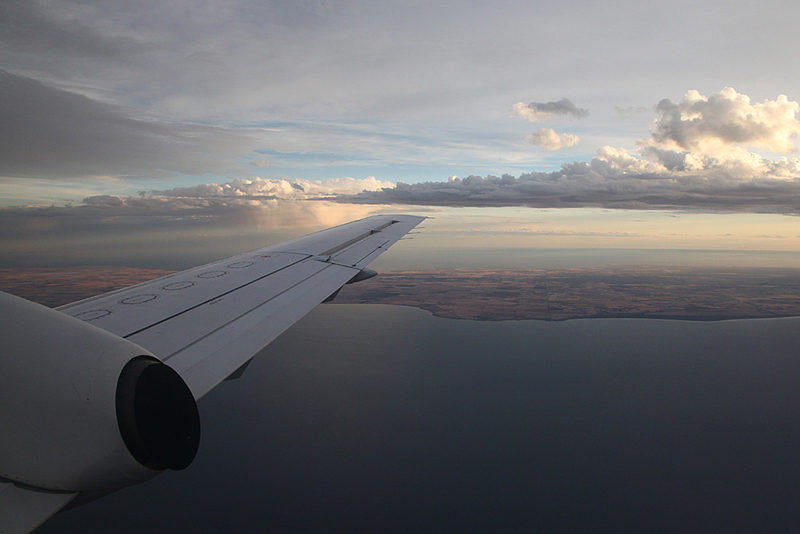 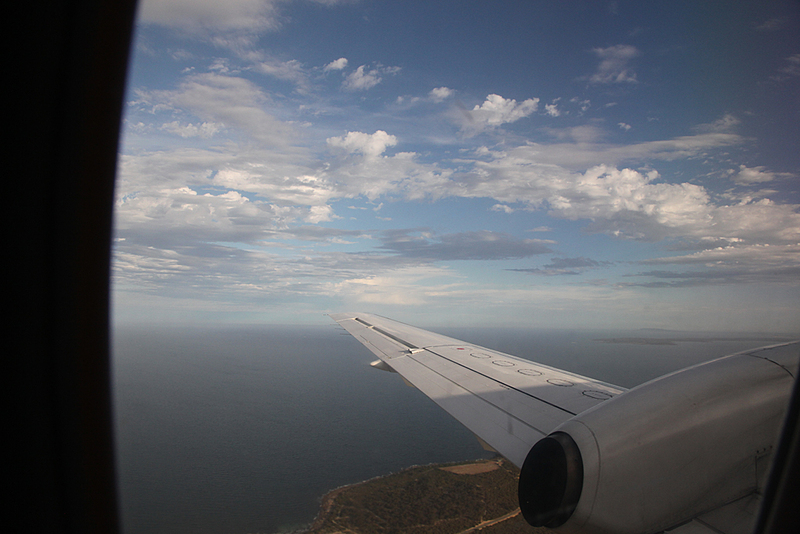 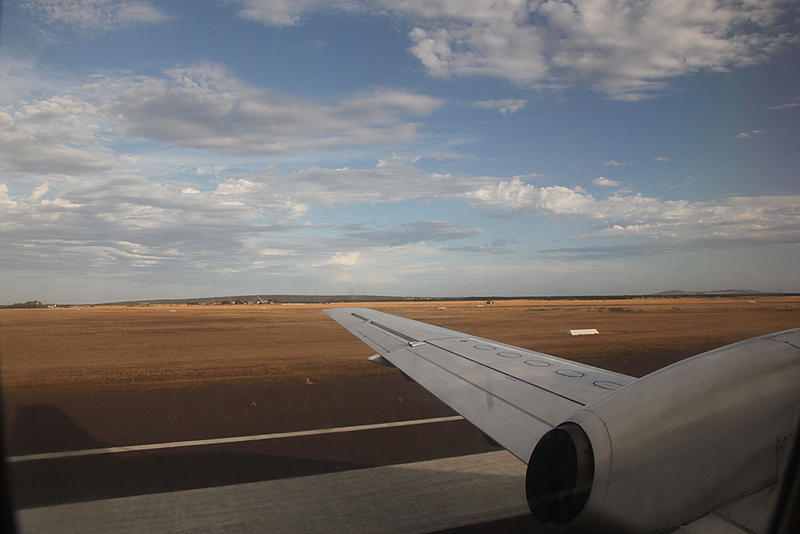 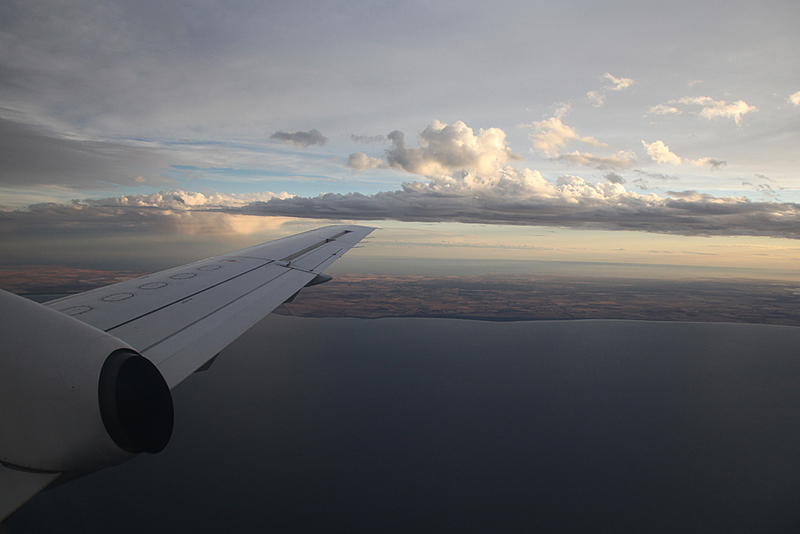 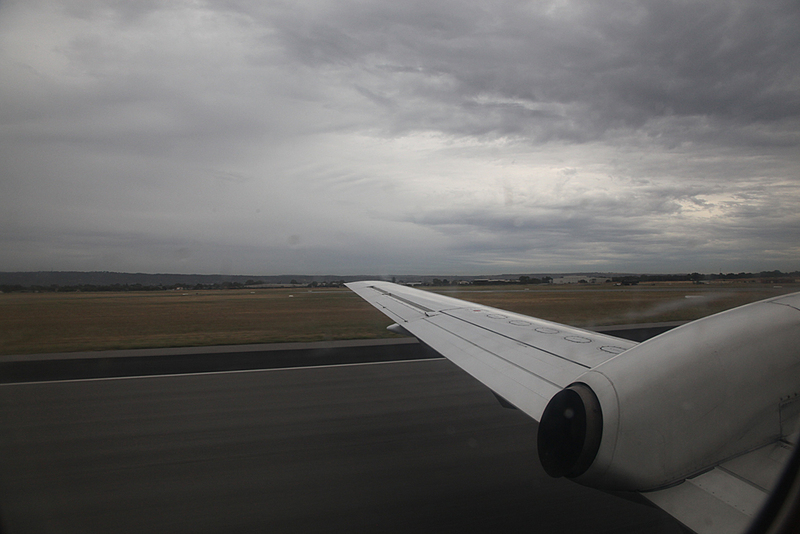 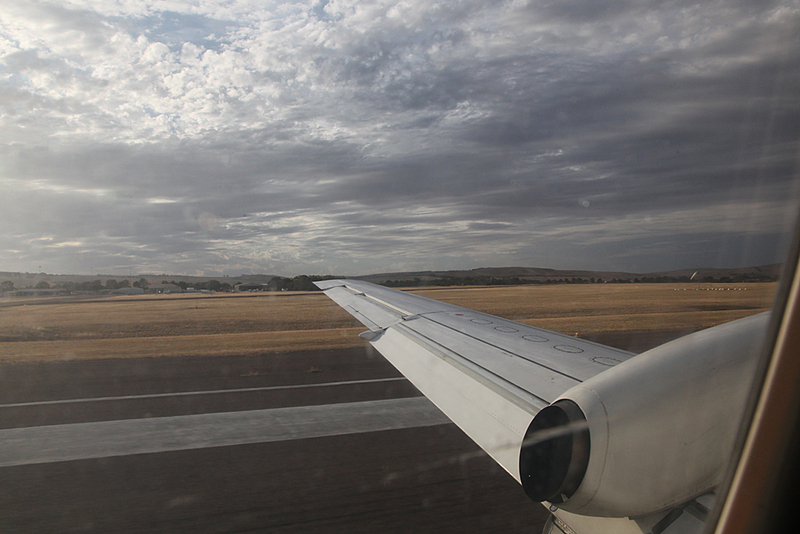 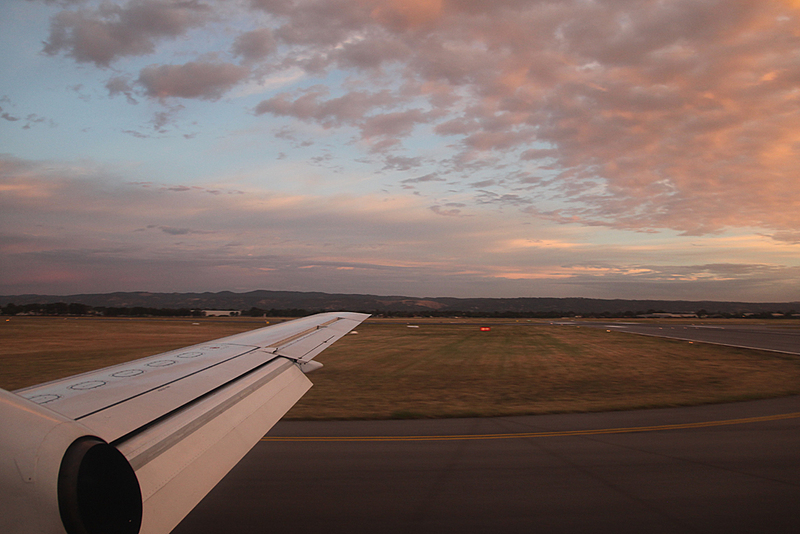 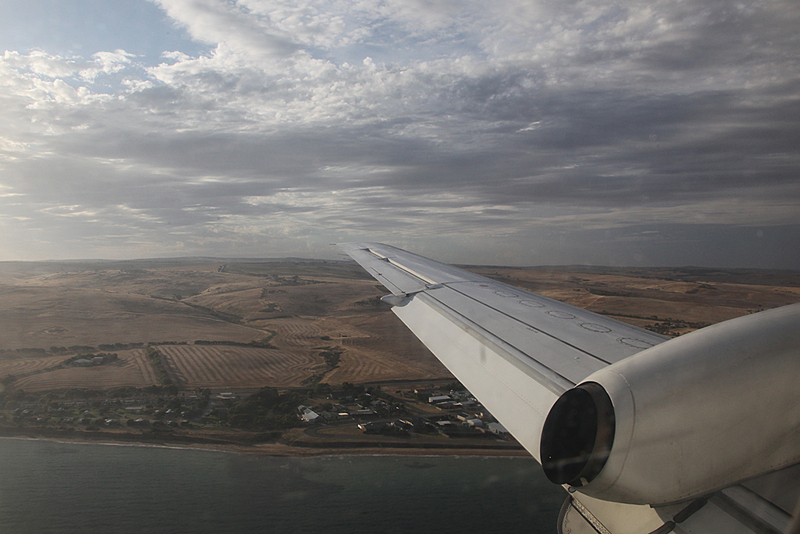 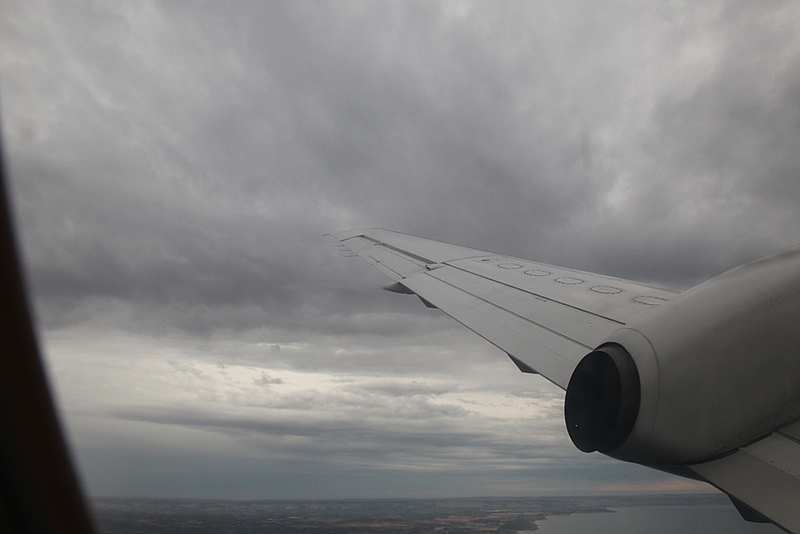 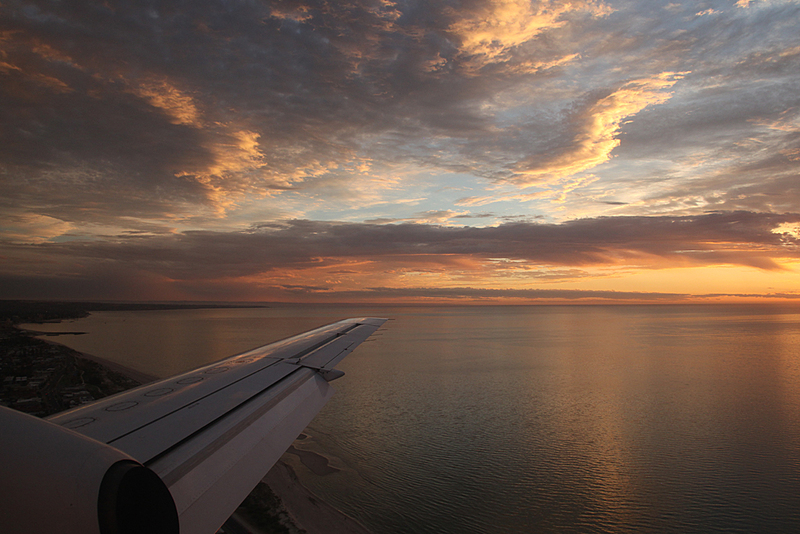 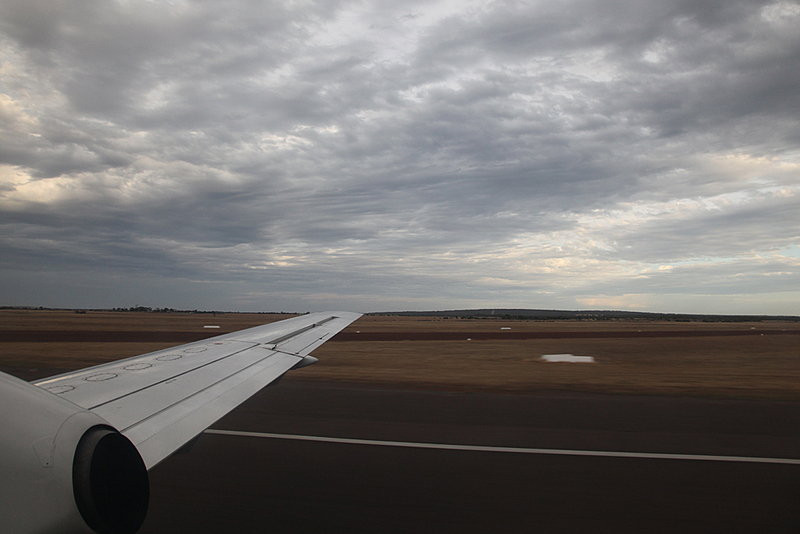 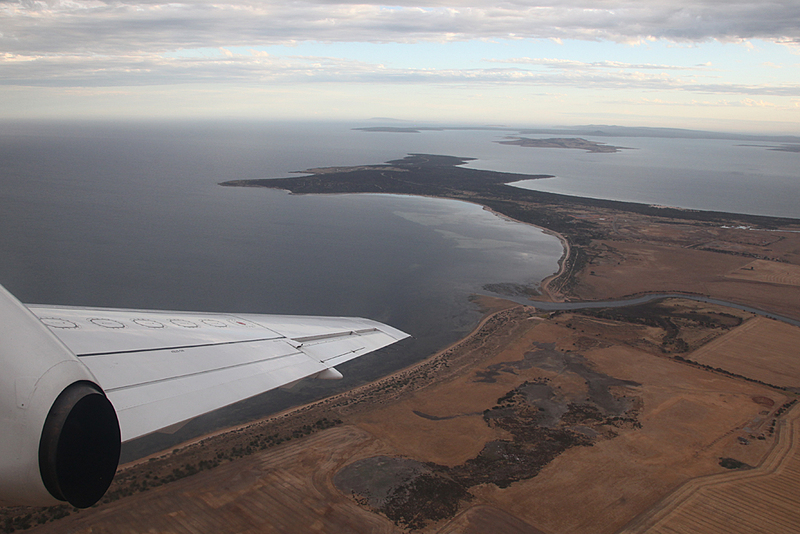 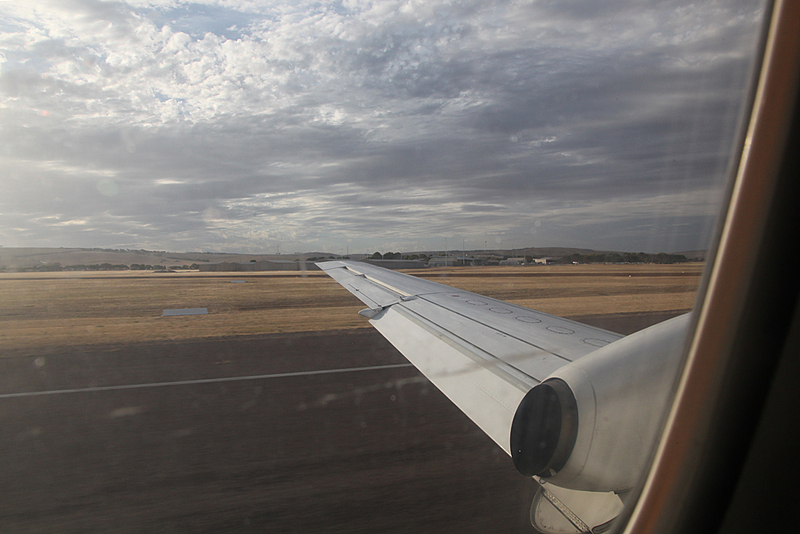 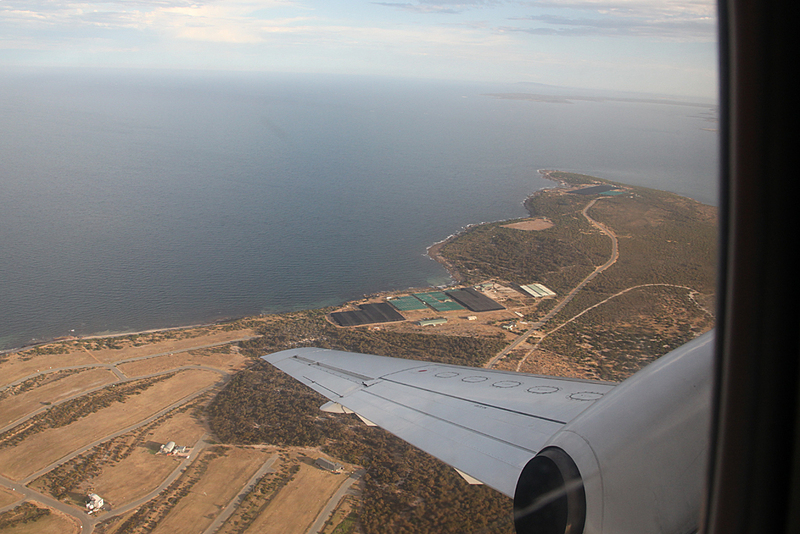 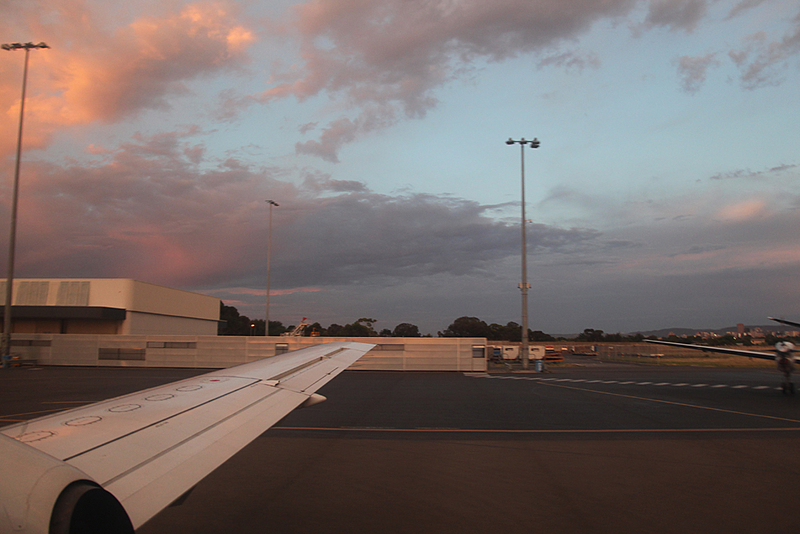 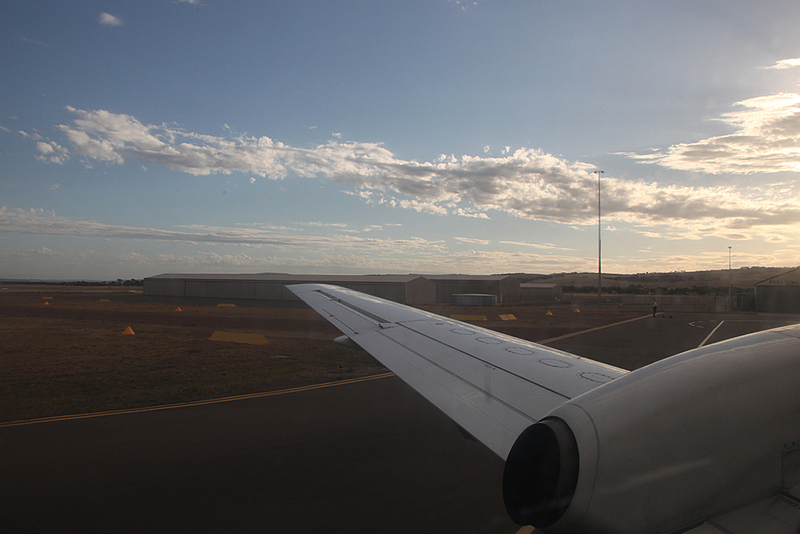 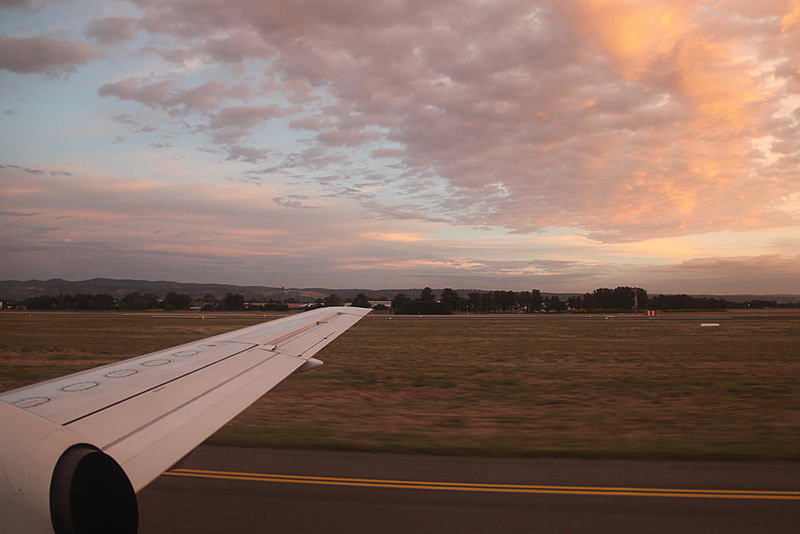 A powerful take off from Port Lincoln and the turbulence was a bit stronger in places this time. 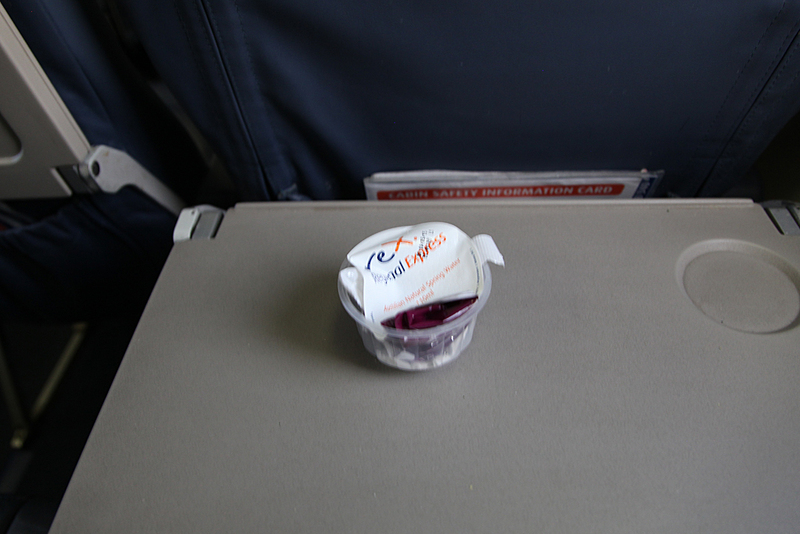 Same snack and water service as on the way over. 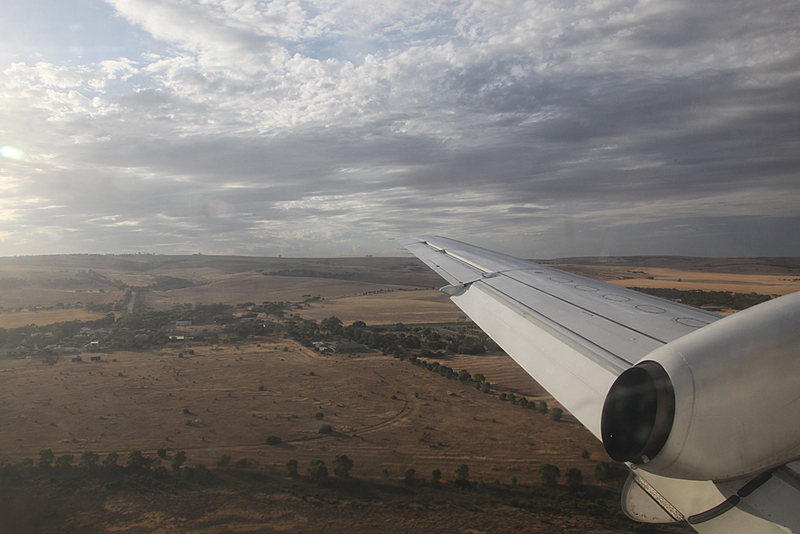 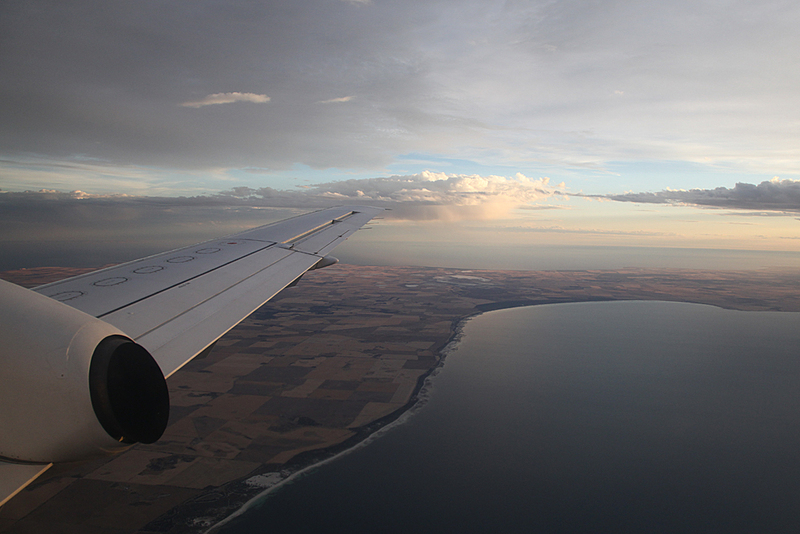 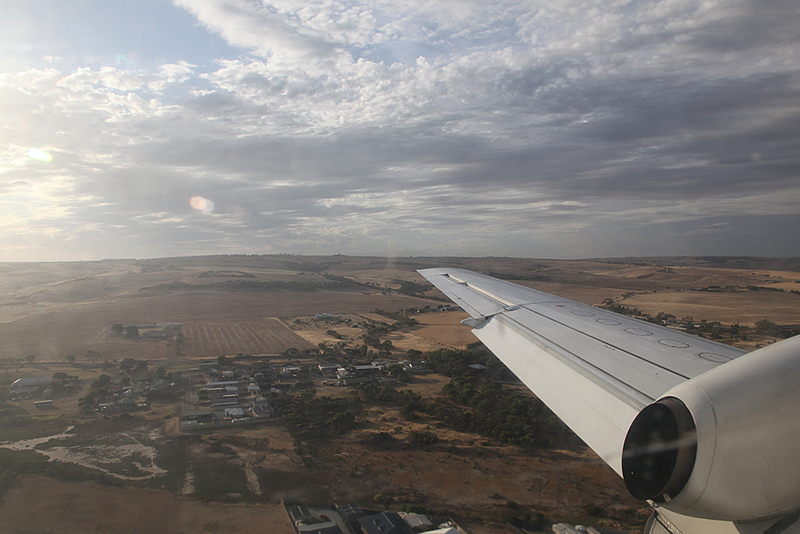 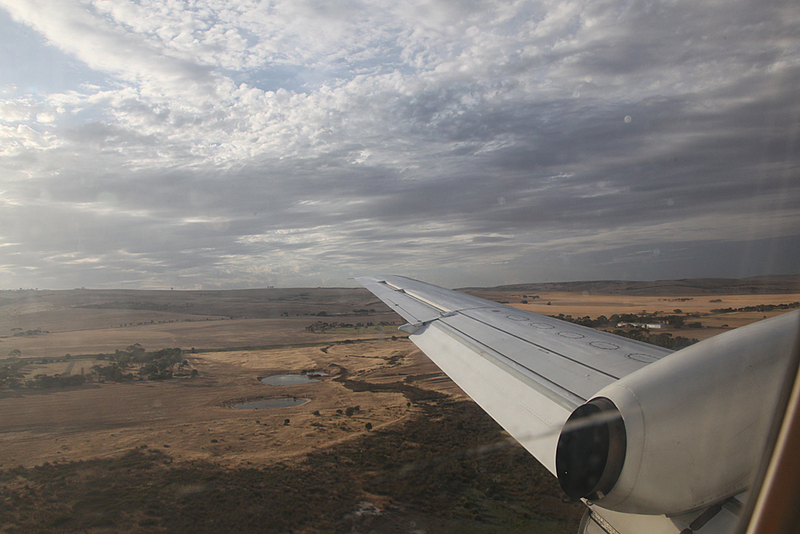 We were low enough to get a good view of Yorke Peninsula and a few towns like Minlaton were pointed out along the way. 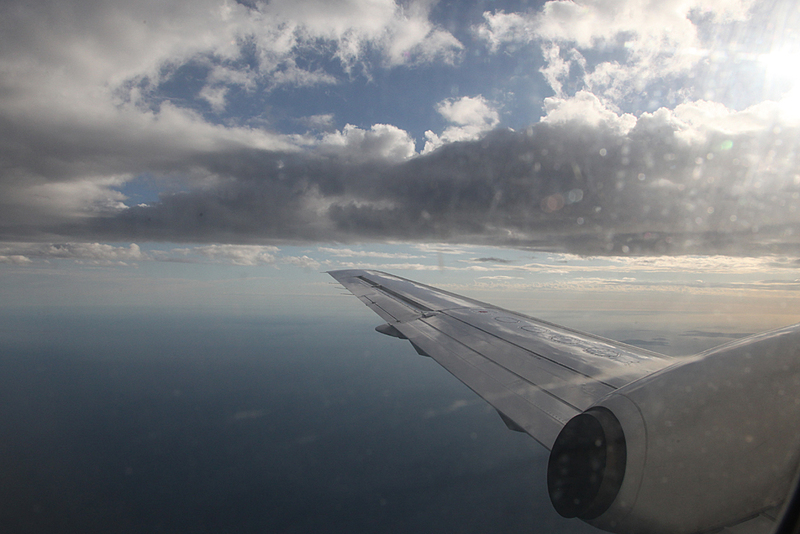 Again cruising altitude was about 9000 feet. 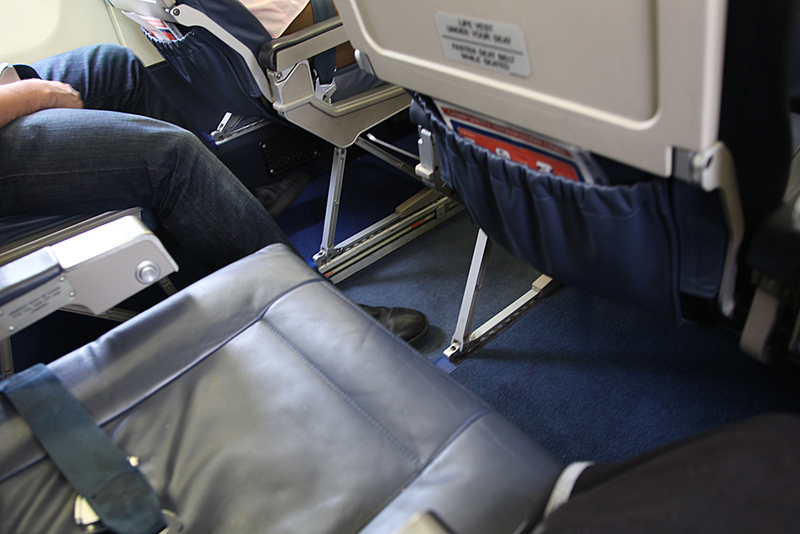 Spare seat next to me. 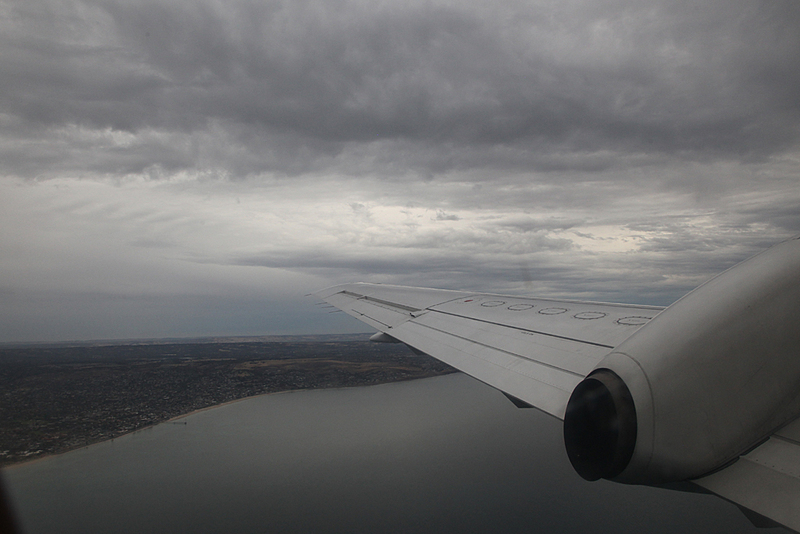 Very little turbulence on descent into Adelaide. 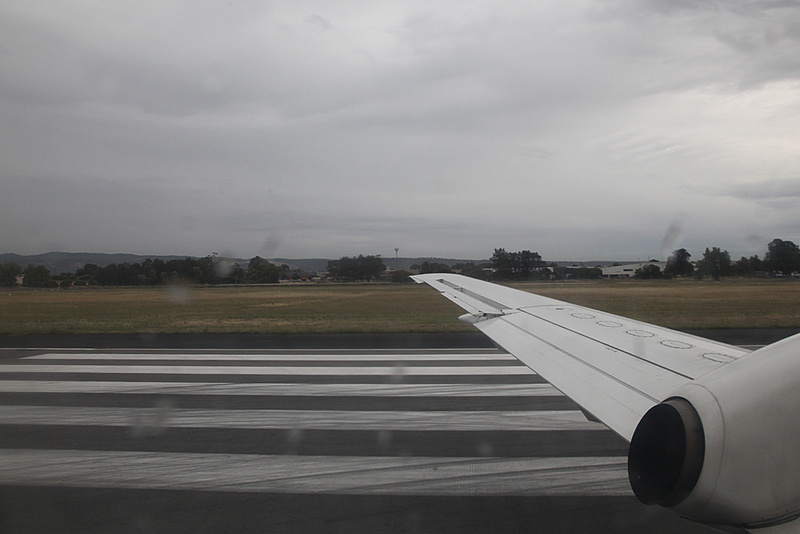 Landed on runway 12. 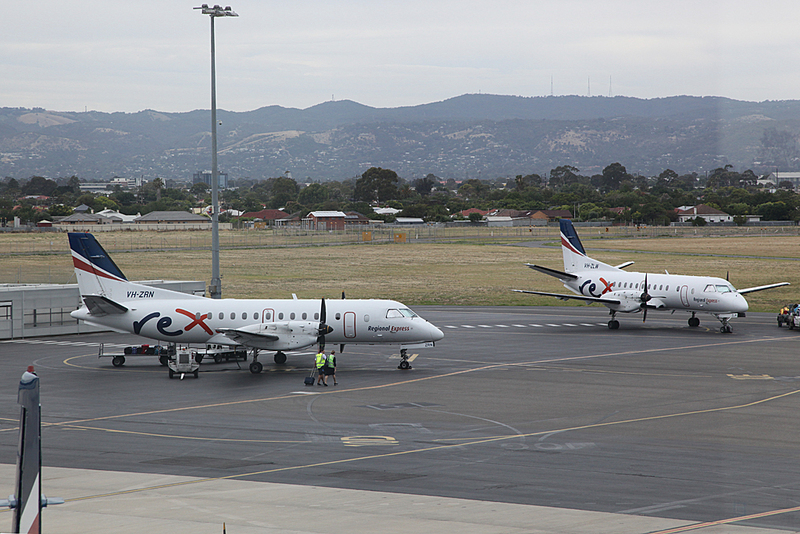 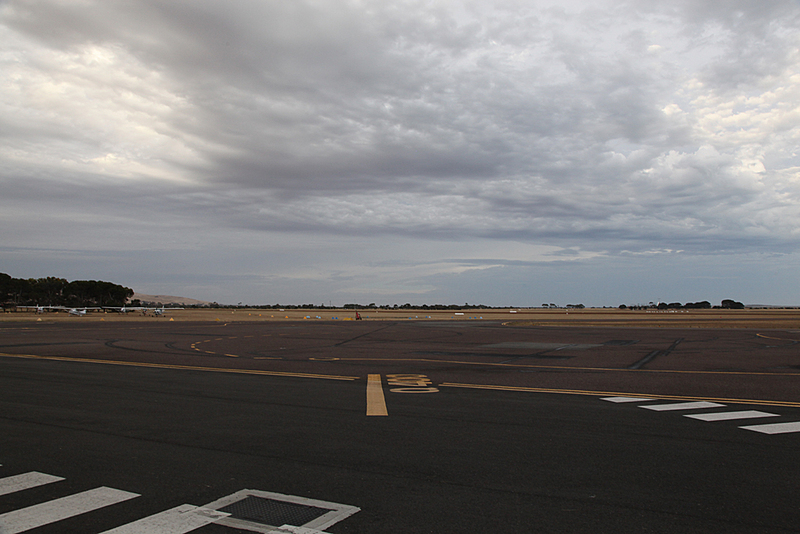 Many airports in Australia with intersecting runways employ a procedure called LAHSO Land And Hold Short Operations where aircraft operating on the smaller of the two runways at Adelaide can land as aircraft on the bigger runway are taking off or landing. 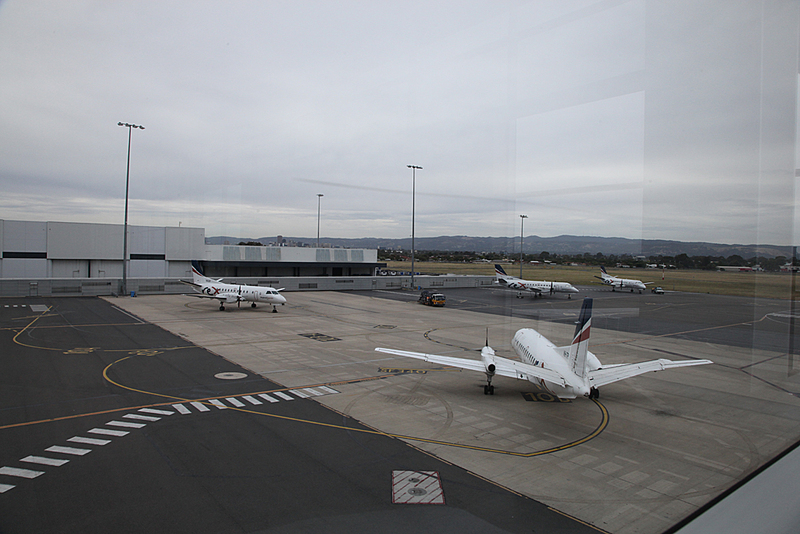 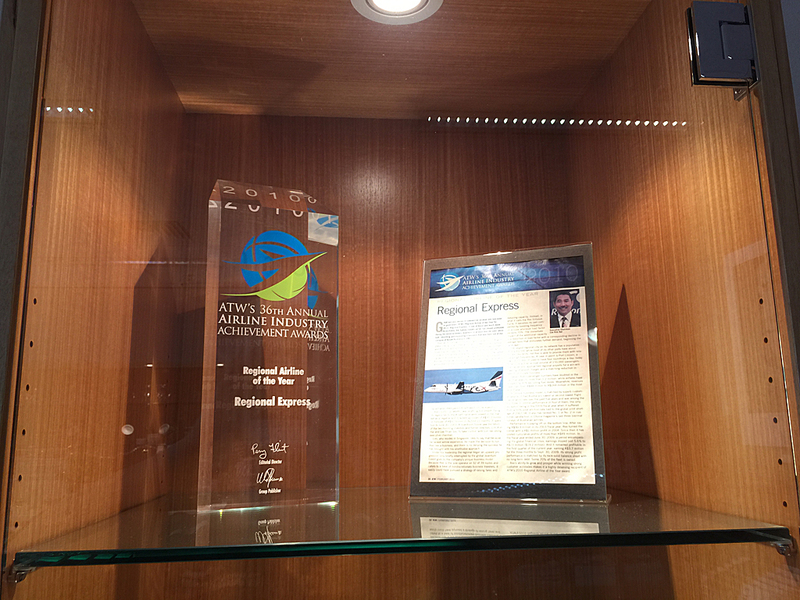 The idea being is to keep the airport moving. 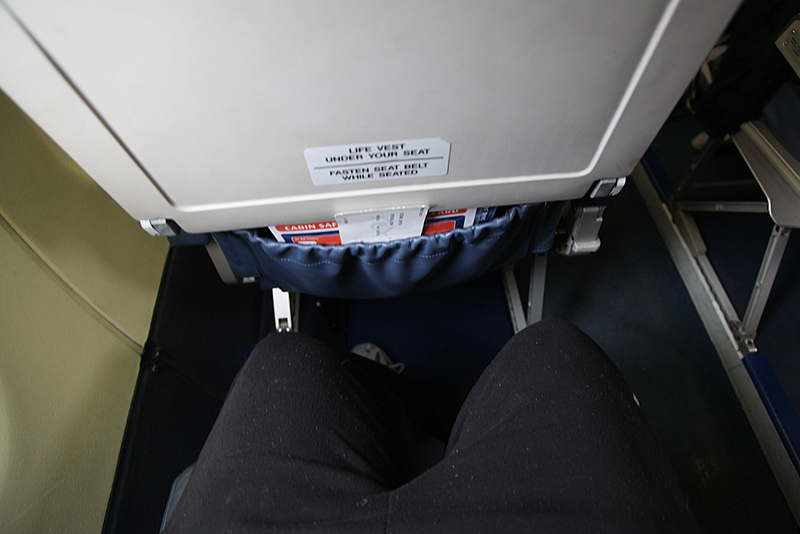 However, pilots have to be specially trained to do this. 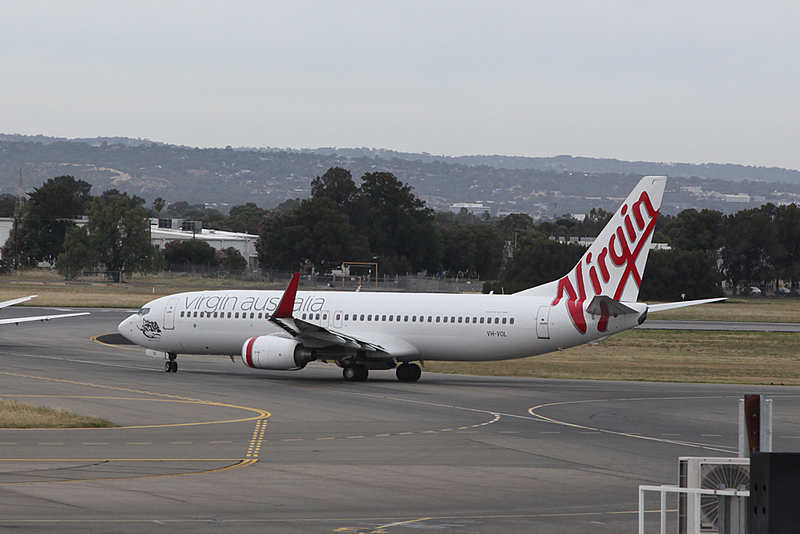 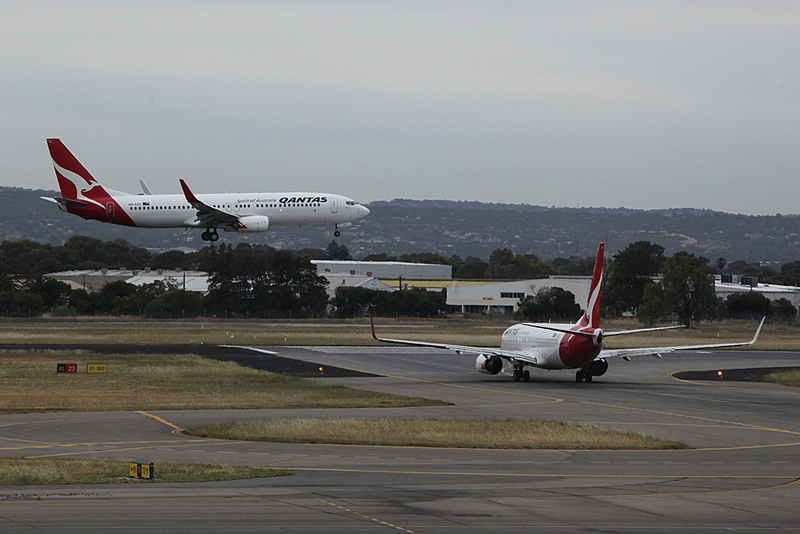 Note the Virgin Australia 737-800 landing at the same time as us. 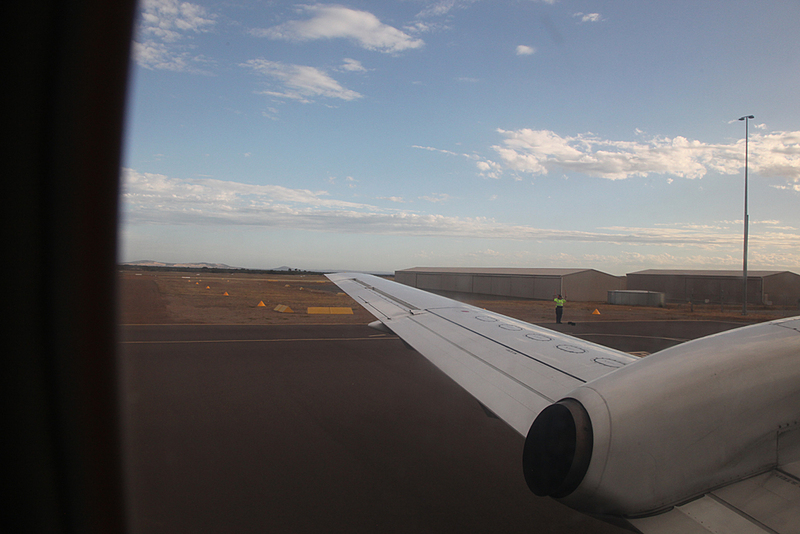 Again like in Port Lincoln, there seemed to be no great rush to get off the aircraft. 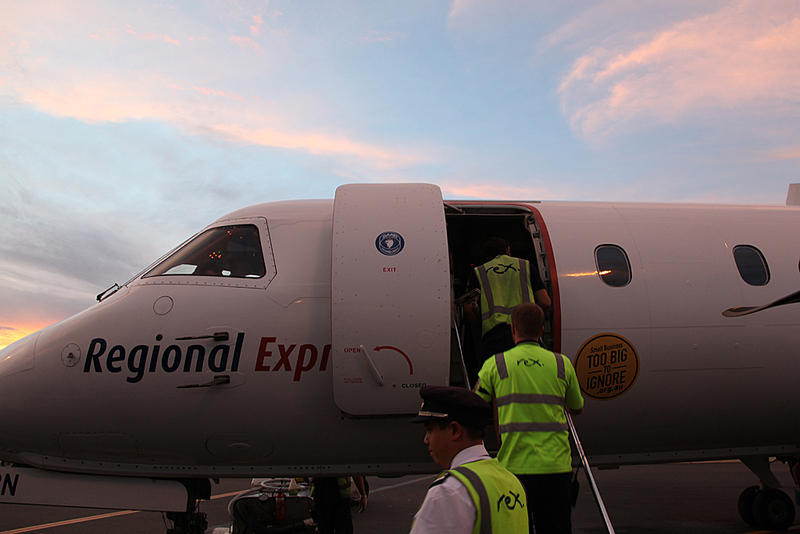 Like after my previous flight, a bus took us from the aircraft to the old international terminal where REX use it for arrivals. 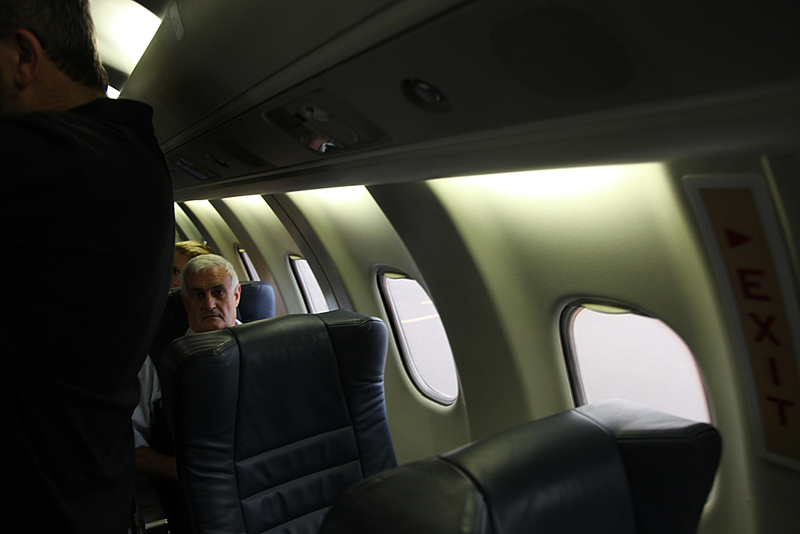 Pity you didn't see ZJS or ZXS!